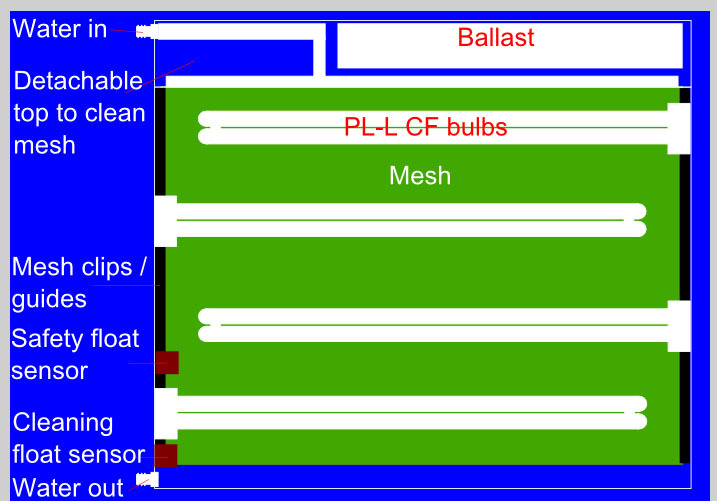 If less maintenance is a requirement, then you want an oversize screen; try 2X normal size, with 2X the number of lights. This should be able to go 2X as long before a cleaning is needed. 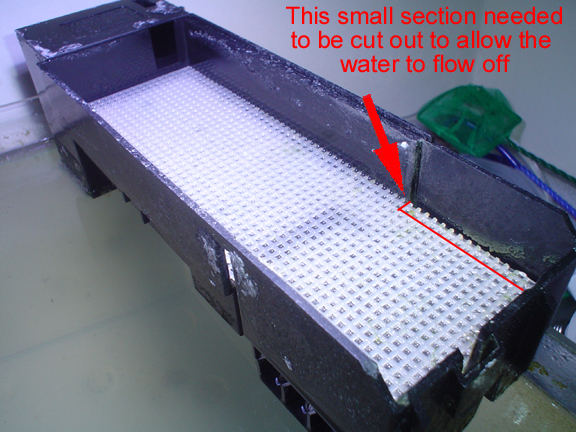 The limiting factor might be the pods; at some point they may make big holes in the algae (or not; you will have to test). This is a great thing for someone to try out. 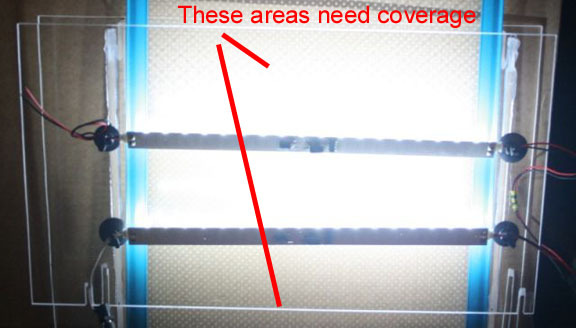 Just remember that the additional screen space will need the same lighting that the current screen has. 9/21: Thank you for the input Santa monica, I will definately be doing this on an expanded basis. 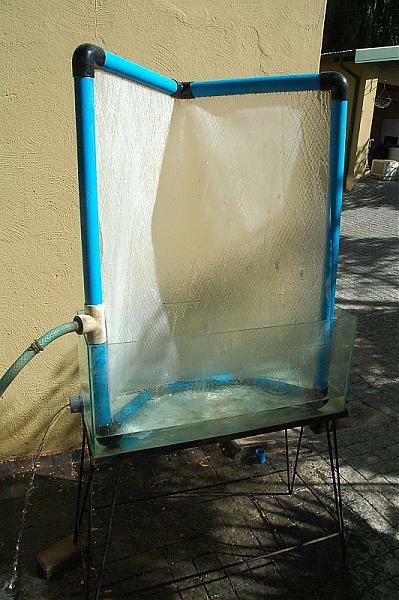 I think I will put a three ft tank in the sun and do what you've got on a slightly larger scale. 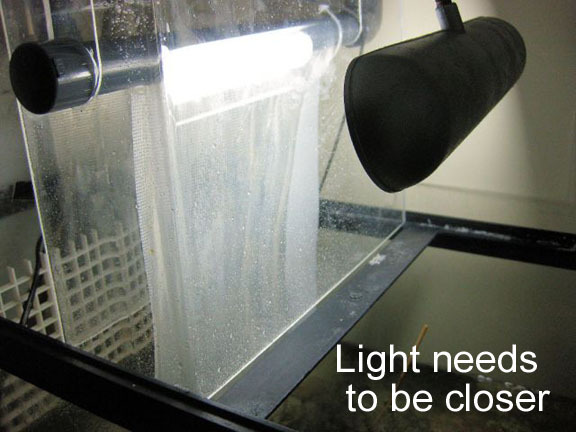 Great simple fix to an ongoing problem by most aquarists. 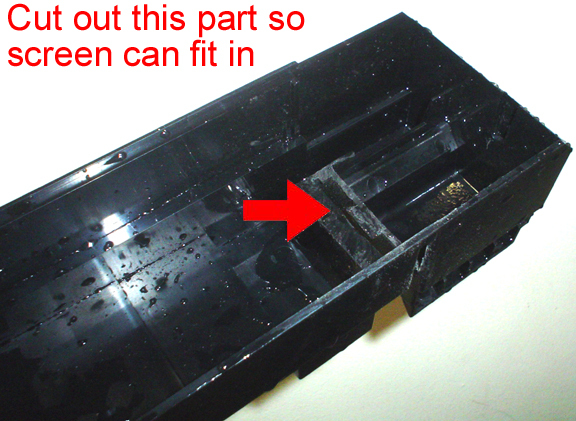 9/28: The film is plastic and gets wet totally. 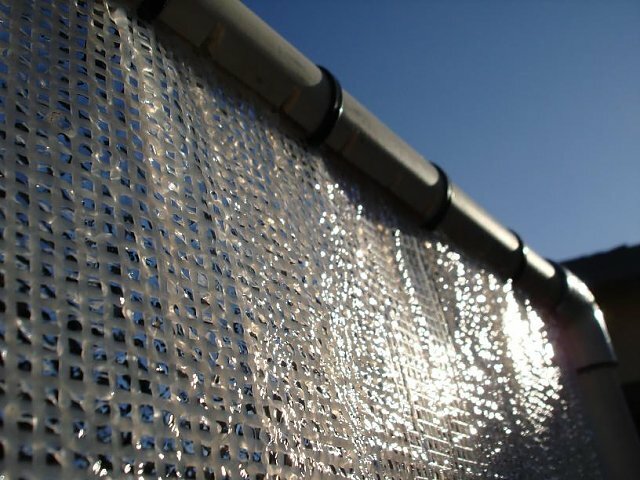 Its 1m x 1m in size. 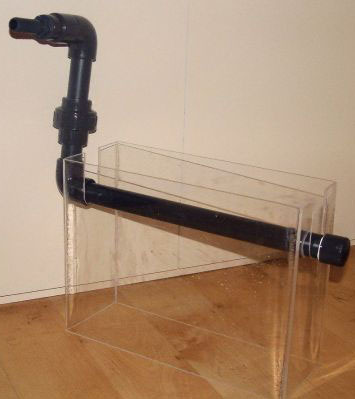 The water input is also the stand. 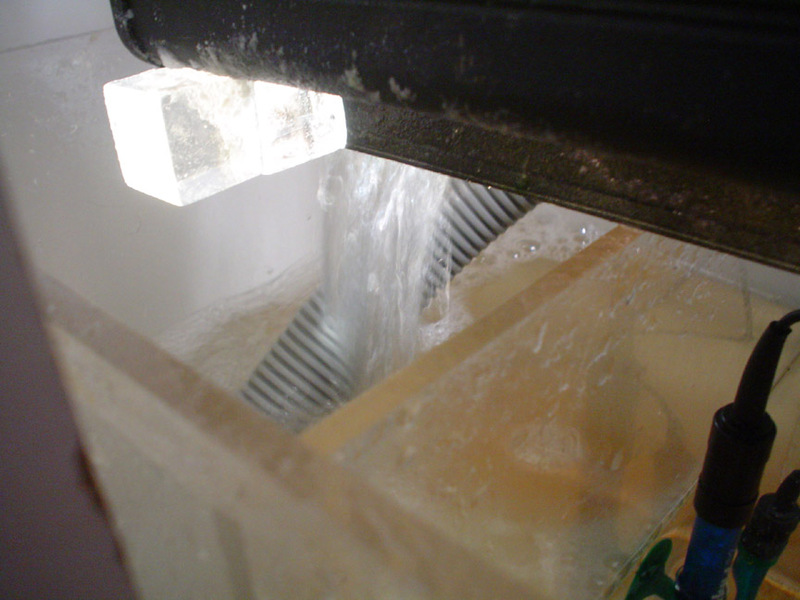 The strands run diagnally which makes the water flow very nicely. I'm happy with it and will let it stand in the sun. 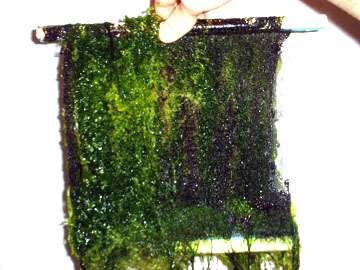 Hopefully get rid of the hair algae problem I have. You should see my actual tank to know why I jumped at this idea. The construction is so easy though. And if it works a quarter as well as Santa says it does, it will be like Christmas. 10/25: It worked like a bomb. Phosphates down to 0.02 - 0.01 ppm (this is on a hanna meter and is very low). Normal test would just read undetectable. [Previously] the best I ever got it to trying every trick in the book including Zeo and Vodka, Lanthinum and many other phosphate removers was 0.03. 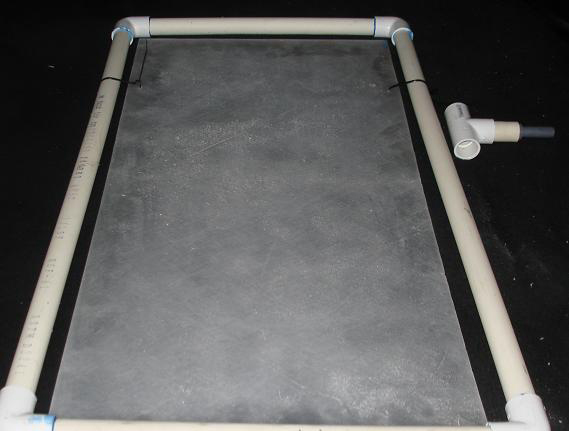 Blank screens usually start off with a light brown slime of diatoms, unless the water is really high in nitrate and phosphate, in which it might start with dark spots. 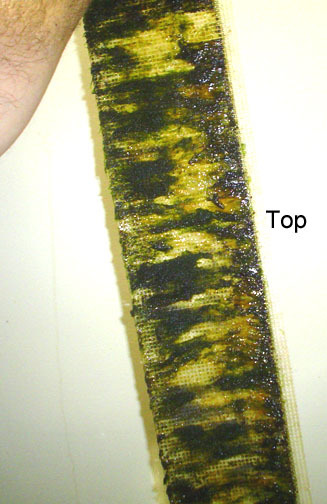 After a few weeks, green slime or green hair will usually grow. 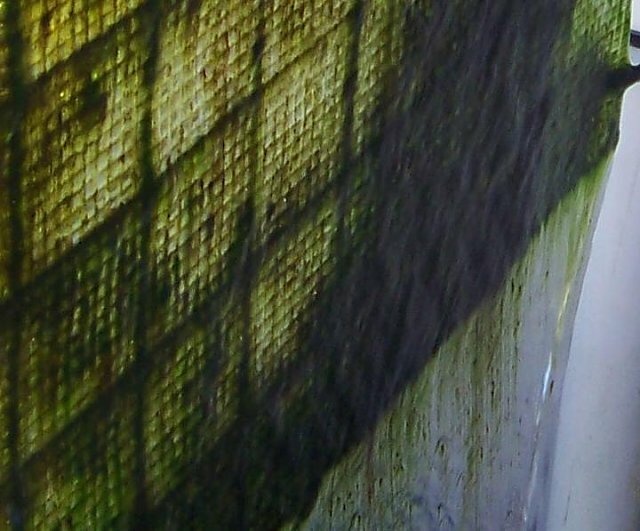 And from that point on, it will be a mix of brown and green, all of which is easily cleaned off. 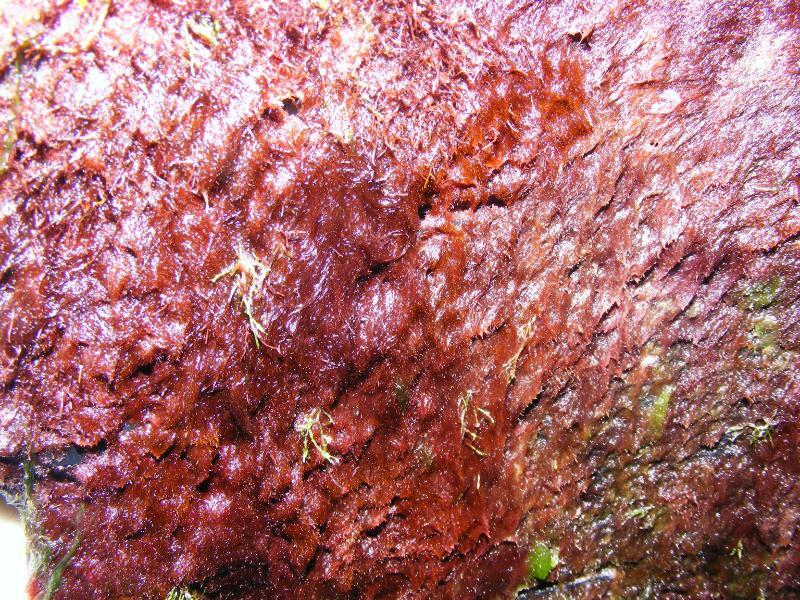 After a few months, however, and if you have enough light (and maybe pulsed flow), you may start seeing real red/brown turf, or possibly bright green turf. You'll know that they are turf because they won't come off no matter what you do, except with a razor blade. 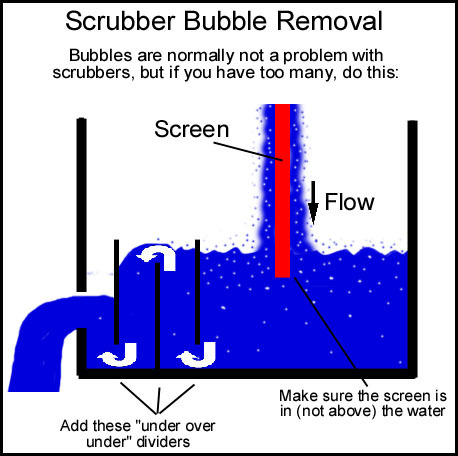 There should not be any bubbles if a scrubber is set up correctly with smooth flow into the water below. 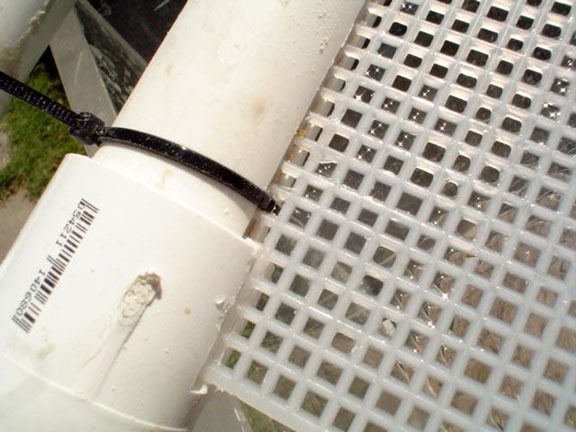 But if you have too many bubbles, make sure the bottom of the screen goes all the way down below the waterline, so there is no waterfall off the bottom, and design the scrubber with an "under over under" divider section like some people use in sumps. Corinna on the AC site: "Think we should just call you Santa!! 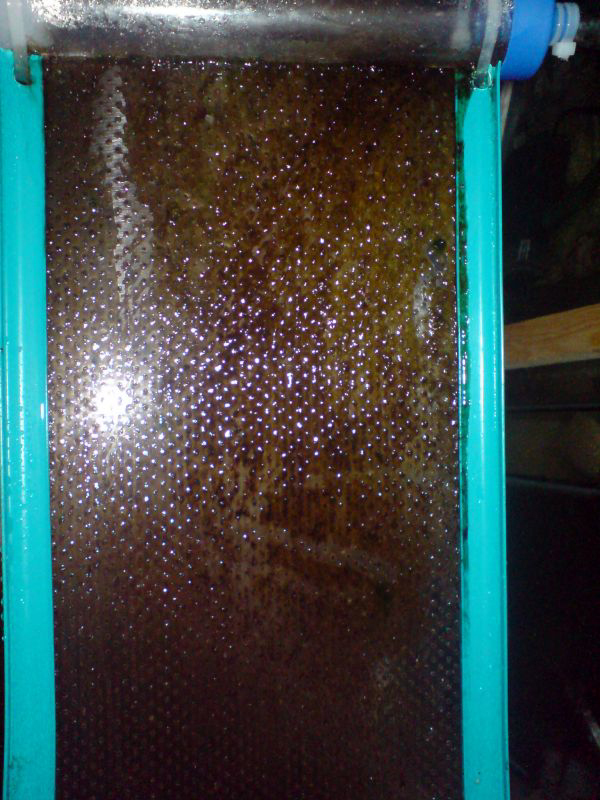 After 3 weeks my screen is forming wine red spots, the pods are having pod parties and making babies, the seahorses are noticeably gaining weight and the water is decidedly 'sparklier'.Thanks." jfdelacruz on the RP site: "Overfeeding does wonders! i dont know how and why but, the ATS seems to be an extra 20 gallons for my tank because even if I overfeed, nothing in my tank seems to be going bad! 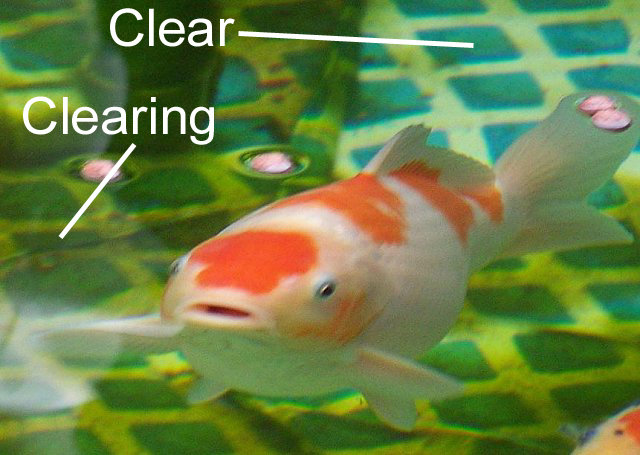 water is always crystal clear too! (I do have seagel in there running for about 2 months already) this ATS is a blessing." 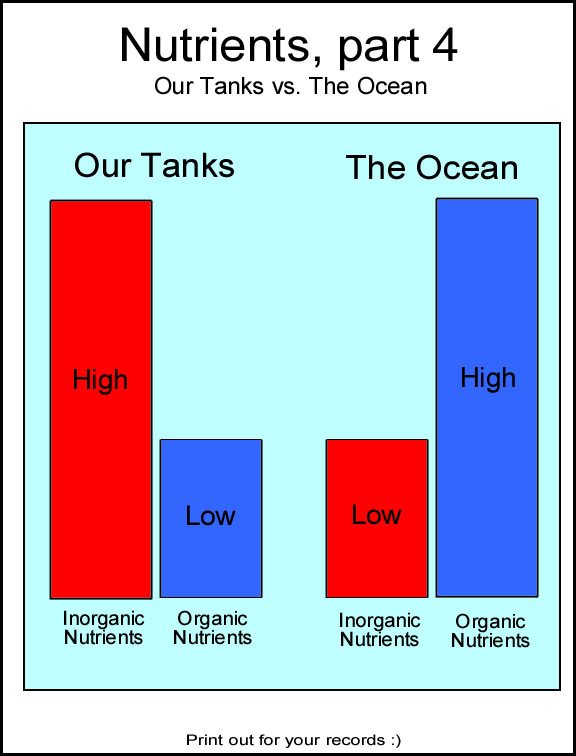 Our Tanks: High Inorganic Nutrients, Low Organic Nutrients. 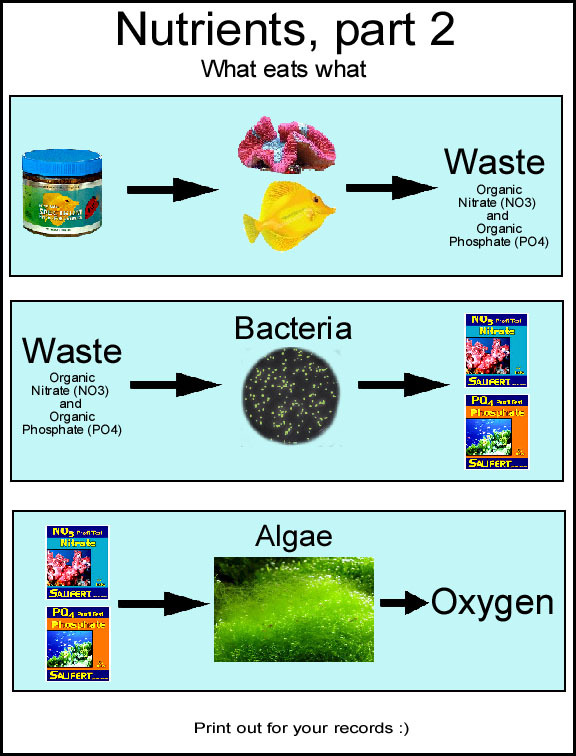 The Ocean: Low Inorganic Nutrients, High Organic Nutrients. 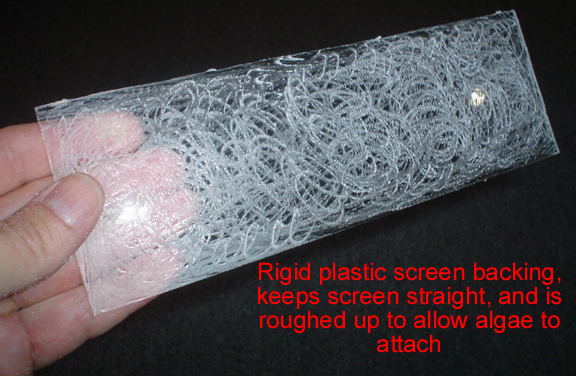 If you are not home, however, it becomes a question of which you lose first, your screen or your whole display. Long term (days) you are going to lose both, so we'll look at short term (hours). 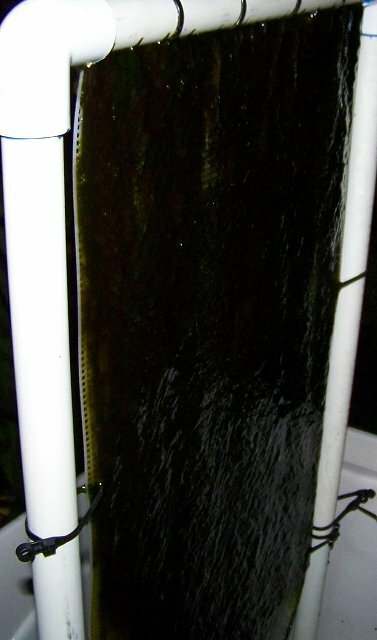 Somewhere in-between is the question: If you are not home when the power goes out for 2, 3, 4, 5 hours, etc., then how much of your screen will you lose, and how much of the nutrients will be "released" back into the water? 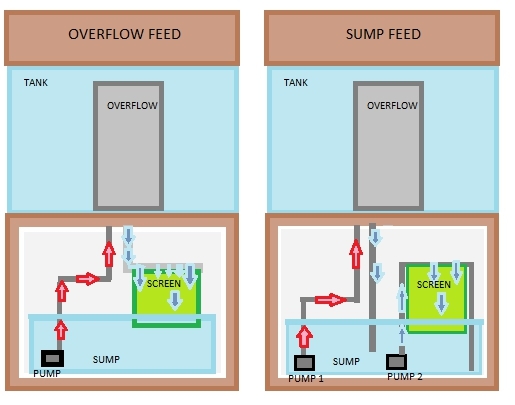 Well, most screens are designed to be up and out-of-contact with the water, so there will be zero "release" of nutrients during the power-outage. 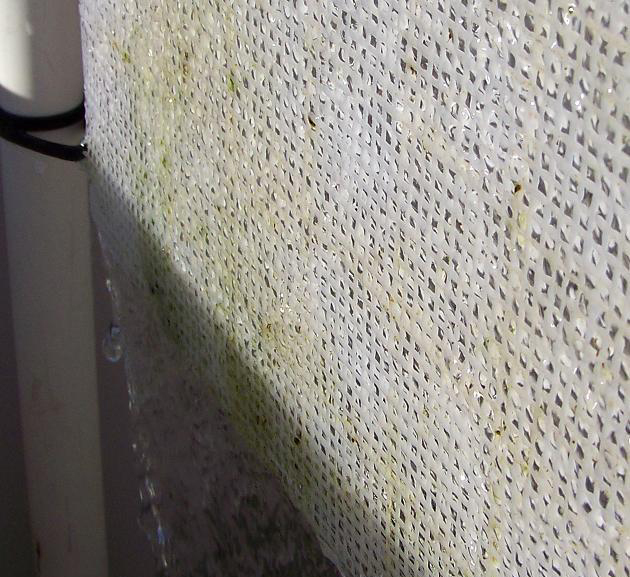 And floating screens that stay in contact with the water will not die or release nutrients at all in a short-term outage, because they stay wet. So immediate release of nutirents is not a factor in any situation. The real question is long term loss of filtering, i.e., how much of the screen will die off during the outage. 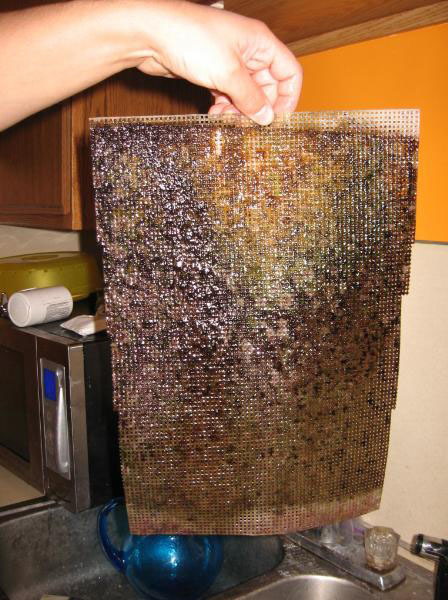 When you get back home, the screen has been drying for a few hours, but is still moist. 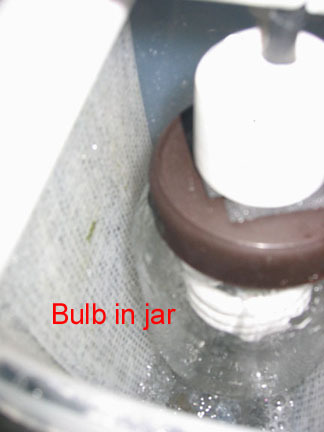 What you do is put it in your sink with water and give the dead parts a chance to fall off. 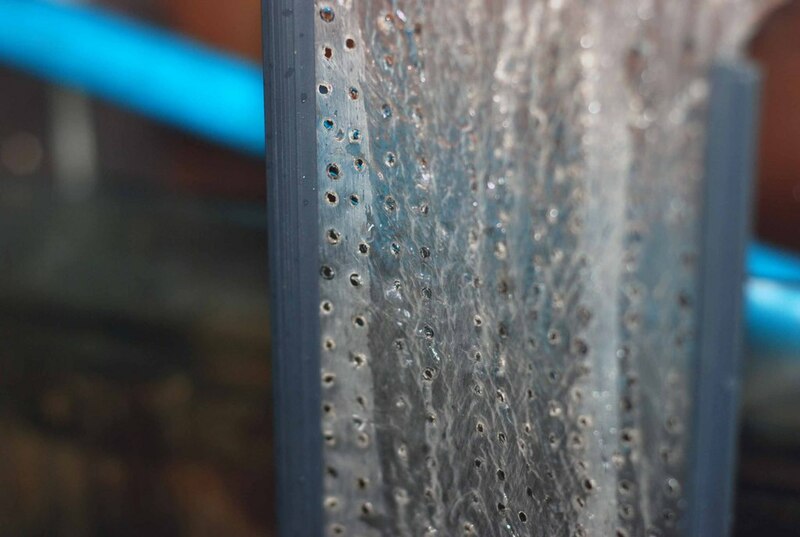 Not sure of how much time is needed, but just do a regular cleaning of the screen every few hours until it seems that most of the dead stuff is removed. 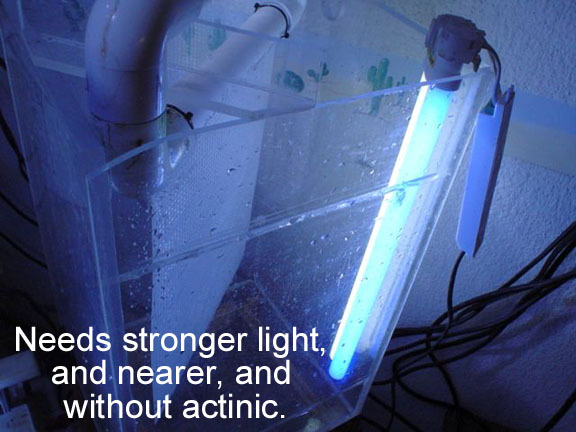 Doing this in the sink will prevent any nutrients from getting back into the tank. 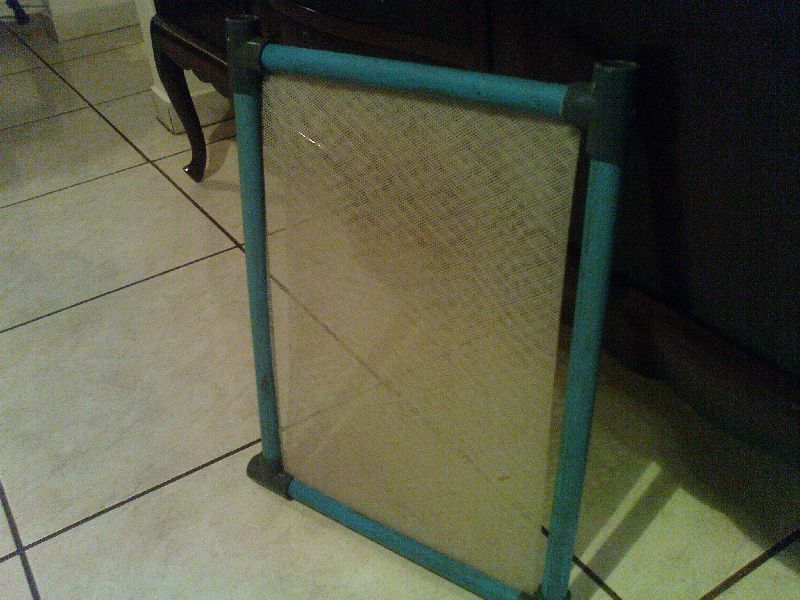 You then put the screen back into operation, and it's no different than if you just did a regular cleaning. And this is the worst case. I myself unplugged the wrong plug once and left the screen 6 hours with no flow. 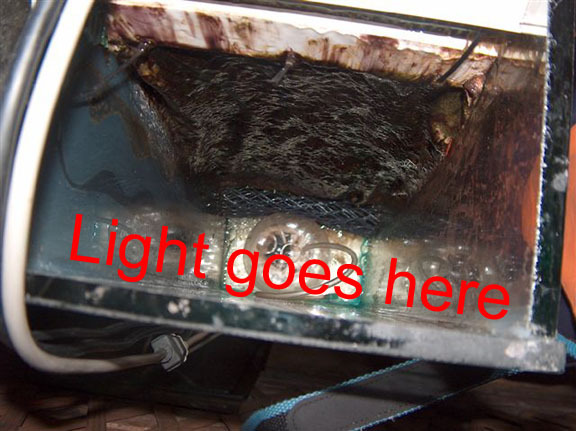 The fan was still on, but the lights were off at the time. It was all still moist, yet a bit hardened. 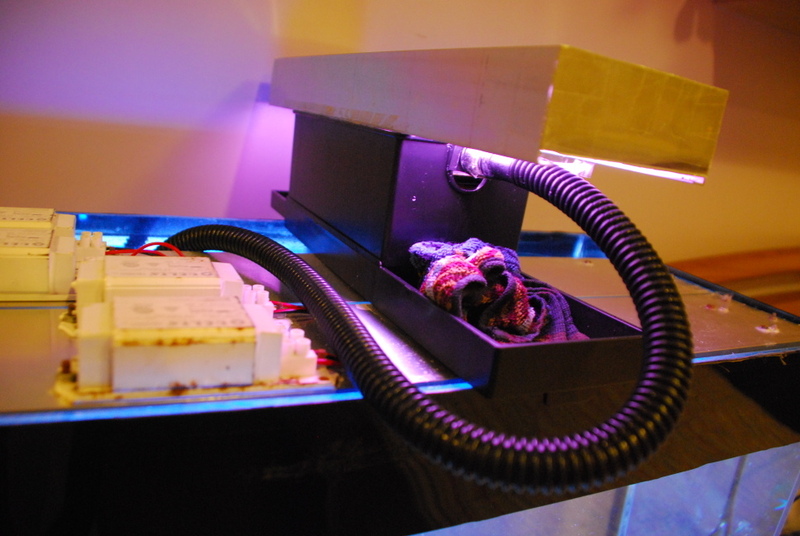 I did not think at the time to remove the outer layers of dead stuff, so I just put it back into operation right way. What happened was the next day or two there was a very slight increase in N from zero (clear Salifert) to a very slight pink; probably got up to about .5 or 1. P did not ever increase, however. And this was without properly removing the dead stuff. So overall, I don't think power outages are really that eventfull for scrubbers. 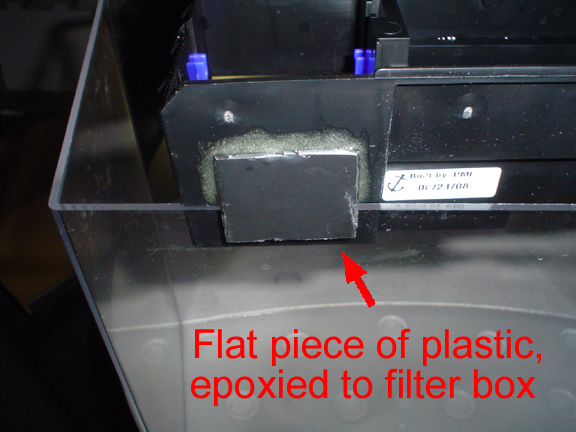 "jski711" on the RS site: "the last phosphate test I had done at the lfs it was undetectable on the hanna phosphate photometer, and I only have the one side of my screen lit for now!!!" 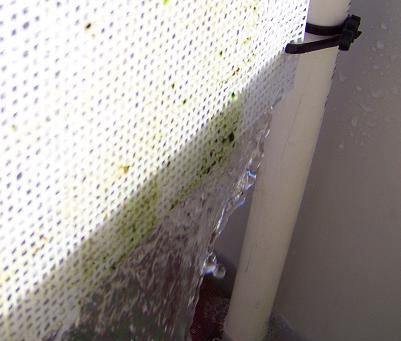 "col" on the UR site: "Todays tests are P = 0.03, N = 5. the algae looks the same, green slime. 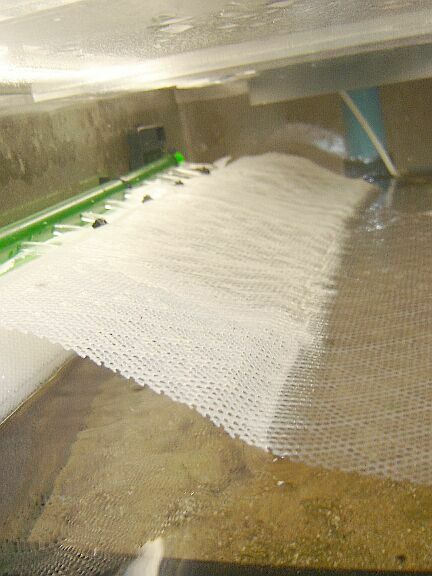 Skimmer is still running 24/7, feeding 2-3 times a day for fat fish. 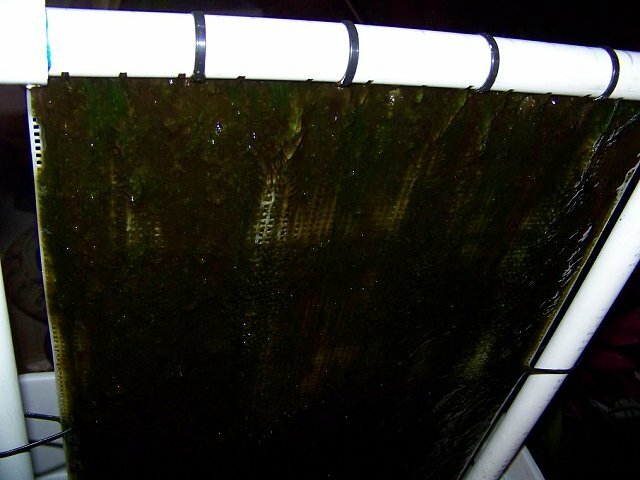 Algae on the rocks is subsiding, and water conditions have never been better." 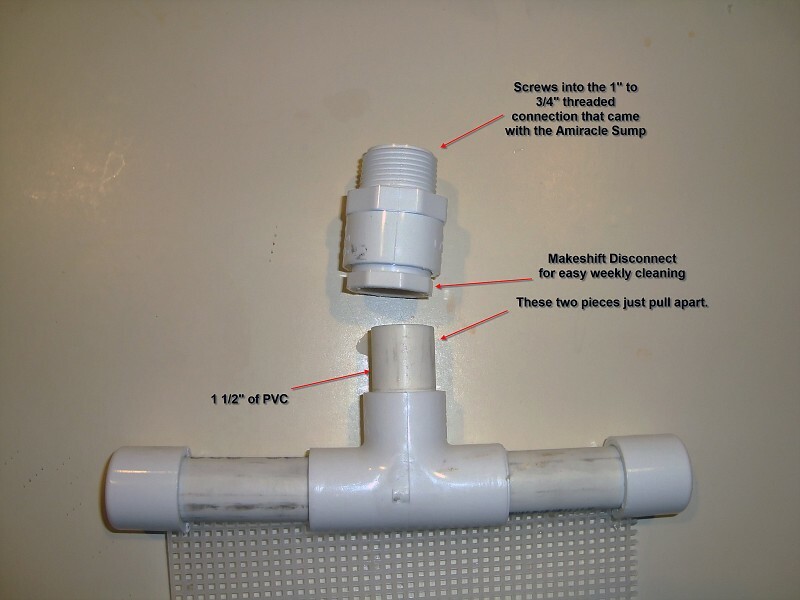 Here's a note to anyone who would like to start building and selling scrubbers. 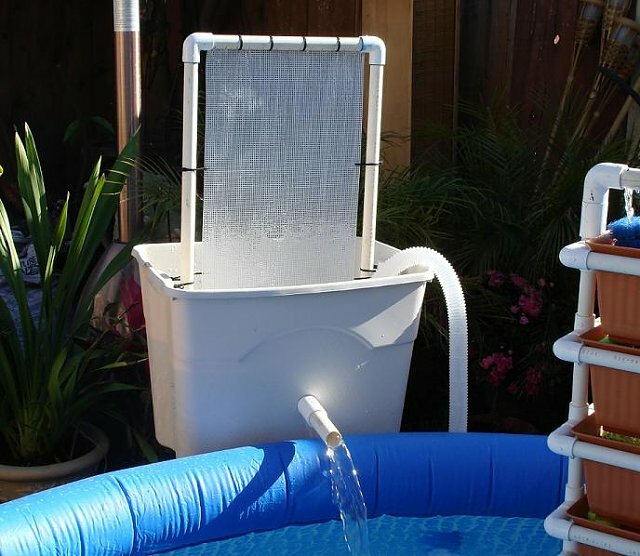 I think there are plenty of people who would like to buy one, but they don't have the time or ability to build them (there are several of these on every thread I'm on, who have asked me to build one for them), or they don't even know scrubbers exist but could use one. And currently there's no place to buy scrubbers. 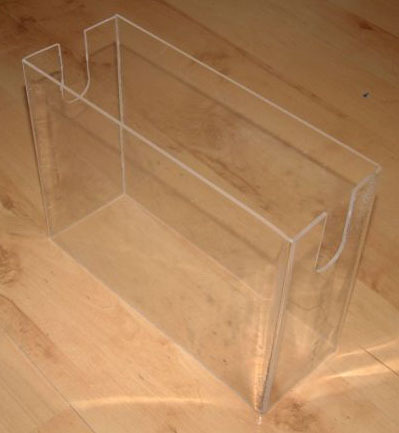 So it's a good time for you to put some buckets, acrylics, or sump screens together and offer them for sale, starting out by advertising on this forum. 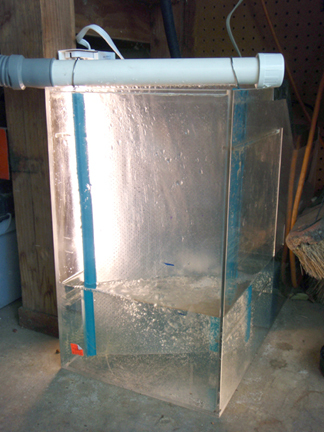 I recommend that you start out selling buckets or sump screens, instead of acrylic units. 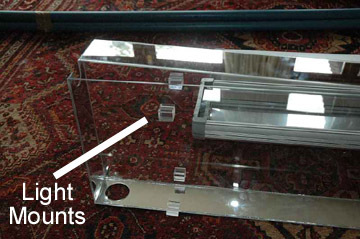 The price of an acrylic unit is going to be much higher, and most beginners are not going to jump in and pay the extra money for one. 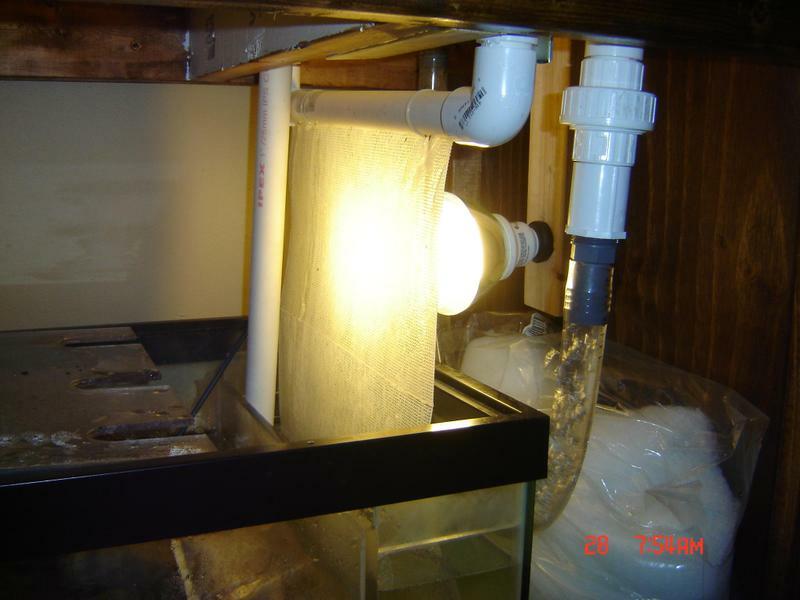 Keep in mind that most folks buy small less-costly tanks first, and move up from there. That makes them feel safer, since they have less to lose when starting. 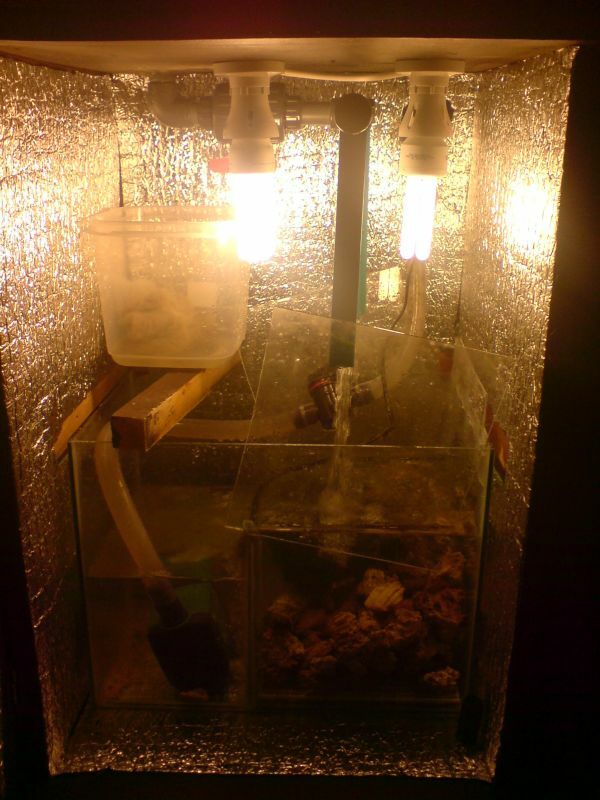 Once they become comfortable with their small tanks, they get bigger ones for more money. 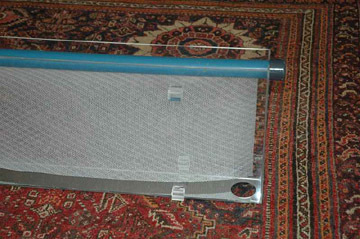 This is how you shoud approach scrubber sales; small and cheap first, and then go from there if they are happy. 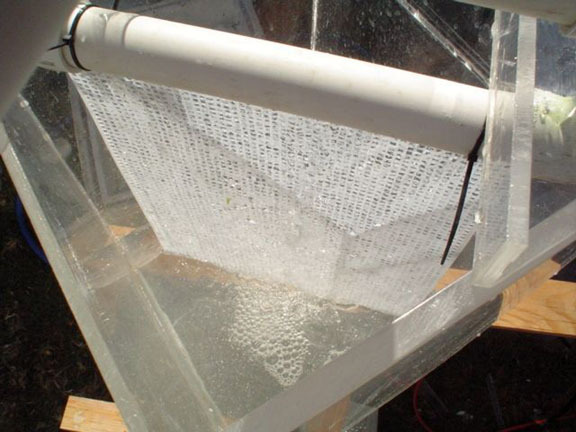 Since the bucket version is not very beautiful, it will just be a product for people who have nuisance algae problems in their tanks and they just want to try anything to get the algae out. 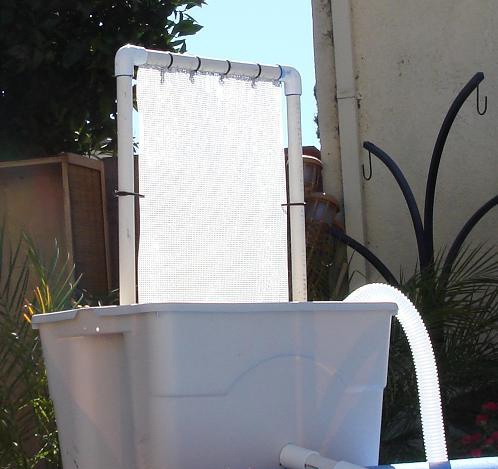 They might even view the buckets as temporary; they can use it until the algae is gone, then put it in the closet or lend it to a friend. 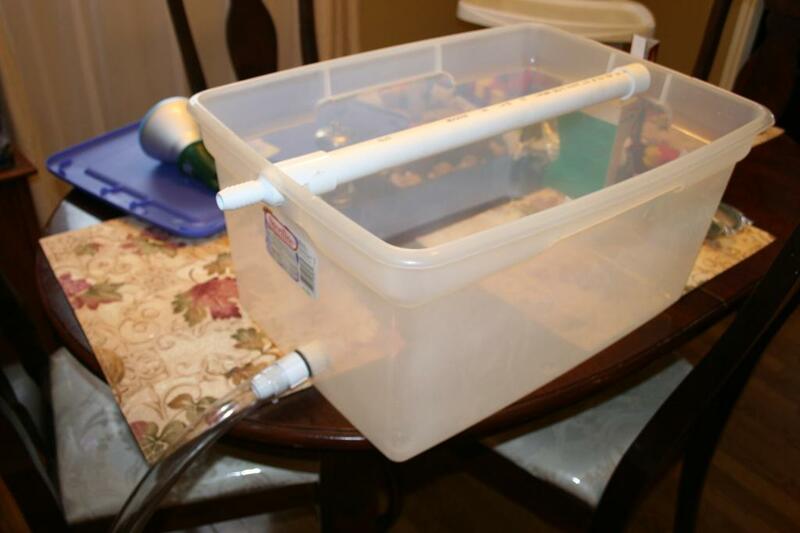 The bucket version is certainly a good version for you to start with, especially by mail order, since it's self-contained and does not need elaborate installation at the customer's house (they just drop the pump in the tank/sump, and go.) 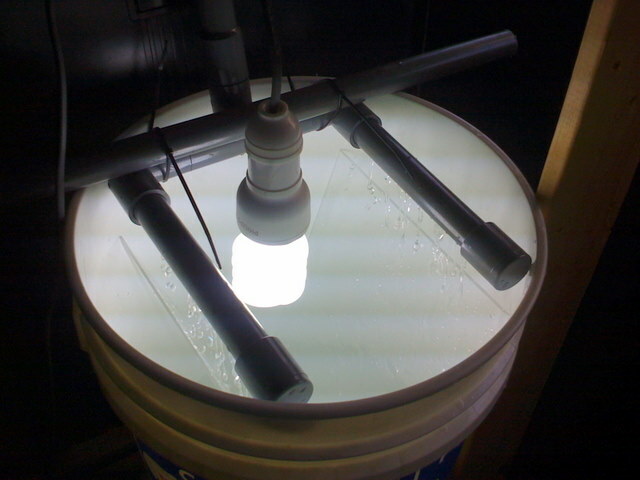 And very important: The bucket can be used as its own shipping container, with it's own lid. 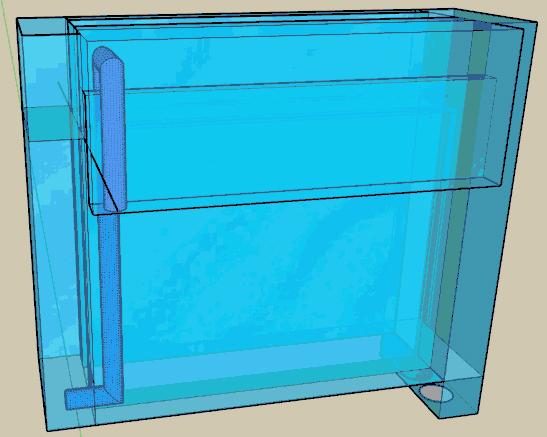 And you almost certainly would want to include a pump with it (with an adjustable flow), so there would be no guessing on the customer's part as to what pump they should get. 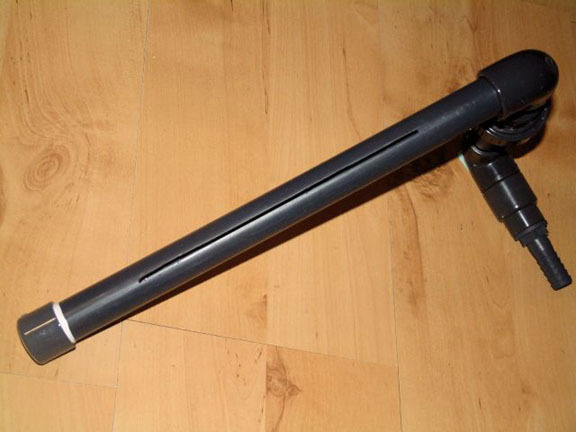 Something like a Hydor L40 Pump (740 gph), with a built-in flow adjust. 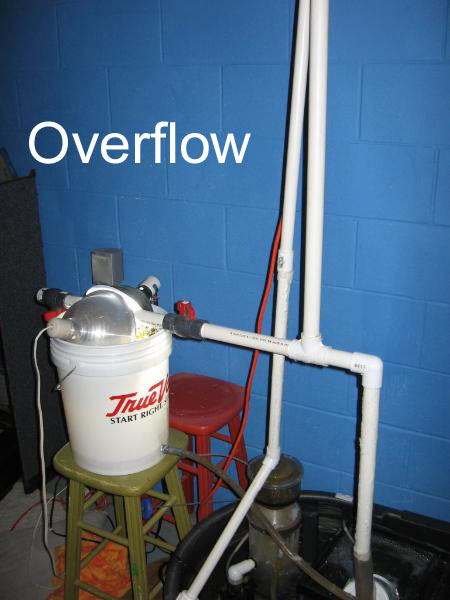 Adjustable flow is important, because you don't know how high up (head) the pump will have to push when the customer starts using it. 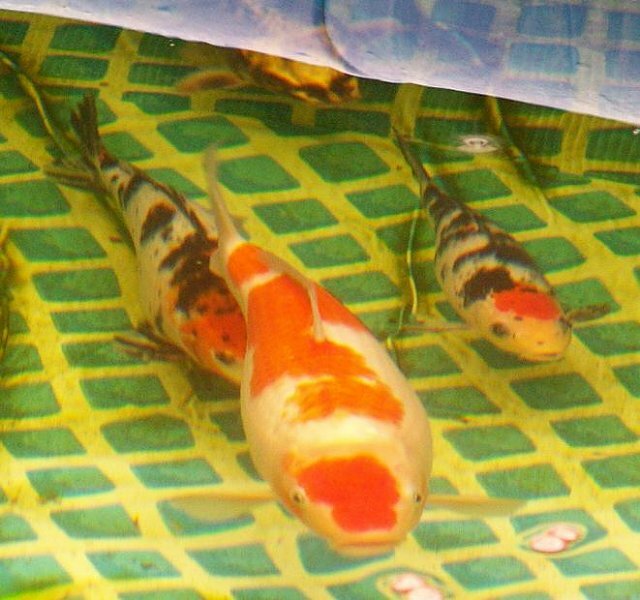 Or, they may have a long run from the bucket to the tank. 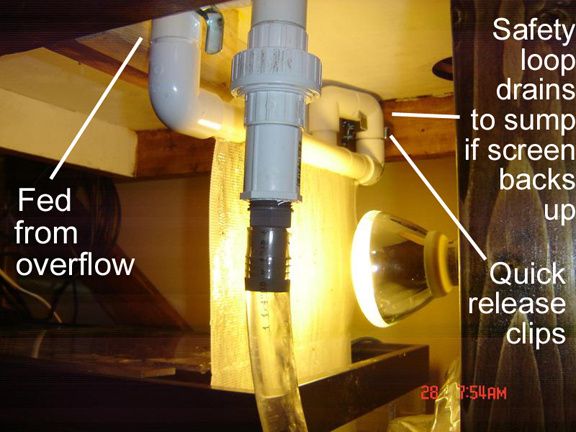 Also, the pump may get weaker (or the pipe slot may get clogged) with time, so being able to turn it up is a plus. 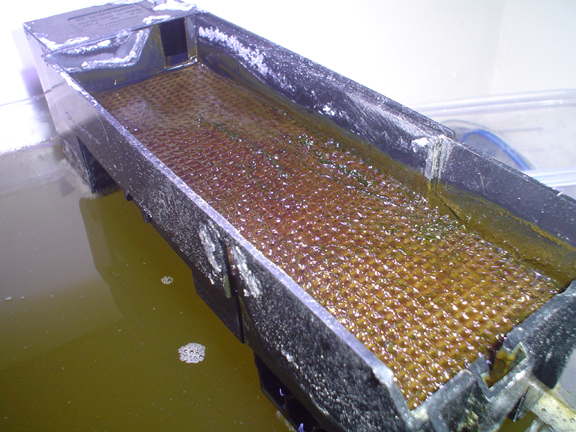 If you decide to sell locally, and install the scrubbers yourself, then you can also consider selling in-sump or above-sump screens. 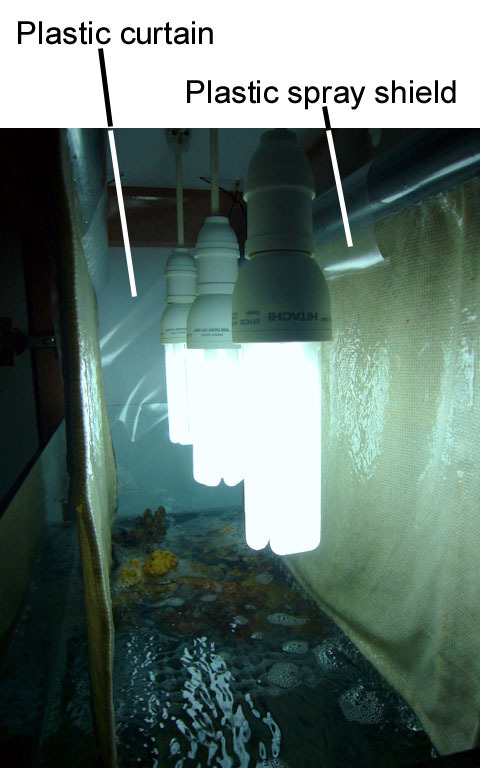 Since these are very custom installations, you can't expect a customer to figure it out for themselves. 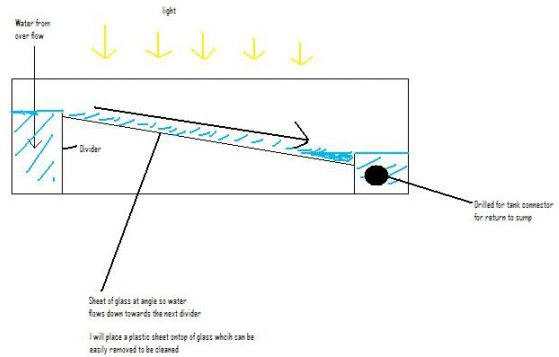 The light placement and water flow need to be setup by someone who's done it before. As for a wavetimer, I'd recommend not putting one in. It's not proven yet just how effective it might be. What is proven is that it adds power cords and complexity, and decisions about what time to set it to (customers don't like making decisions.) Plus, wavemaker timers are not cheap; the one I used cost $50. 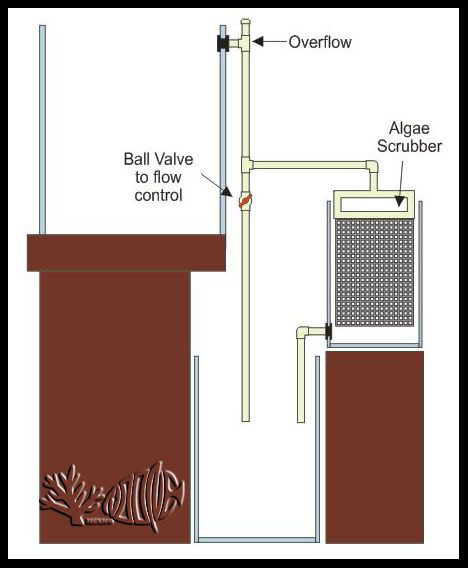 That's a large portion of the total cost of a scrubber. Also, I'd hold off on offering or even mentioning a fan. 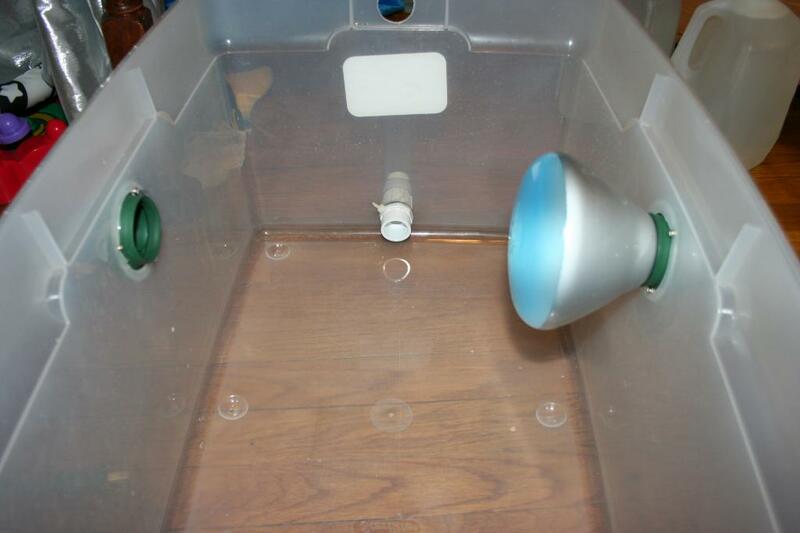 There is not much room on a bucket to easily clip on a fan, and it's just extra noise; it might even be viewed as a danger for families with kids. 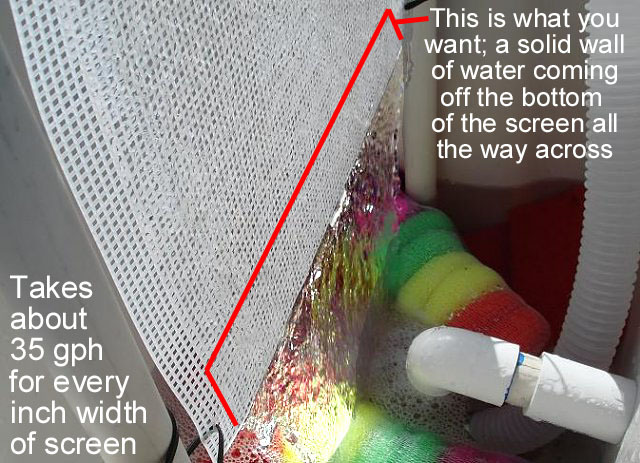 Remember, a fan is also not proven how effective it might help the scrubbing process. 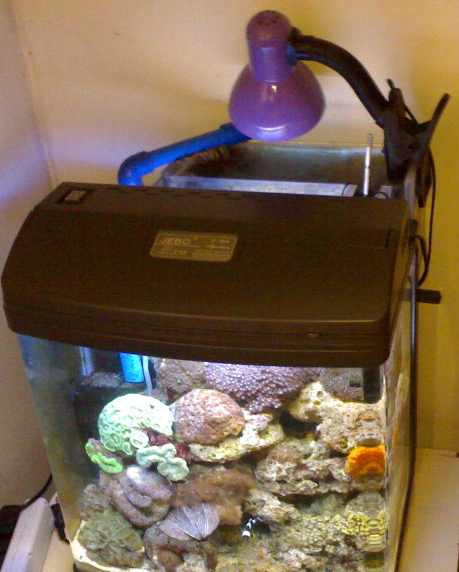 Plus, a fan will really chill the water; some reefkeepers want this, but some beginners will not. 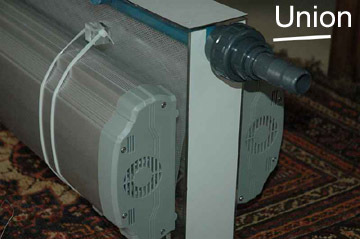 Only mention a fan if they are having heat issues with their tank, or if they currently use a chiller. 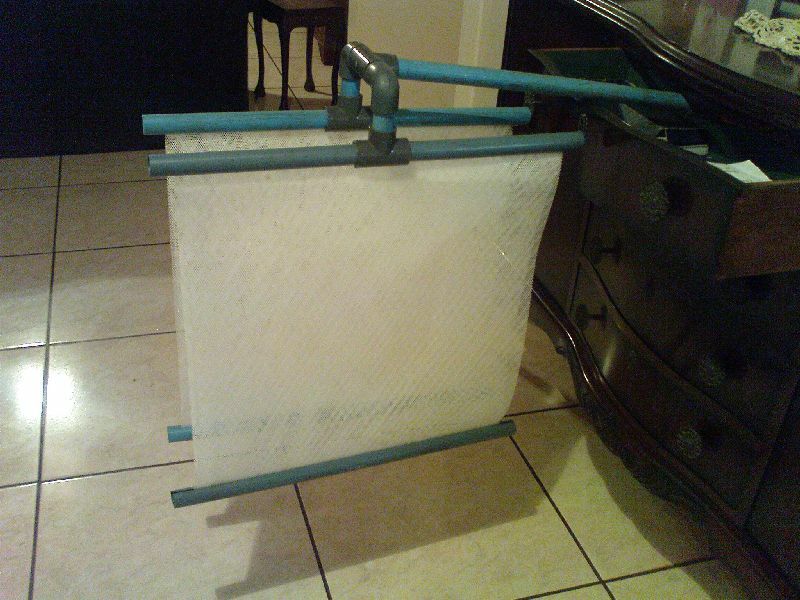 Since fans are so cheap and easy to get, they can always buy and use one later. 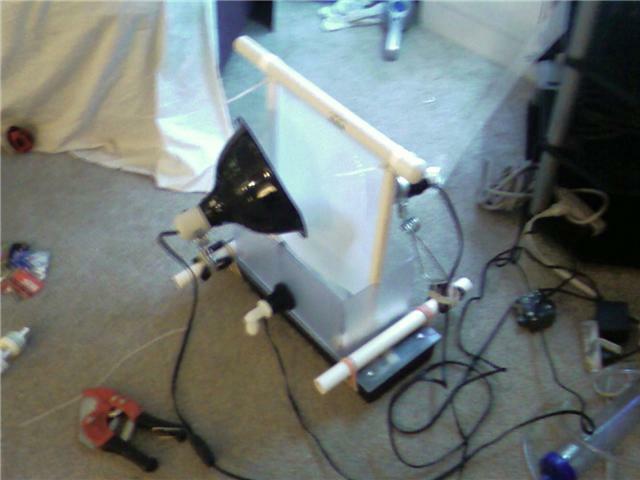 My first tally came up to about $60 for the parts; then you need to add the pump. The one linked above is $80, for a total of $140. So you could sell the whole thing for $199, which would be fair for the amount of work you put in to make it (mostly, cutting the slot). 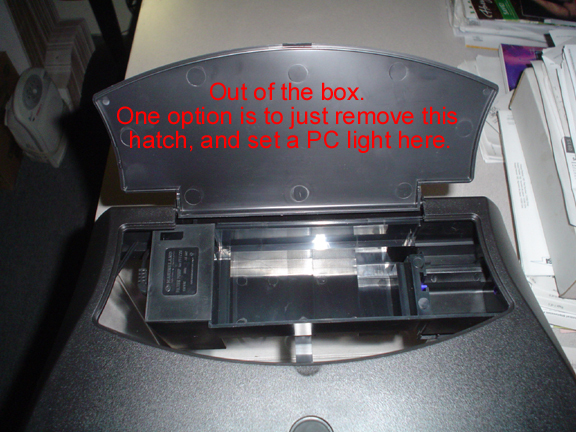 Just print up an instruction sheet for the customer to read, and you are done! Now I'm sure if you searched around, or bought in bulk, you could cut the cost in half. 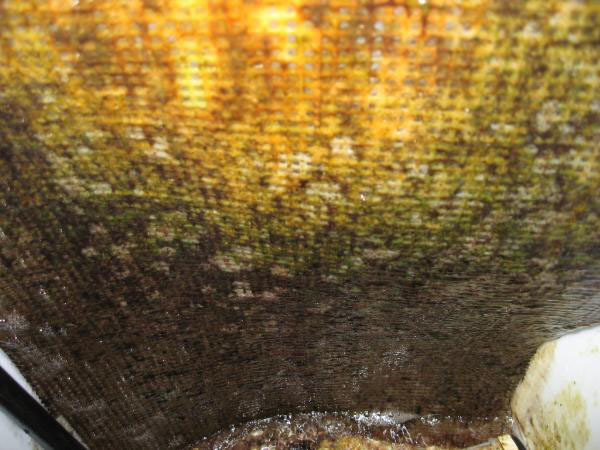 But as far as the customer's cost is concerned, I think something like $199 is a good deal to wipe out algae in their tanks. But you can set your own price. 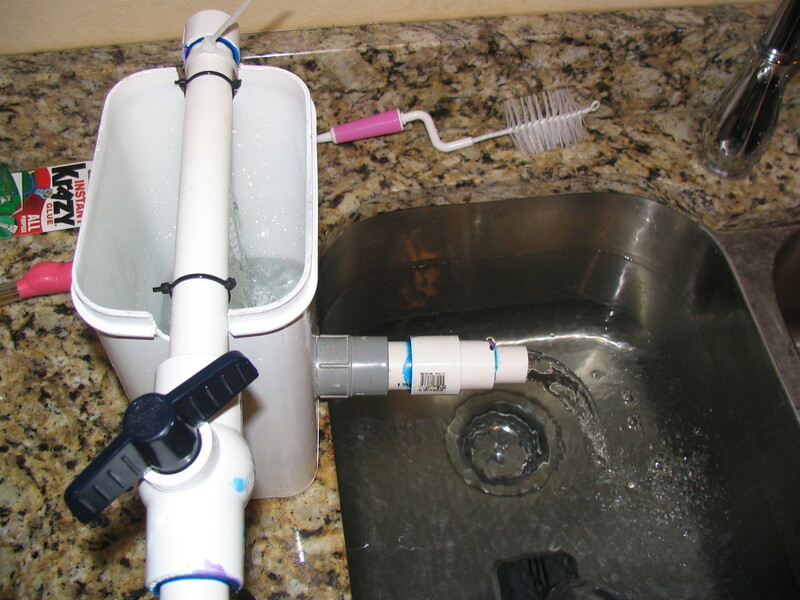 So making the scrubbers is easy enough. Where do you market and sell them? The obvious place to start is by letting people on the forums know you have them, starting with forums that have current scrubber threads like this one. Most forums also have a buy/sell section, which is a good place. The next step might be a banner ad on these forums, and then maybe you could buy a whole sponsor-forum. 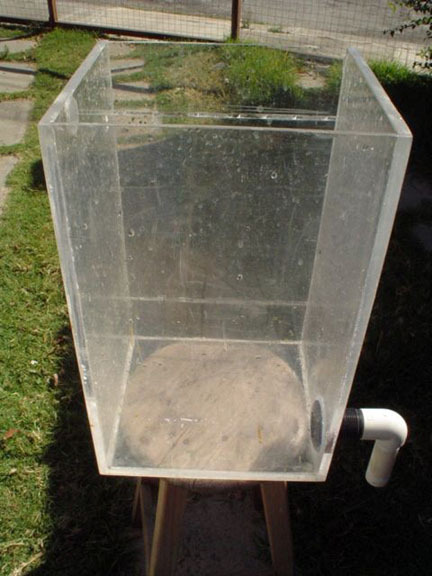 Next I'd target the LFS: Let them use a bucket for one of their problem tanks (of proper size) to prove the bucket works, then work out a deal whereby he buys from you and resells, or he holds them in consignment and gives you the money after he sells them. You set the price, of course. You could also do a "loan-to-buy" offer, where you let a customer use a demonstration bucket of yours for free for maybe 2 weeks, and when you go to pick it up (when their N and P are reduced), they'll want to buy a new one from you in order to keep their N and P from going back up. 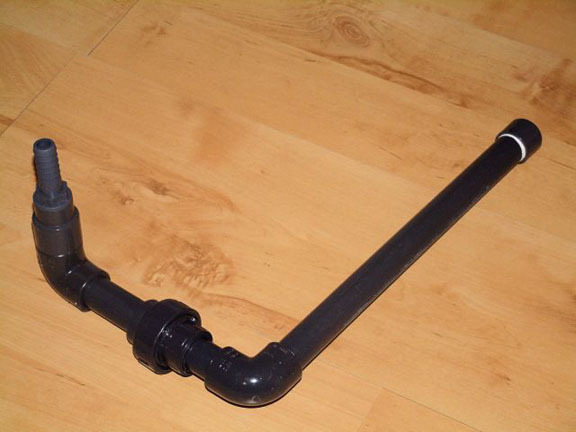 Ebay might be an option later on, when people know what these things are. Also you could always do a litte site of your own. And don't forget Craigslist. But people have to be already looking for scrubbers for these online places to work, unless you advertise it as a "mega powerful algae remover" Then there are the traditional magazines that you could advertise in. They get expensive fast, but the reach a lot of people. You'll probably want to get some sales going with the above efforts first. Basically, you are trying to reach beginners. 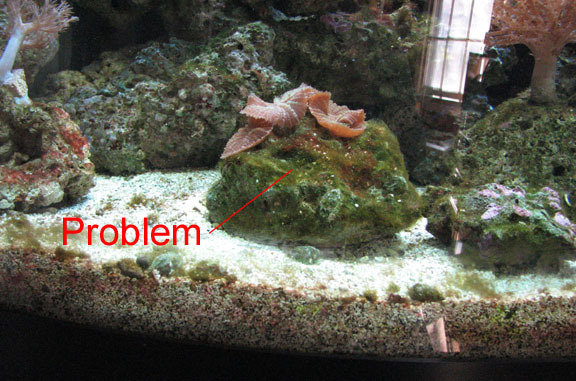 The types with FO, FOWLR, or softie/LPS reefs, who are on their first or second tank, are your best customers. 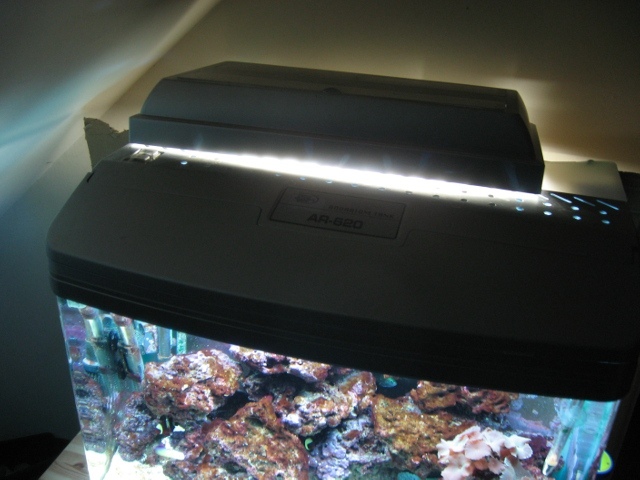 They spend money (sometimes lots of) on something if it makes their tank the way they want it, especially if it does so without them having to expend any effort. 9 out of 10 people who walk into a LFS are this type of person. 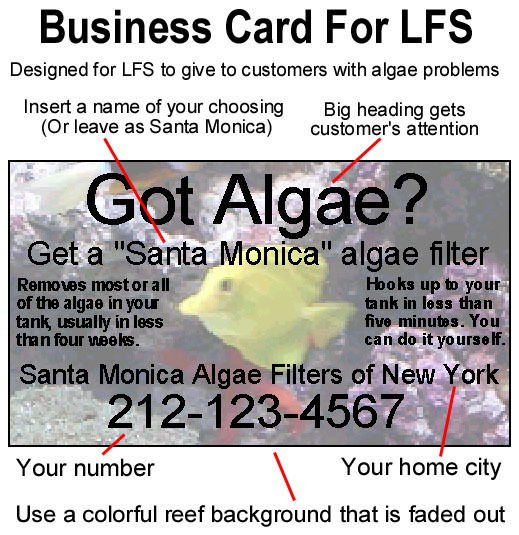 So getting familiar with your LFS(s) will be very important. 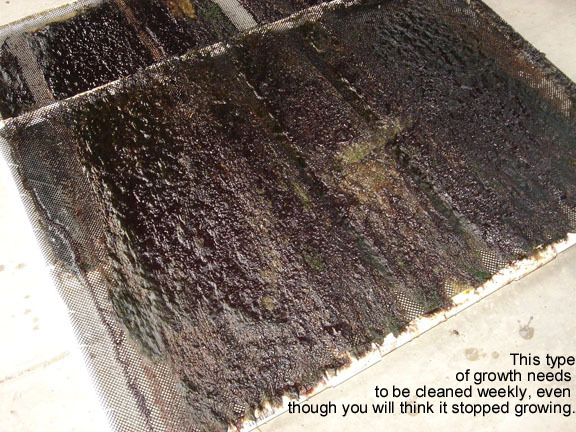 Guarantees: Although most everyone on these forums that has set up a scrubber properly has seen great results (and possibly even eliminated all their nuisance algae) within 8 weeks, you can't make a guarantee of the same to a customer, because you have no control over how they will use it. 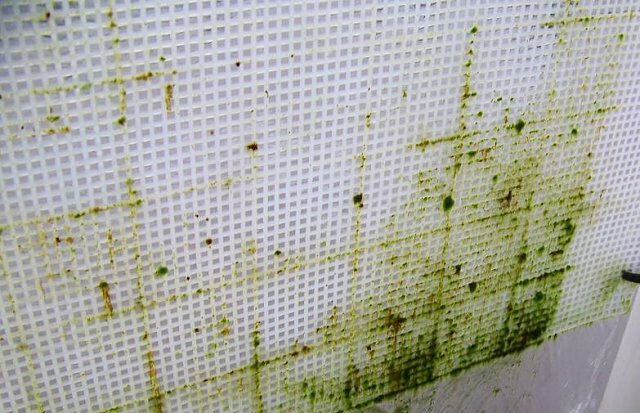 So by saying something like the scrubber "usually" clears out algae within 8 weeks, you will be covered in case they mis-use it. 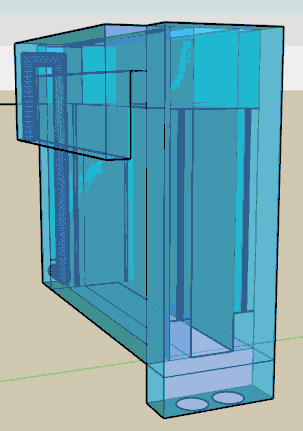 Now, if you are hired to build and install it yourself, and maybe even to do weekly cleanings of it, you might be able to promise more. 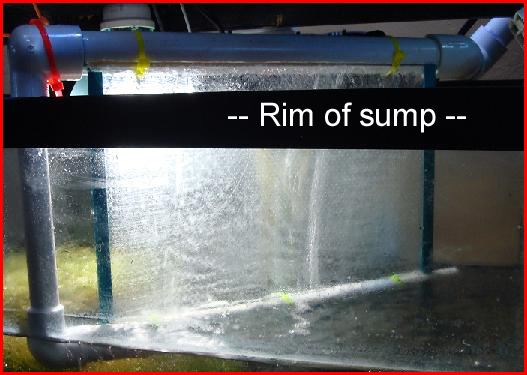 Size: Most customers will be beginners, using FW or SW fish setups under 100 gallons. 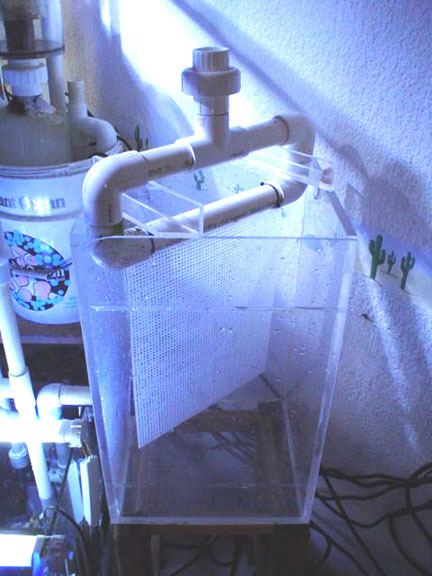 For these folks, a standard 5 gallon bucket with 144 square inches of screen should be fine. 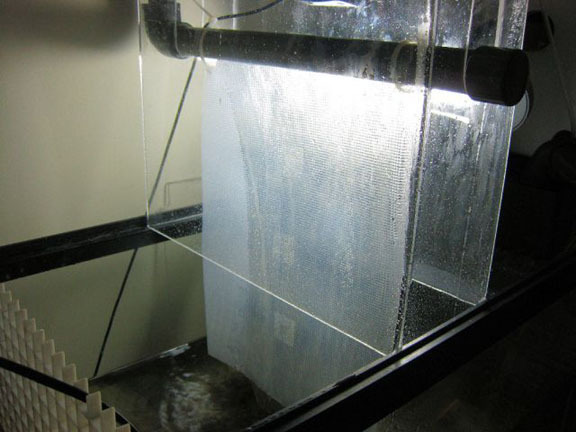 If you find that they have a very heavily stocked FO tank, or a tank of 150+ gallons, you may recommend to them that they get two buckets (hooked up in series or parallel). Or at least to start with one, and then add another later if they like the results. But building a "bigger" bucket is not a good idea for now. Keep everything to one size. Support: Once a customer has purchased from you, you'll want to remain in contact with them afterwards in case they have questions. Most of them will have their questions immediately after purchasing, which is when they are trying to get it hooked up and working. 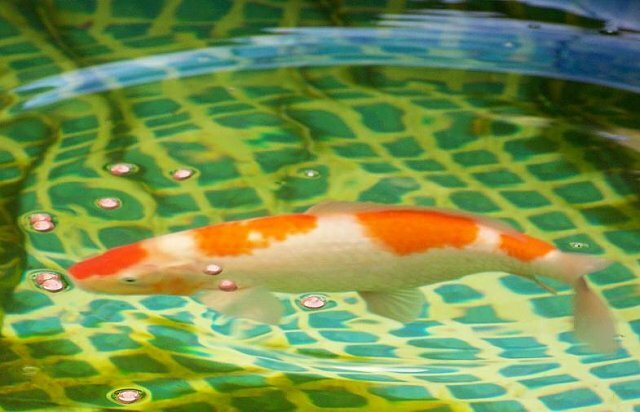 After that, you probably will never hear from them again, except for a few that think that it's your fault that their tank is dying from some bad-husbandry issue of theirs. This is when you rely on your no-refunds policy. 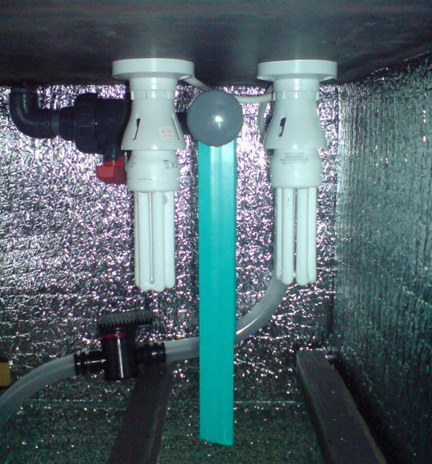 Installation: Many customers are only interested in the final look of their tank; they don't want anything to do with understanding how it works or how to install anything. 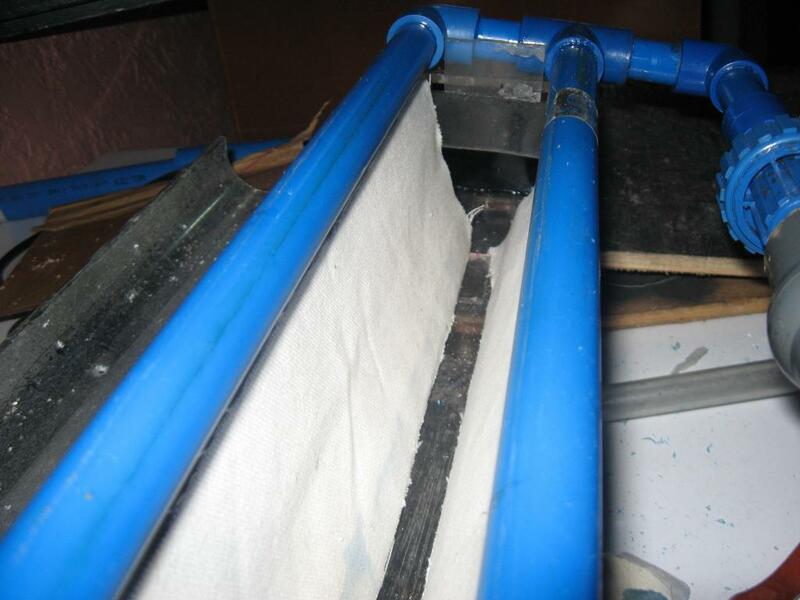 For these folks, you offer (local) installation of the scrubber for an additional cost. 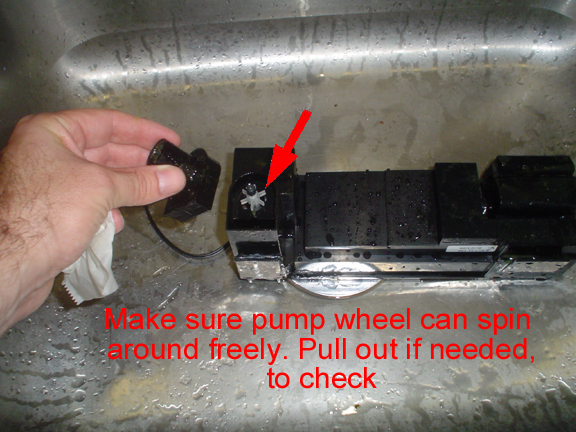 If all you have to do is put the pump in their sump, set the bucket up, and run the drain line back to the sump, you might charge $150 service charge to go to their location and do it. 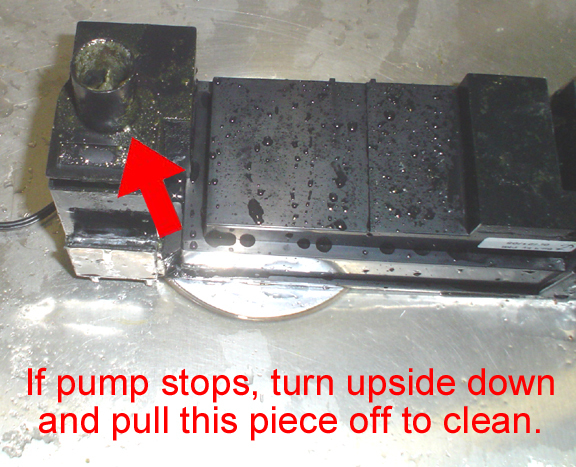 That would include driving, setting up the bucket, taking N and P measurements, answering their questions, watching the setup for problems/leaks, showing them how to clean weekly and scrape perodically, etc. 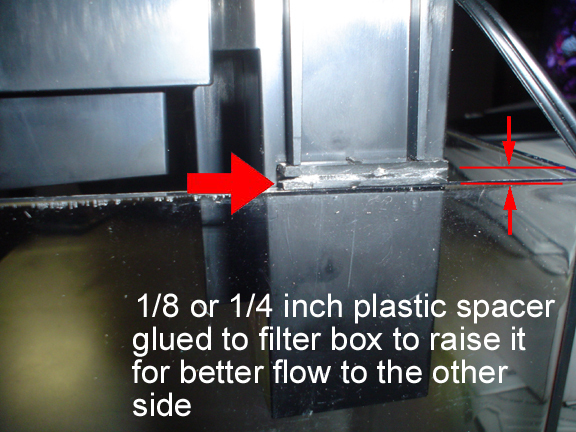 If you are installing a custom in-sump or above-sump design, maybe an extra $250 would cover the extra time. Refunds: This will be the toughest area for you to deal with. 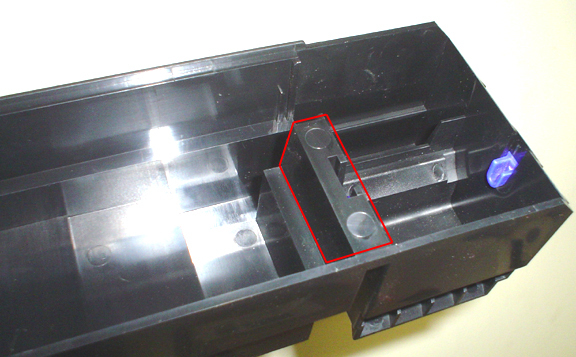 Basically, you should guarantee that everything will ship to the customer without breaking (especially the lights) and that it will be in working condition. Other than that, once they start using it, there are no refunds. Let them know this upfront, in your invoice. 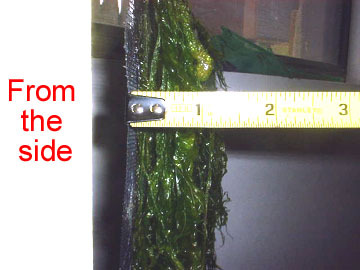 And there are certainly no refunds if they are "not happy" with the nitrate, phosphate, or nuisance algae issues. 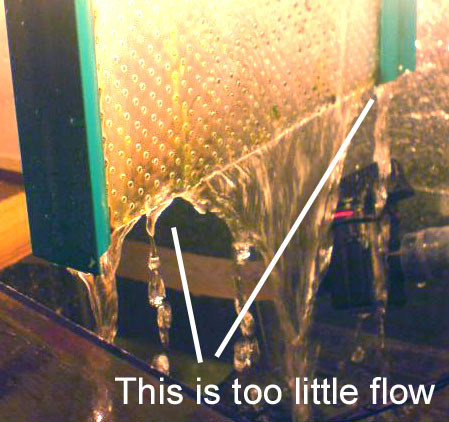 Basically you just want to guarantee that the pump and lights work, since they are the only mechanical parts. 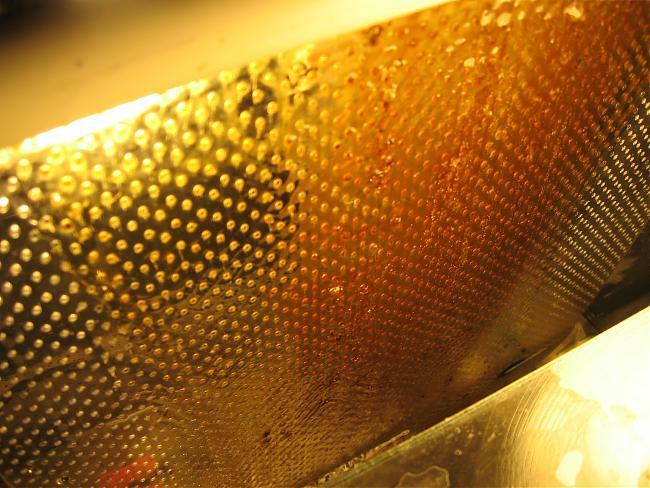 Tie-ins With Maintenance: Many guys, maybe you, are currently servicing tanks. So of course new accounts are always being sought to service. 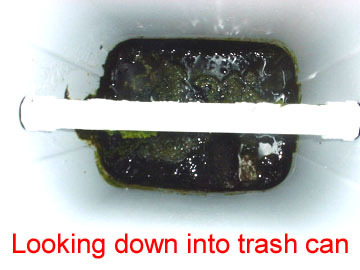 One thing you can do is to offer a free scrubber to a customer that purchases maintenance from you. 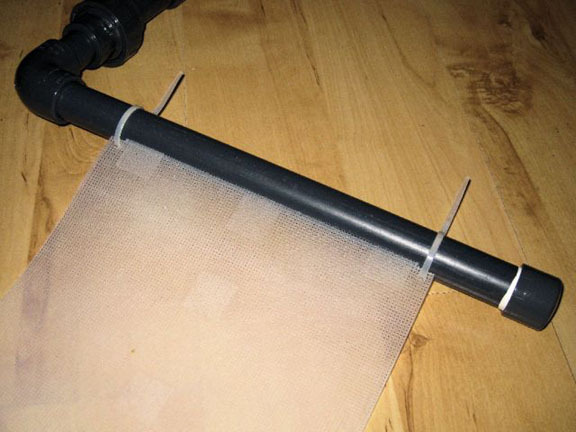 So if you are a maintenance guy, you can use the scrubber to get new business. 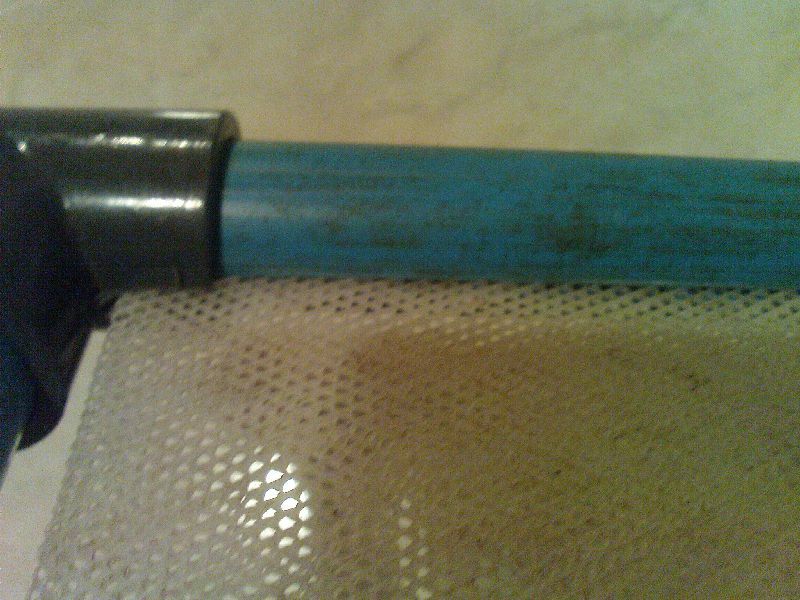 If you are not a maintenance guy, you can offer an actual maintenance guy a deal if he includes your scrubber in with his new clients. 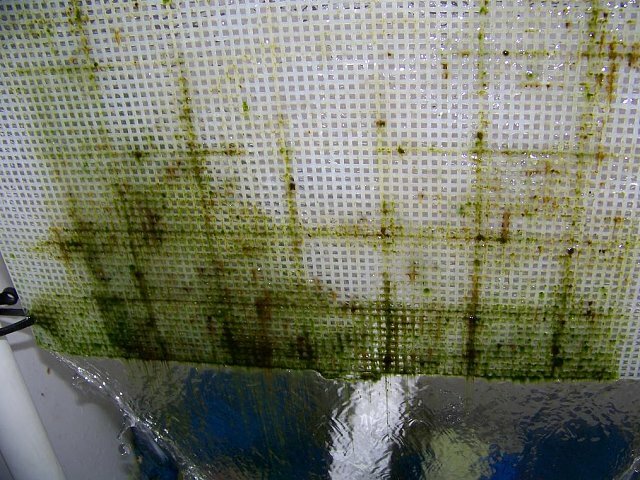 Pre-grown screens: While the pre-grown screens from Inland Aquatics really helps speed up results by weeks, I would not recommend including one in your scrubbers for customers. It's too much reliance on a third party for delivery, plus it introduces delays. 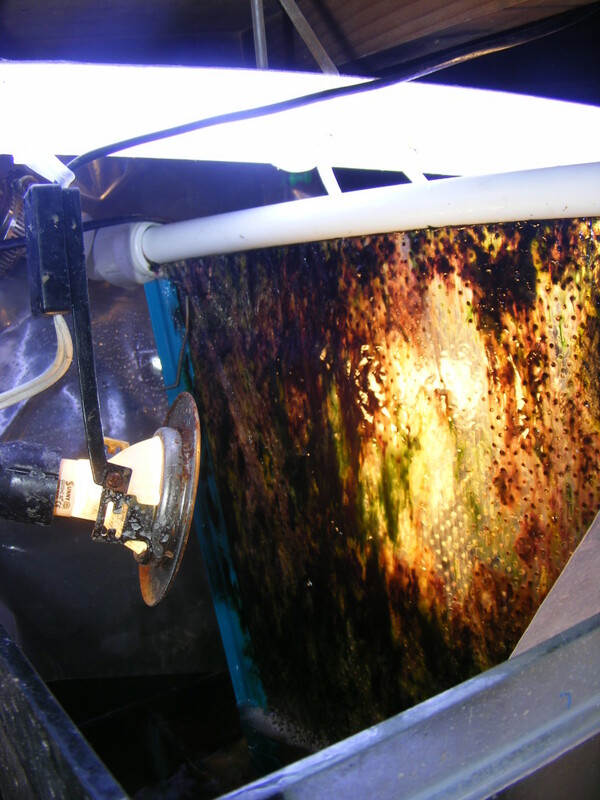 Besides, everyone has been able to get desired nutrient removal from their tanks within eight weeks by starting with a blank screen. So why introduce a possible delay/problem. 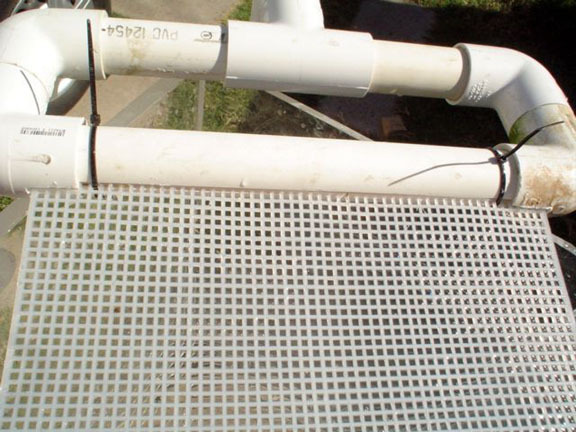 I would only consider a pre-grown screen if you were hired as a full-service person to fix nutrient problems on a large system, and they needed big results in a hurry, and you had complete control over everything. 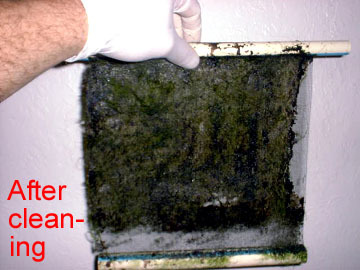 Name: Refer to a scrubber as an "algae filter", not a scrubber. 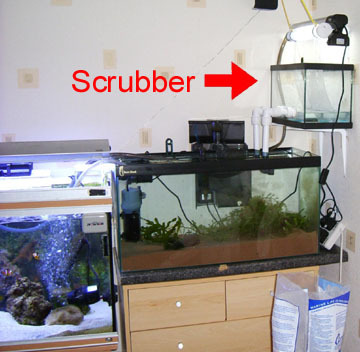 To a beginner, a "scrubber" is a scrub pad they clean the glass with. 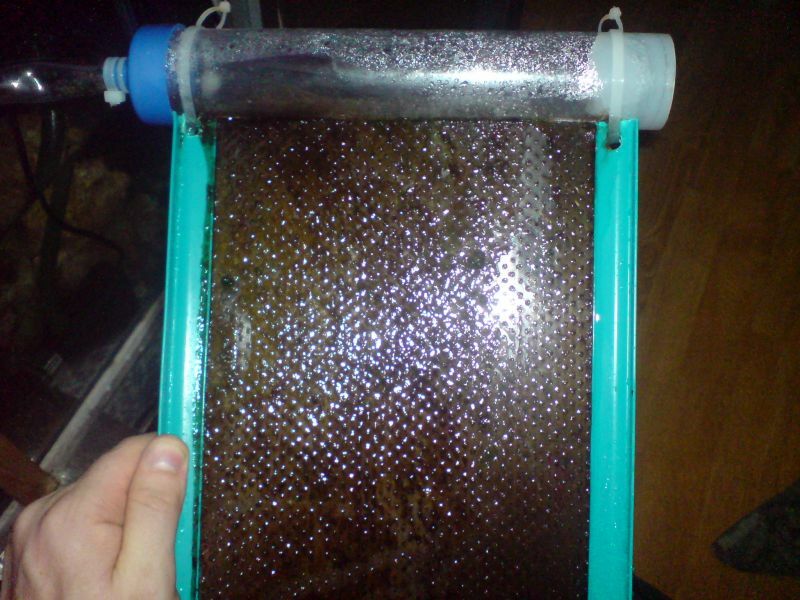 By referring to scrubbers as "algae filters" you do two positive things. 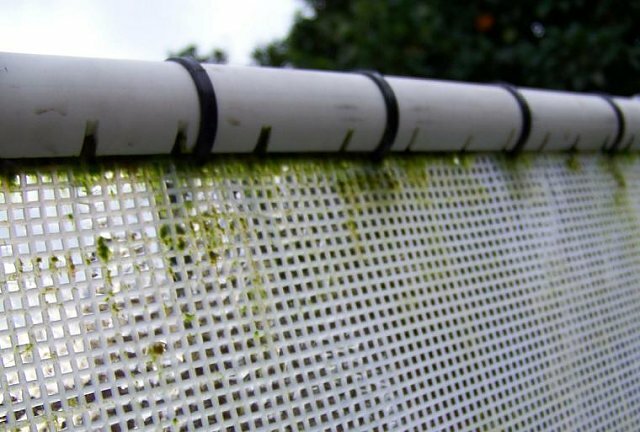 First, you make it very clear to the customer what it does: It filters algae, which is exactly why they are talking to you in the first place. 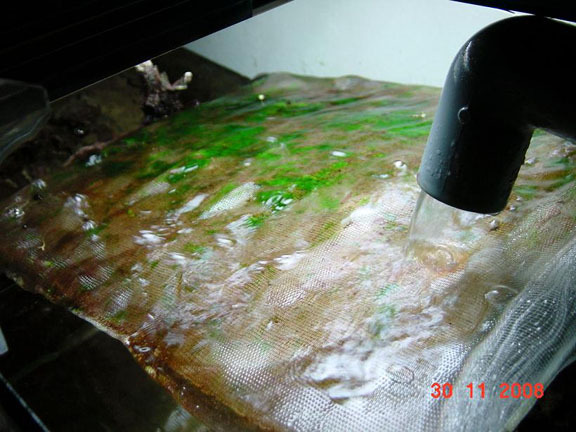 Second, if they ever become more involved in reefs, then they will come to appreciate that "algae filter" really means that the algae on the screen is doing the filtering. So the name really has two meanings. LFS Referrals: Maintenance guys do this all the time. 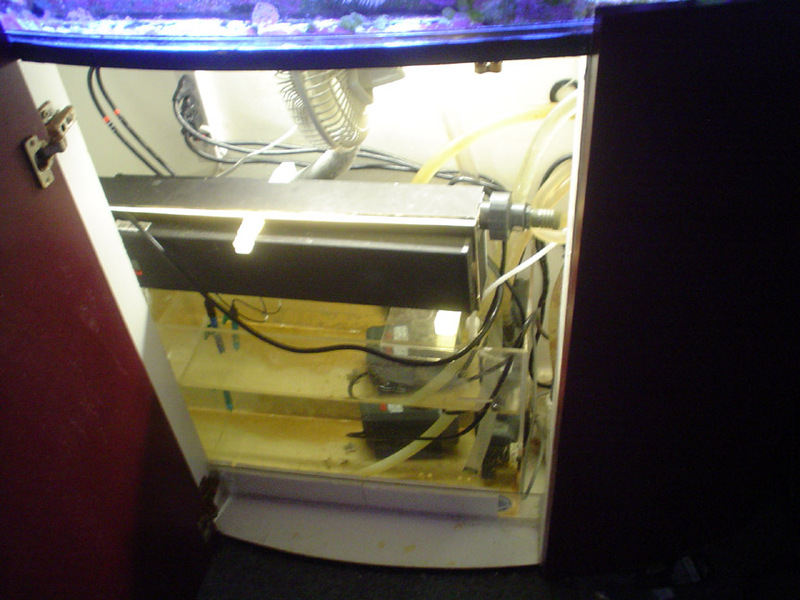 First you convince the LFS that the scrubber works by loaning him a bucket for a problem tank of appropriate size. After he's conviced, give him your business card so he can refer you customers. Hey may ask you for a referral fee, so you'll have to negotiate with him how much. I'd say $10 per person that calls you is fair, whether or not they buy. 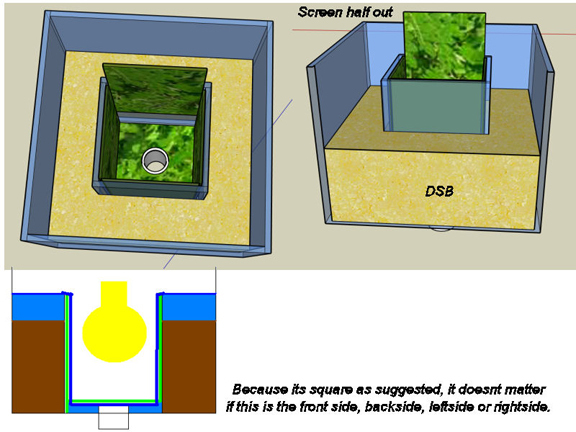 Details: When explaing a bucket to a potential customer, you have to keep it simple. 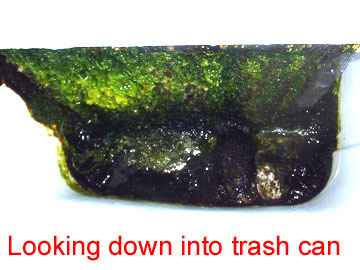 All they care about is removing the ugly green stuff from their rocks and glass. Some of these folks don't even know which fish are SW and which are FW. 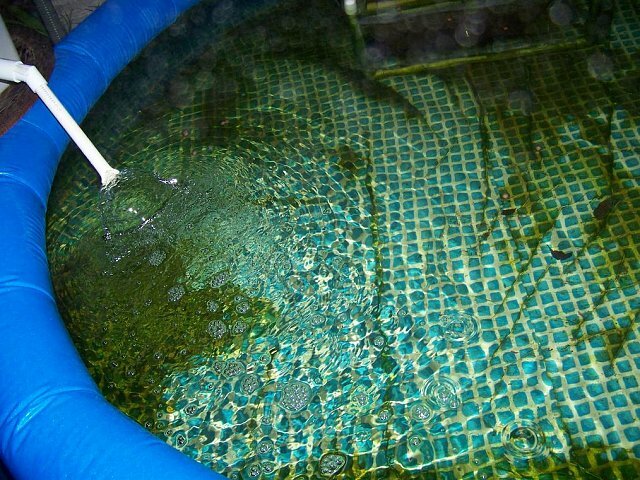 So talk about the bucket in terms of doing what they want: Removing the algae from their tanks. Don't even mention nitrate or phosphate unless they ask. 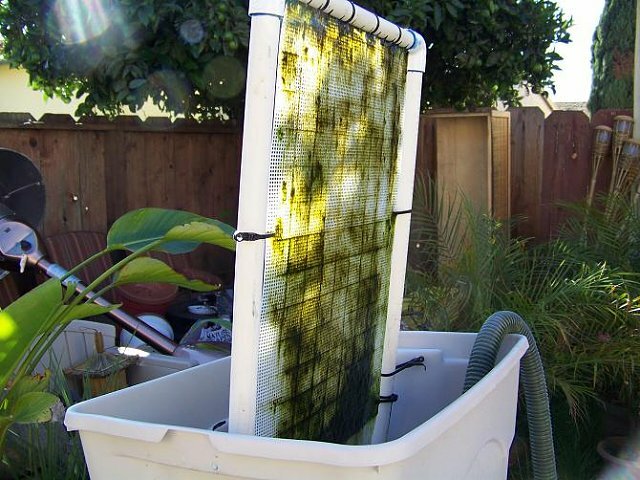 Make it easy to understand, i.e., "All the algae filter does is make the algae grow on the screen instead of in your tank; then you just clean it away!" That's all they really need or want to know. 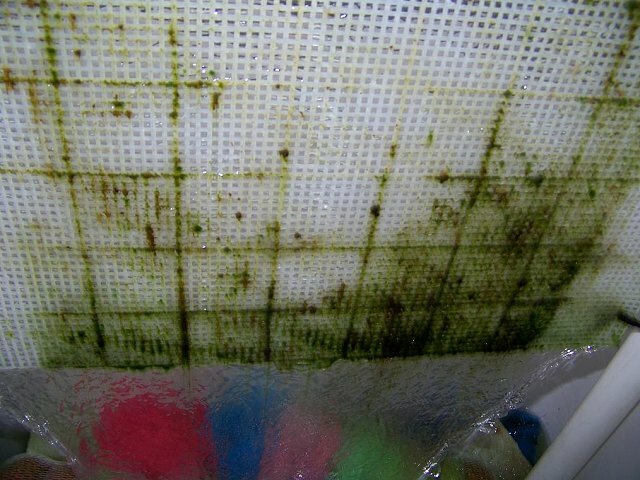 If they get into wanting detailed explanations and case histories, they they are not going to be buying your scrubber. But they will talk forever. In sales, these people are called "talkers", and will waste most of your time, and buy the least amounts of your product. The people who do buy most of your product will be the ones who ask the least questions and then buy the quickest. Again, all they care about is: Will it get the green off the rocks and glass? 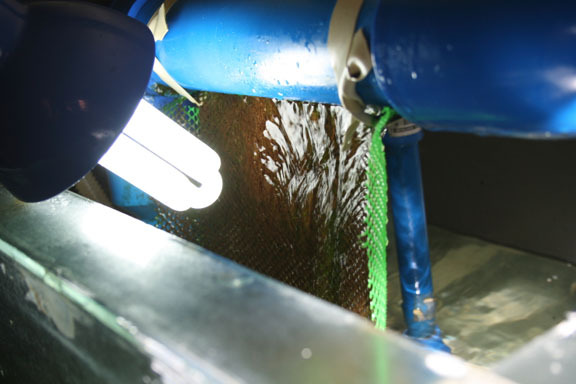 How often does it need to be cleaned?, What is the cost?, and Is there an algae guarantee?. All are easy answers (the last one being "no" . 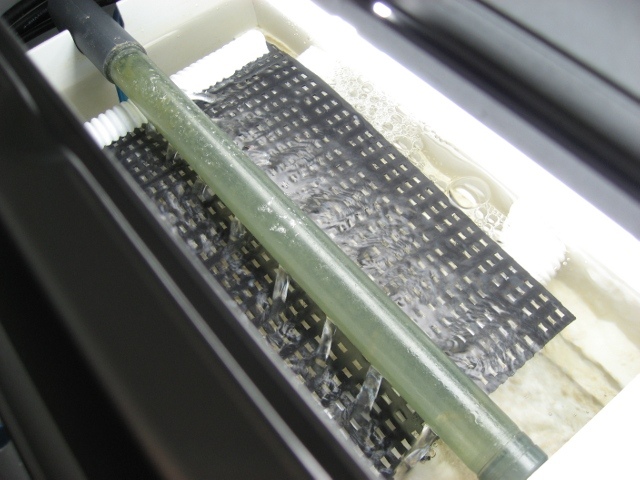 Anyways, hope to see some of you becoming mini scrubber manufacturers! "garypower" on the UR site: "i was on one of the first couple of pages on this thread and decided like others to give it a go! 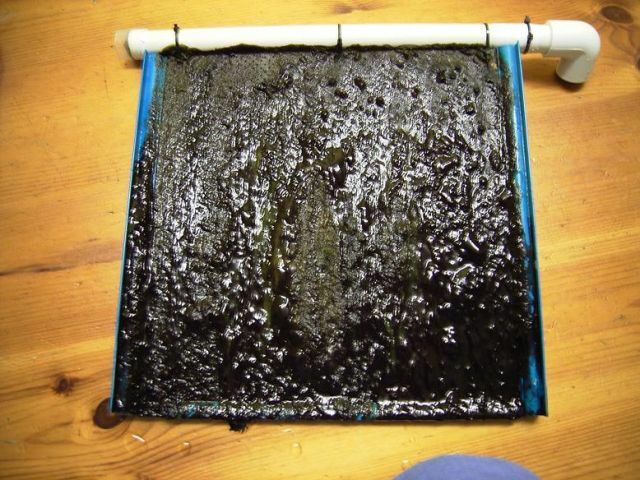 my screen is now 2 months on, and its there as predicted, full of algea turf deep red brown colour and having to start using a blade to make space! 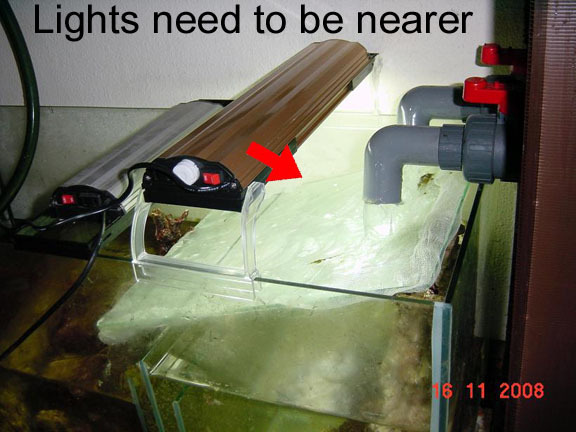 my tank parems have gone to non-detectable po4 and zero nitrates! 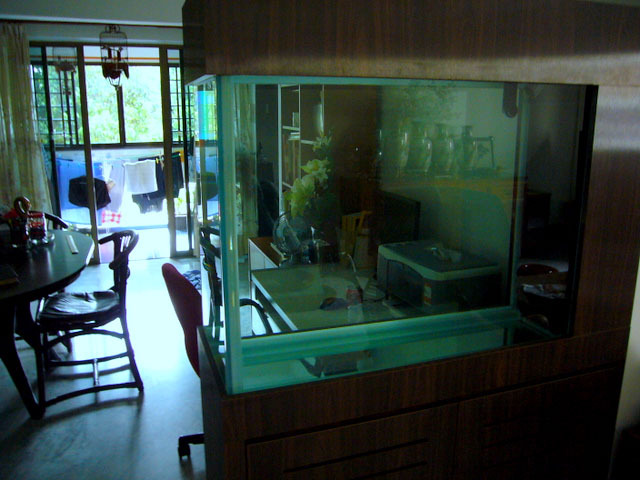 the tank in appearance looks like polished water yet i dont run carbon! 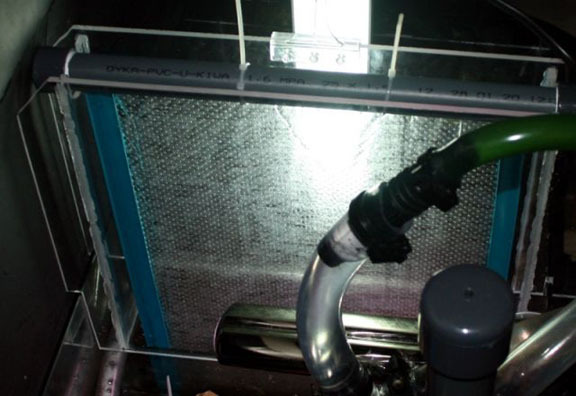 my skimmer is now only running one hour every four hours with my ozone unit on a timer, i have a much better growth rate with my corals, there is less build up of algea on the glass i only use a magfloat once a week to clear very faint dusting of algea." 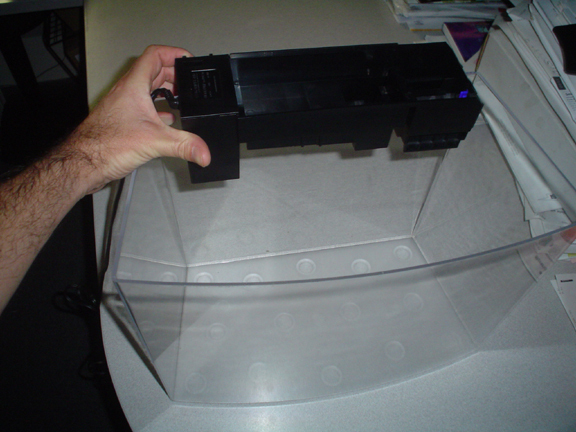 Anyone know anyone who could build some acrylic scrubbers? 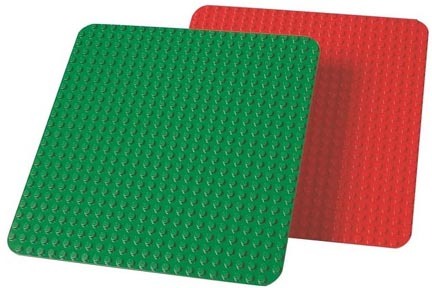 People have been asking me to build them, but I don't want to. 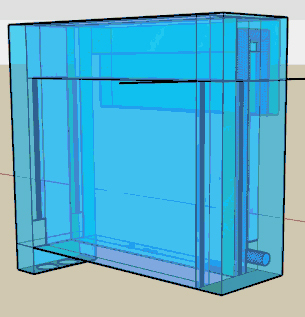 How large/small can builder handle? One problem with posting a directory is that it will need constant updating and re-posting. Would there be a better way to do it than posting in a thread? 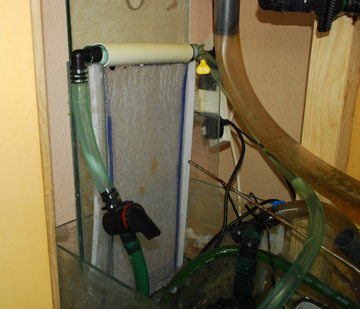 I could host it on my site where I put all the pics, or I could put it on the algae scrubber site. But ideal would be being able to post it here, and be able to edit it here. 10/10: Subscribed for sure. 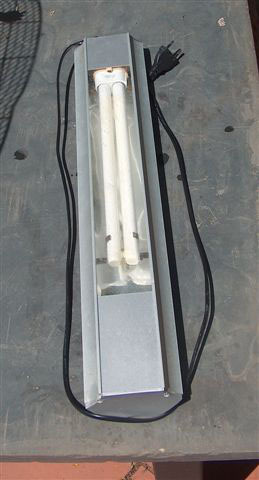 I'm going to try this oustside in the sunlight...I would think there is enough light? 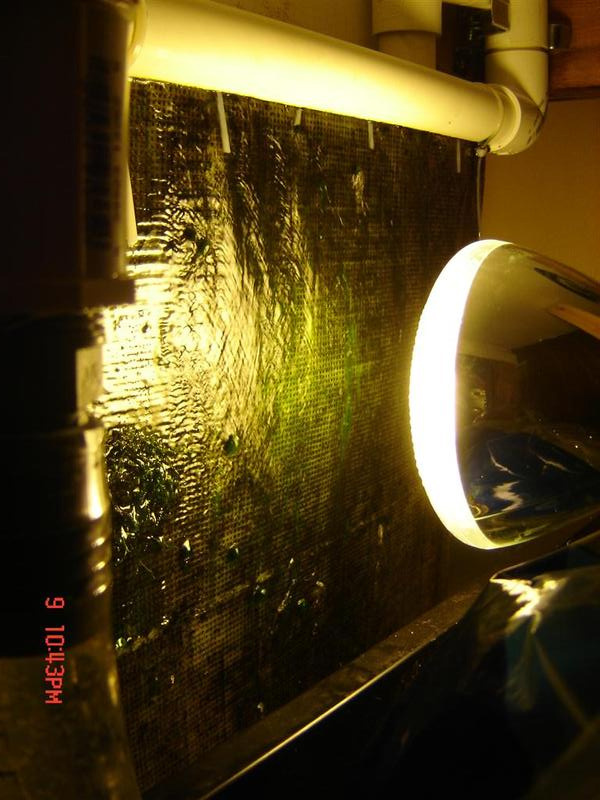 10/15: [Will be in] direct sunlight aprox 7 hrs. AM sun on one side and PM sun on the other... southern exposure. 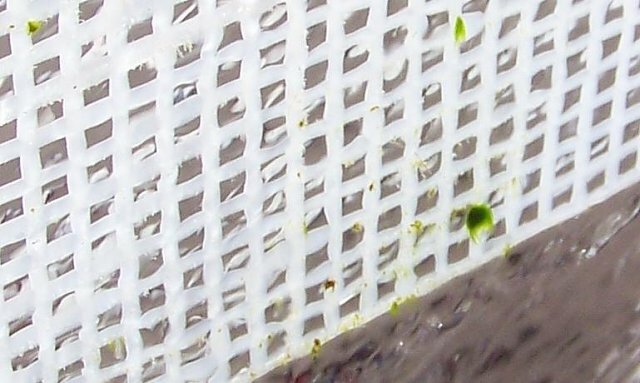 After rubbing what green Algae I could scrape up, into the mesh like a caveman, the water is now running full width, and it looks slimey(?) shiney. 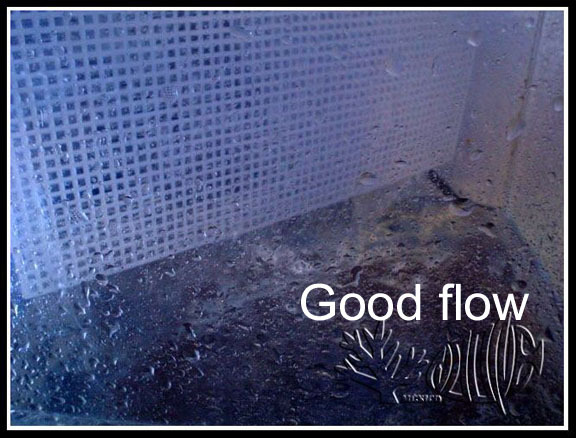 [Flow is] 400-450 I would have to estimate, possibly more. 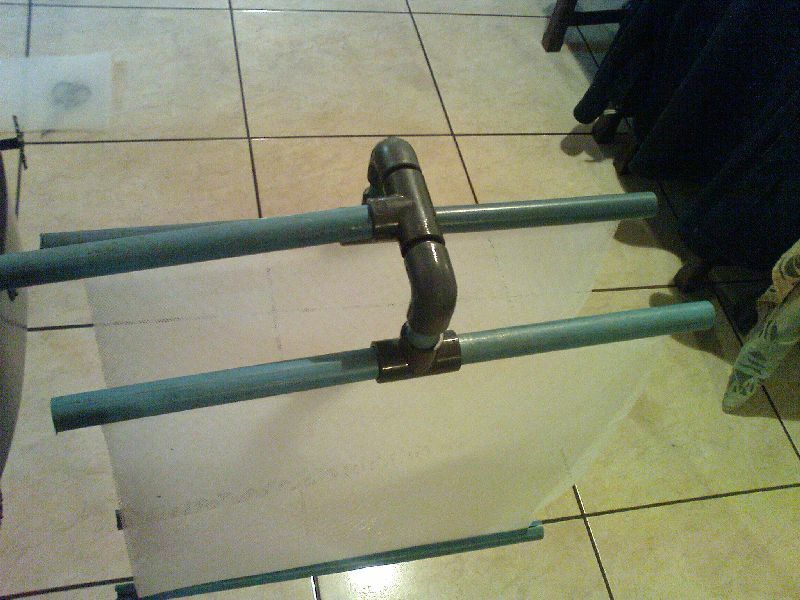 I used a table saw with a carbide tipped blade for the slot and cross-cuts...Make [the pipe] longer than you need so you have something to hang onto while you are sawing the slot. 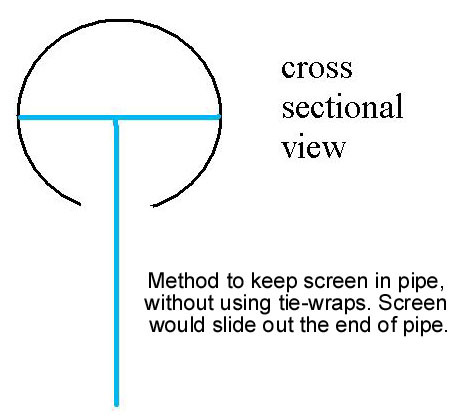 The cross cuts are 1" apart and the blade height was set at 1/4" for the 3/4" - sch 20 PVC pipe. I am chalking the ground to see if there is better exposure time about 80-90 degrees counter clockwise. 10/22: Woooot! OK we have what looks like the start of something very interesting. Here's the thing... it's down at the bottom where it gets the least amount of direct sunlight...?? 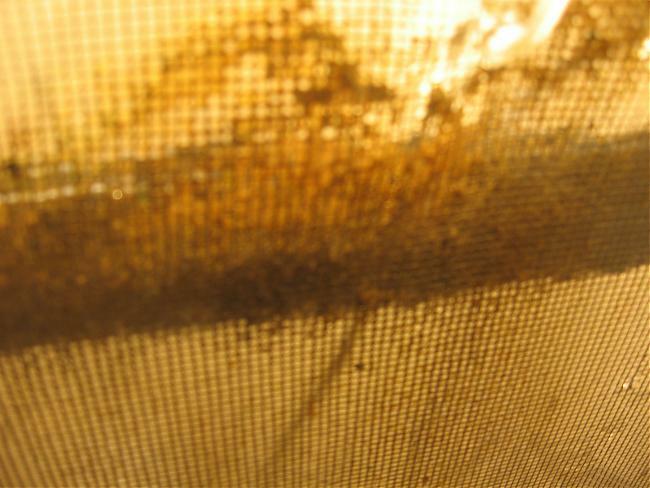 The canvas was seeded with what I could, and then rinsed thoroughly. That's something you said in the thread. 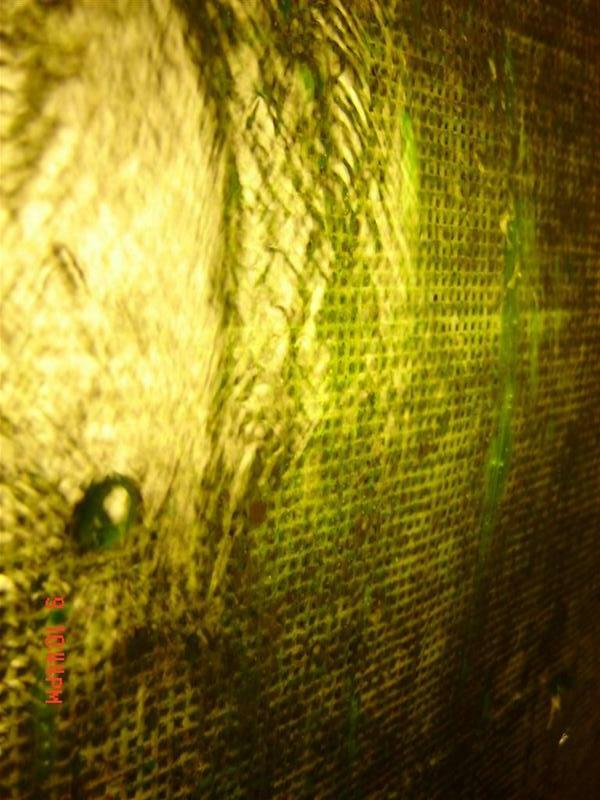 There was no visable green on that canvas [when started]. 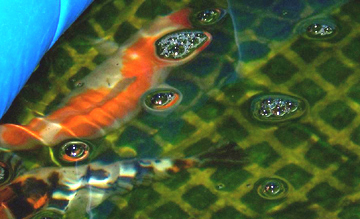 There are 4 medium KOI in there, and it's cycled. Just recently, 2-3 days ago? 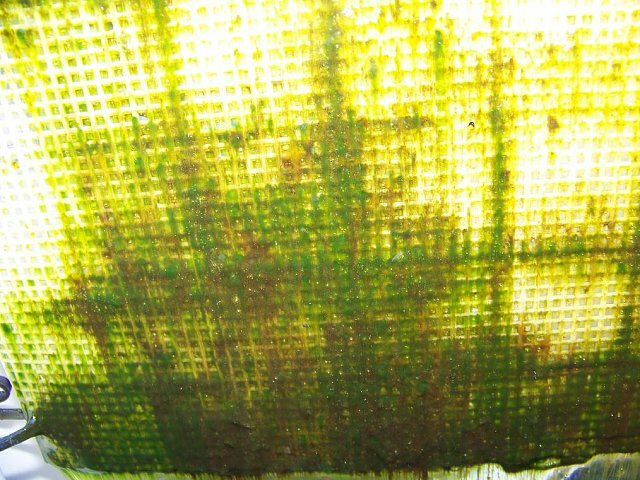 Algae took off in the pond almost over night. I didn't see anything for a week, and then it started as a little bloom on just one square. 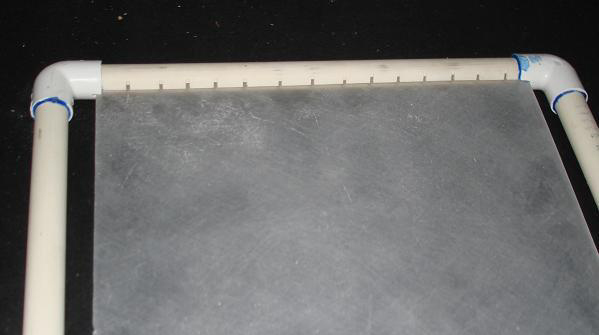 After seeing where the growth pattern is, I would have used some 10 grit carbide paper on the plastic...the rougher the surface the easier the initial the spores can attach. 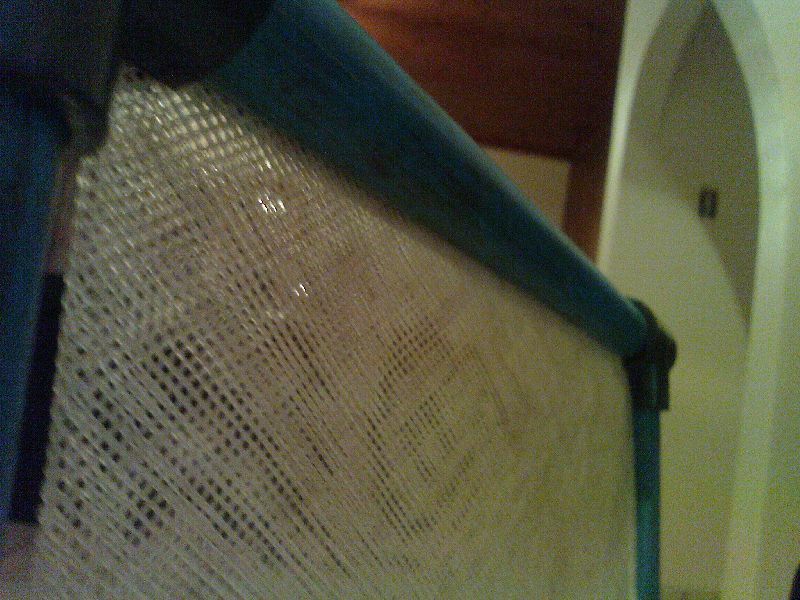 The top where the plastic canvas goes into the spraybar, got scratched the most from fitting and re-fitting the screen...it has thick green algae on it and it is shaded alot of the time. So in summary, go as rough as possible on the prep...I say. 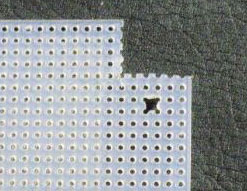 See the high spots of the grid? I wish I would have sanded the crap out of it with bigger grit. I'm still getting good flow across the canvas anyhow. 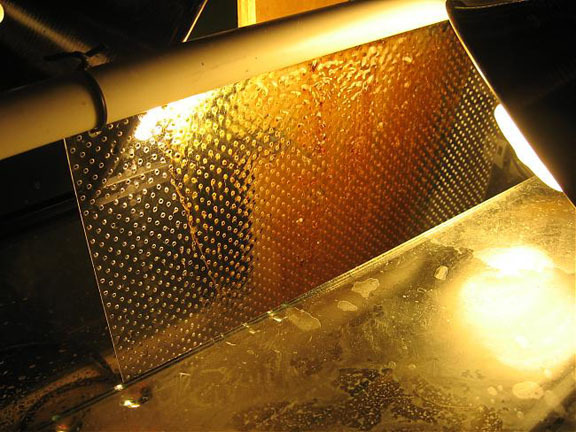 It's a relatively inexpensive project for the results you can produce. If you are anything like me, no matter what others are getting, I had to see for myself, first hand. 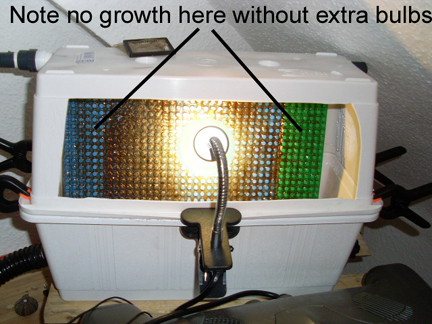 I have less than 20.00 invested, but I use the Sun and a gravity return. The concept is basic, add your twist to it and see what you come up with...it just might be better than the others. interesting to see it works with FW tanks too! 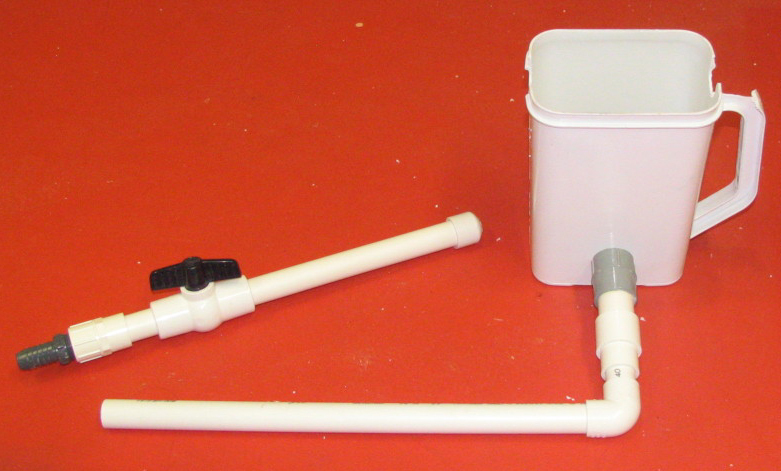 But at least those who want scrubbers (but don't have the time or ability to build one) can now have it done for them. 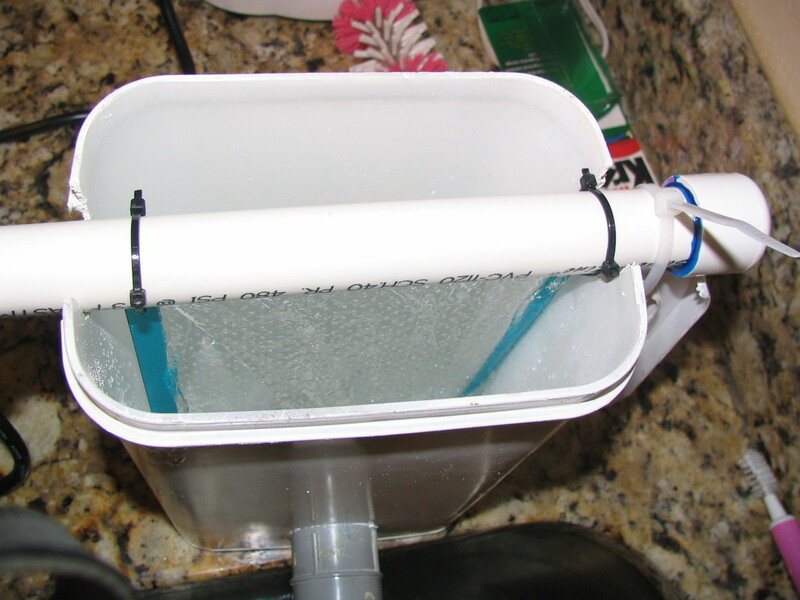 The DIY bucket or sump scrubber is basically a level 1 project. 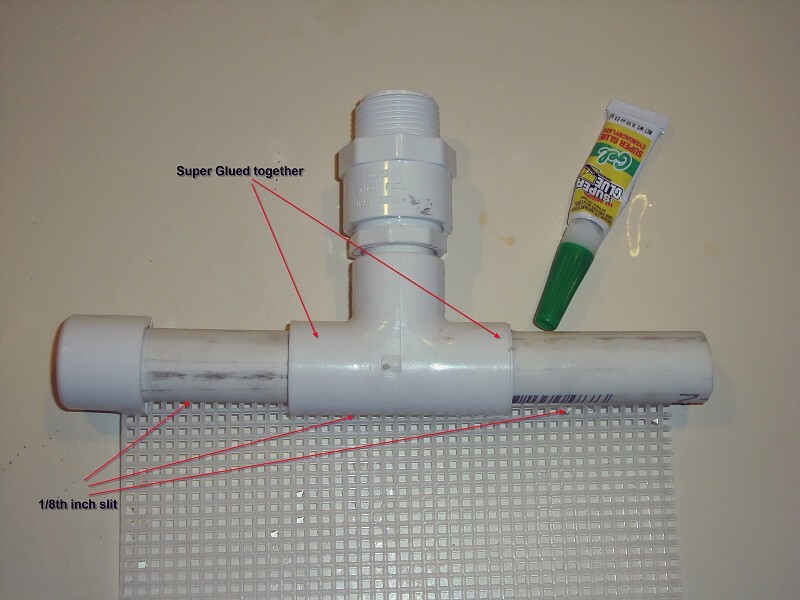 Simple, free, easy DIY, and works great. Yes they are a bit large and ugly, but who cares. Level 2 are the acrylics. 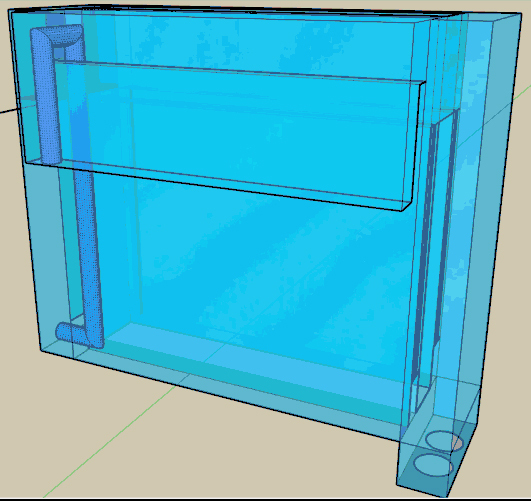 Self contained, small (only six inches or so thick), powerful, and nice looking. But they are so hard to make that only two people besides me have made them (and one of them I had to get made for him). 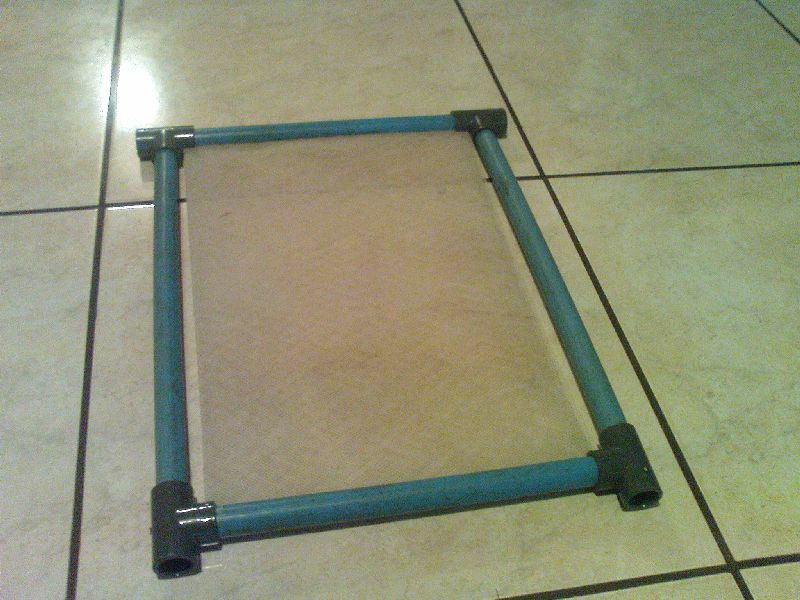 I thought that since so many people made DIY sumps and tanks, many more would have made nice looking acrylics. Guess not. And only one person is on the builder list. 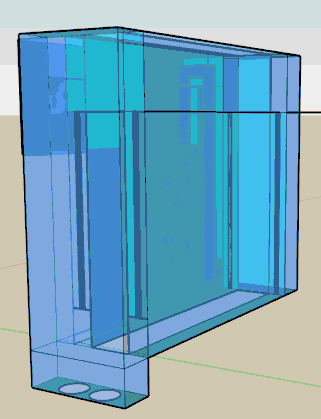 Well now I'm working on level 3. 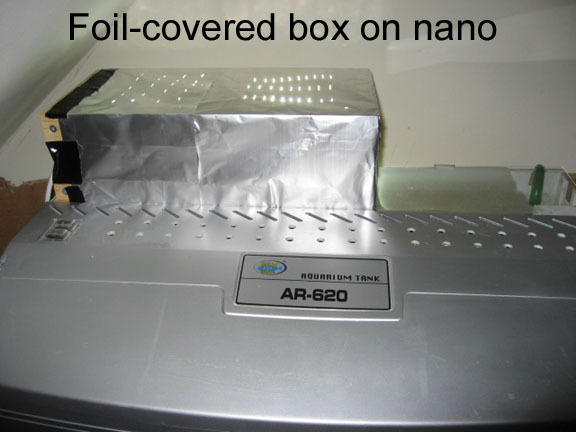 Ultra small (one inch thick), high light power, unbreakable, etc. 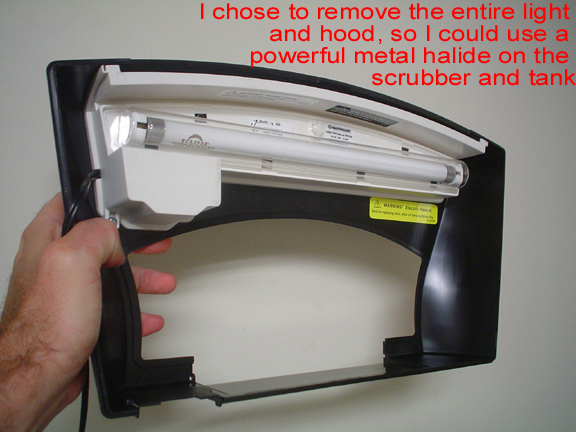 Basically the same scrubbing power as a level 1 in a sump, but the size of a book. Problem is, they are impossible to DIY. So my question is, would anybody want to discuss the building of something that they can't build themselves? 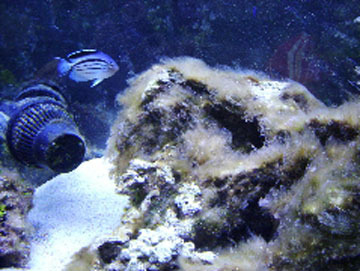 Johnt on the UR site: "corals are doing extremely well, the water is clear, and the rocks are starting to look like new. 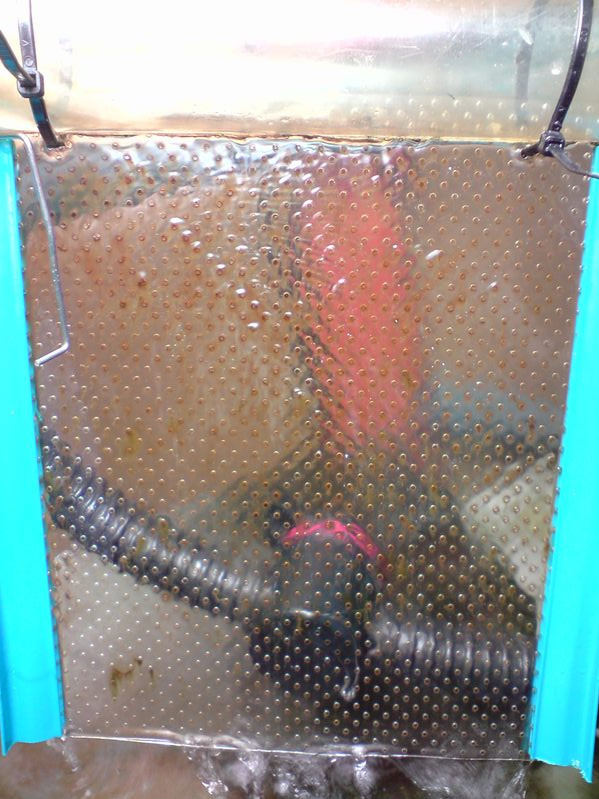 the scrubber is improving things; I'm getting better growth and the rocks are clearing, N & P are up and down a bit, as I keep cleaning the screen too well, but are remaining low even though I've not had the skimmer, rowaphos reactor or carbon running for 2 months." Sinful_Waters on the RS site: "Ok I couldnt resist! After reading and reading forum after forum, I had to know what all the excitement was about with the ats. End result, miracles happen! 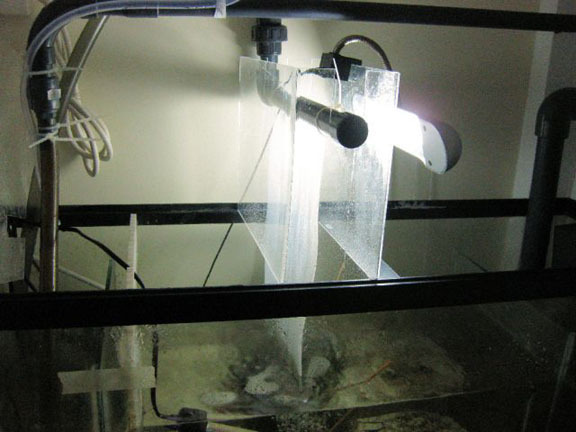 Ive spent the last year and a half battling the green stuff, with excessive waterchanges, phosphate reactor, etss skimmer, limited lighting period, pulling by hand, constant dusting with turkey baster, Lawnmower blen, blue leg hermit, lettice nudis, astrea snails, super clean sand, remote dsb, etc, etc, etc. The algae covered every inch of LR and was seriously suffocating my corals. What do we do when the tough gets going, we build an ats! 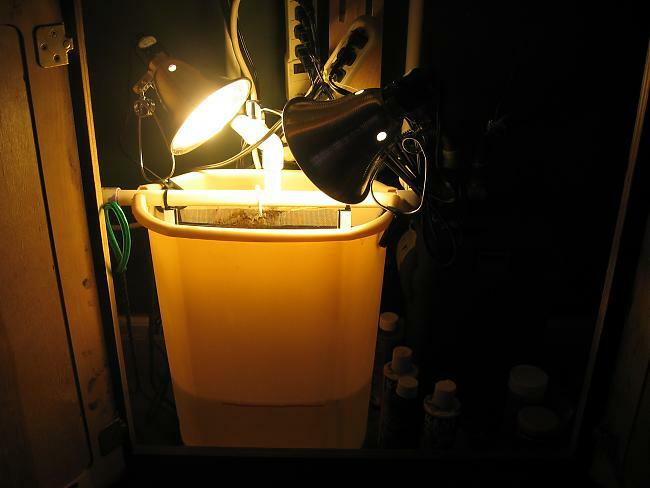 I did as was advised and built the 5 gal [bucket] with a doulble sided screen, two 21 watt, 6500k compact flourecent bulbs, and the flow is supplied from my overflow and returned into sump. 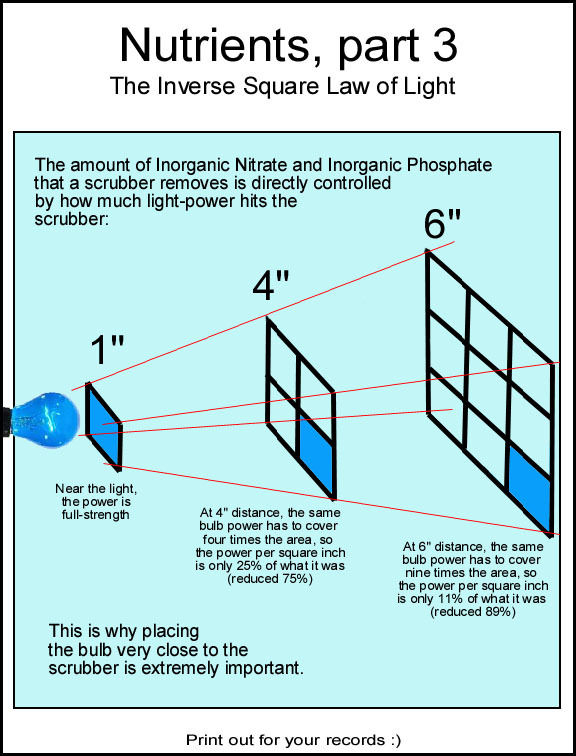 I do a light scrubb on the screen about every 4 days, and thats all. 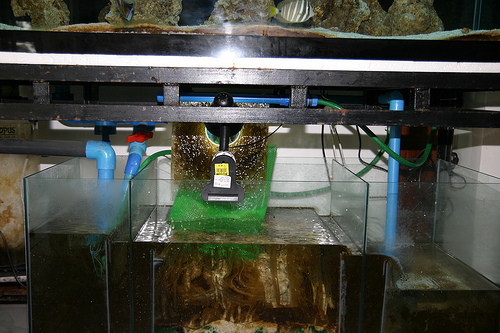 It actually took a few weeks to get the green going, but when it did the [nuisance] algae in the tank started to melt away. It went away so fast I was literally worried that my fish, crabs, snails would all be deprived of the green feast. Long story short, overfeeding is not in my vocab, and my sps, lps, corals have beautiful color and growth, with perfect tank conditions and stability. Being on a limited budget I couldnt be more pleased at the ease of the build and its amazinig effectiveness (excuse the spelling)." 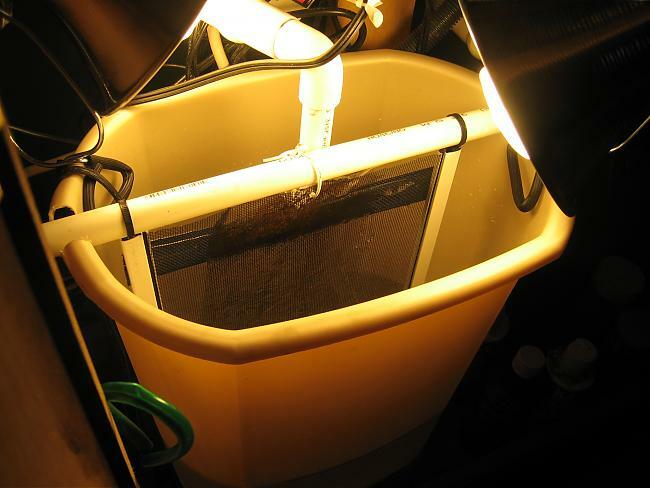 Keifer1122 on the RS site: "update: the ats on 75 gallon, almost 2 months, been put on with only about 20lbs live rock, [...] also 8 fish, 1 1/2" of sand. 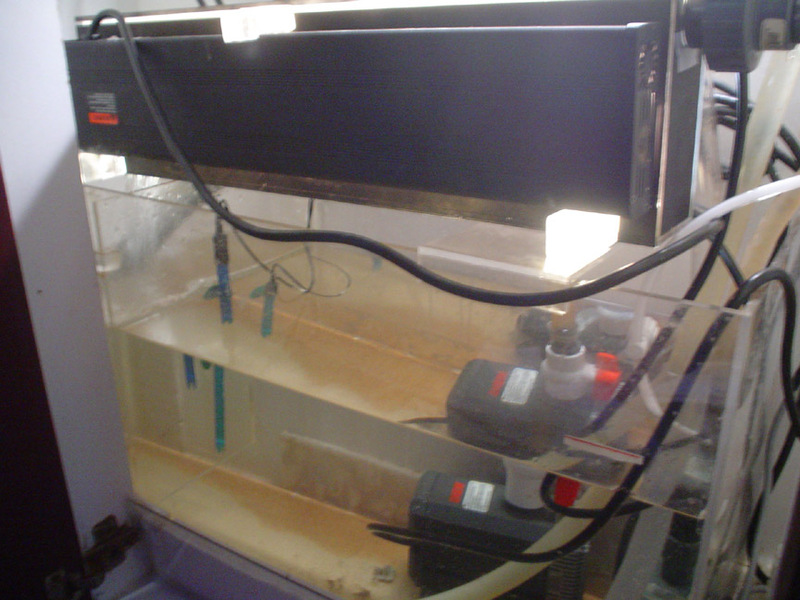 N & P undetectable, all params good, havent done a water change in 2 months. had to do about 20 gallon wc every week before the install. $$$$$$$. 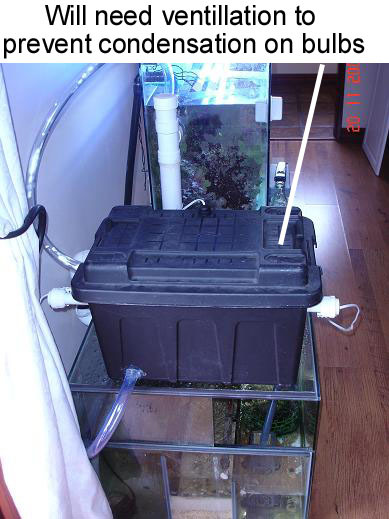 12 gallon aquapod with ats been about 17 days. 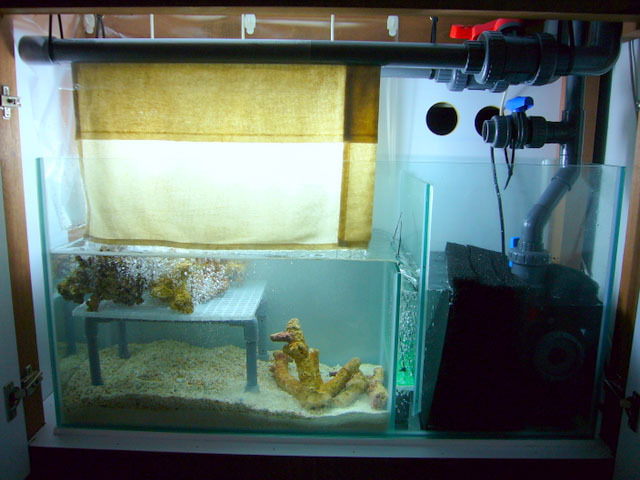 N is about 10, was 15 before the install, with pair of percs feeding 3 times a day pellets in the morning and afternoon, with a pinky nail cube of rods, also piece of silverside every week for the Bta. the numbers arent falling fast, but its steady (with a 2gal water change i could boost the process or just cut feedings). coral growth: everythings growing like a weed including my yellow m.digitata that i got along with my screen from inland aquatics. all in all, tanks look sweet. life made easy." 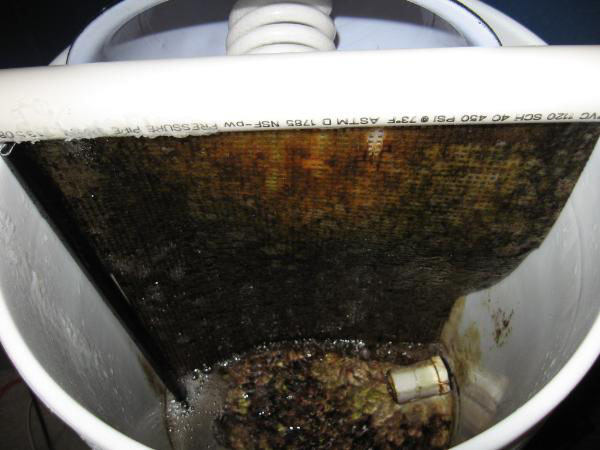 Arab_NA on the MASA site: "My scrubber after 3 weeks, cleaning 1 side each 7 days: My PO4 went from 1.0 to below 0.1, and NO3 from 50ppm to 0ppm. I am feeding 3 times a day now and have no problems at all! 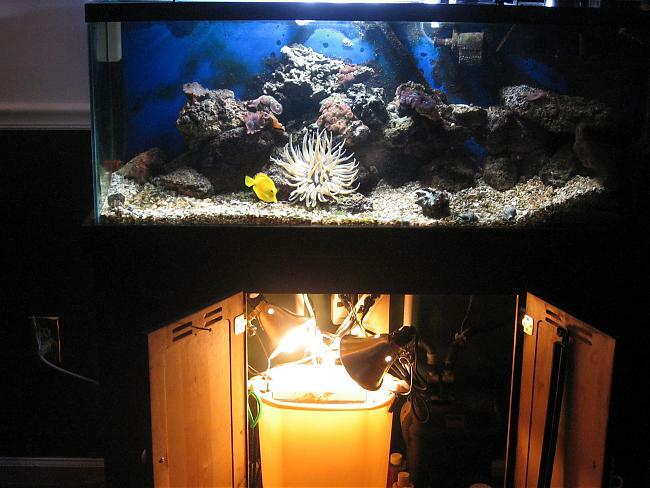 Thanks SantaMonica for saving my tank and giving me back the love for this stunning hobby." mudshark on the Masa site: "WOW things are starting to happen now. 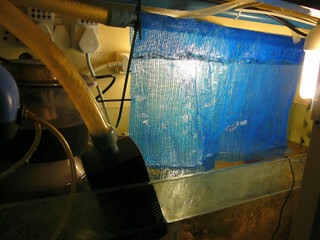 The algea is getting really thick on the screens after 20 days. 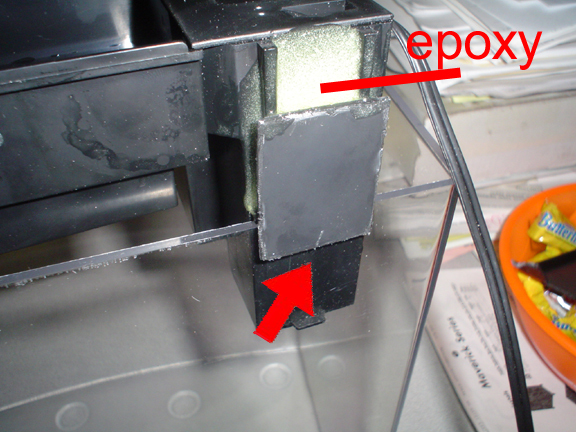 I measured phosphate, which has always been low, as it was being used by algea in the display. It read a big fat 0. 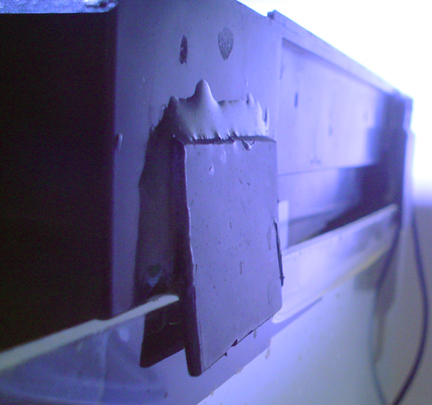 In fact it seems to be at a crossover point where the algea on the screens is growing faster, and regressing in the display. 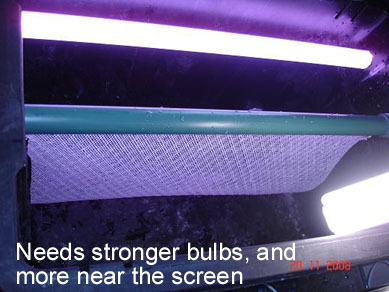 I've taken some pics of SPS colours now, altough they have already improved since the introduction of the screens. I'm hoping to post some further improved colours at a later stage." 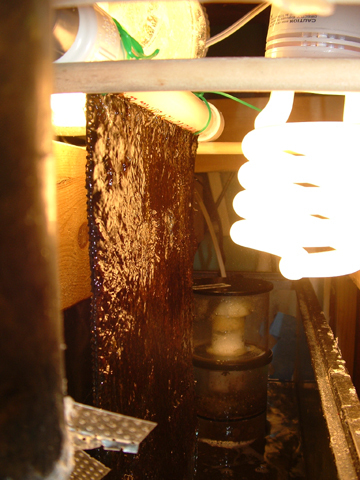 Sly on the SWF site: I've had my scrubber running since September. When I started, my phosphates were 8-10 ppm or maybe higher. 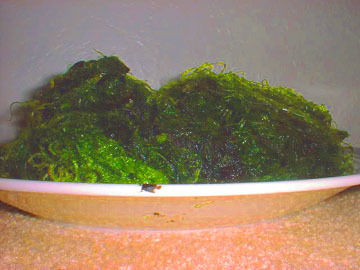 The test water turned a very dark blue, indicating high phosphates. Today I did a test and can verify that my phosphates are now between 2 and 4 ppm. 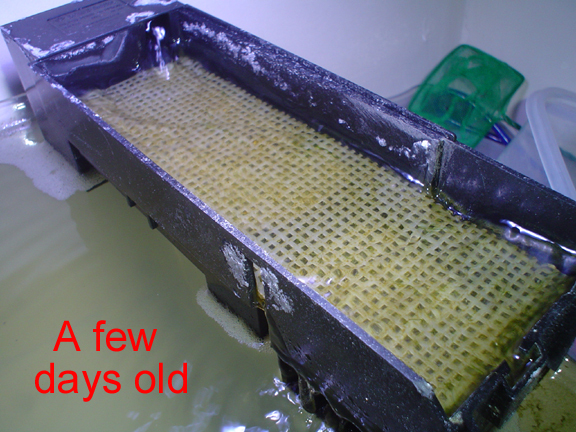 I am still getting massive growth in the scrubber.. 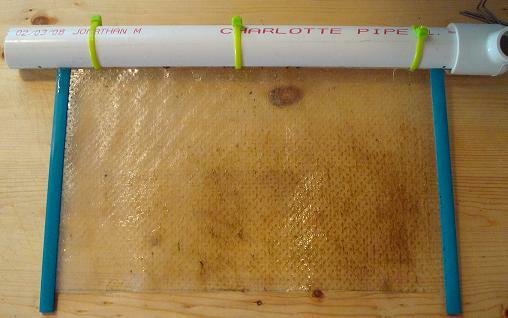 So far the nitrates have reduced some, but not much... maybe by 5 ppm. I am seeing the greatest reduction in phosphate so far. Maybe the nitrate will start going down some more as the phosphate gets consumed completely. Some background: Tank has been running for 7 years. 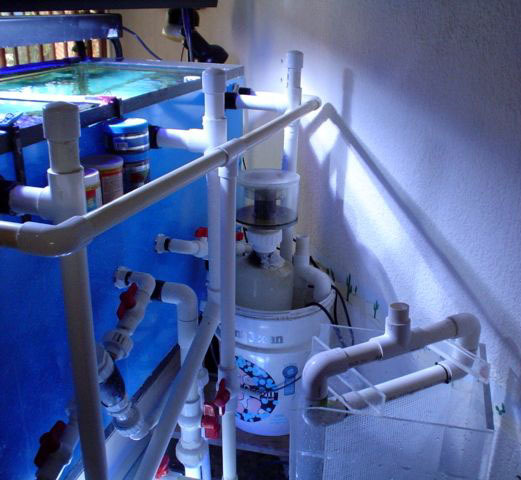 Using RO/DI water, ozone, refugium with macros, UV sterilization, skimmer and [now] scrubber. I don't really do water changes. The last one I did was sometime in 2007. I have had high phosphates for quite a while, and nitrates have been higher than I wanted, but still manageable. 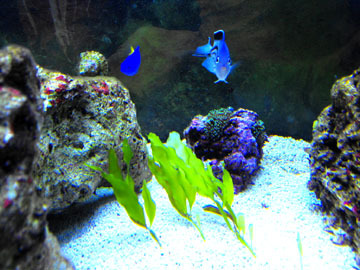 My fish and corals are still growing and thriving. 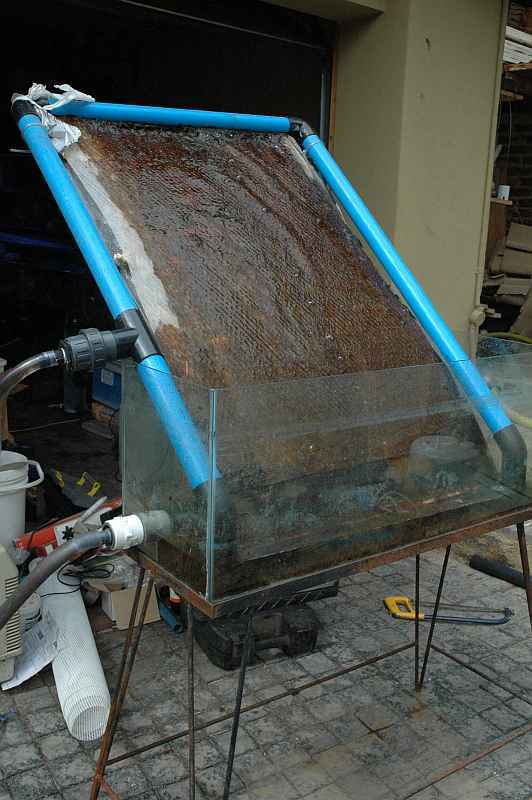 I have never seen anything that would reduce the phosphate in my tank. 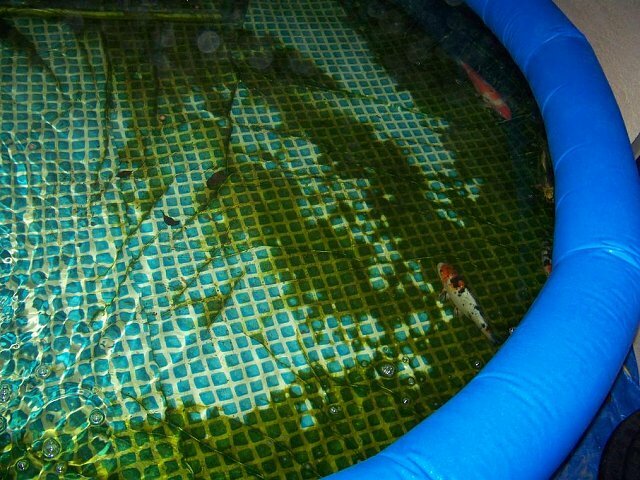 Even water changes only lowered them momentarily. They would go back up in just a few days. This is the first time I've ever seen a reduction in phosphates. I suspect that in another month they may well be at 0ppm. 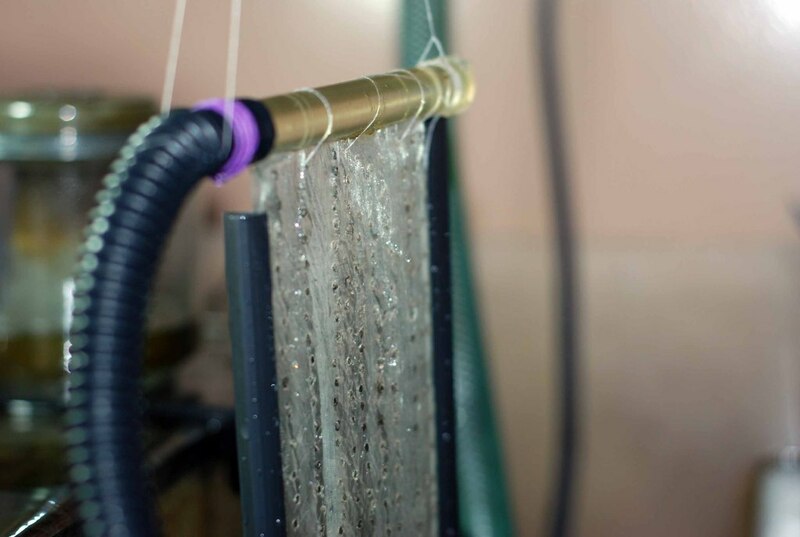 Nitrate reduction still remains to be seen. 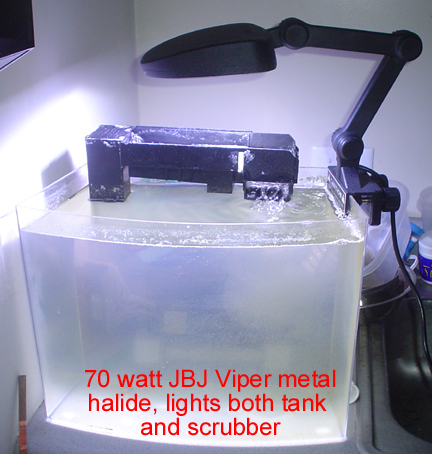 Overall though, I think the scrubber was a positive addition to my tank. I'm finally starting to get some more corraline growth like I used to have. 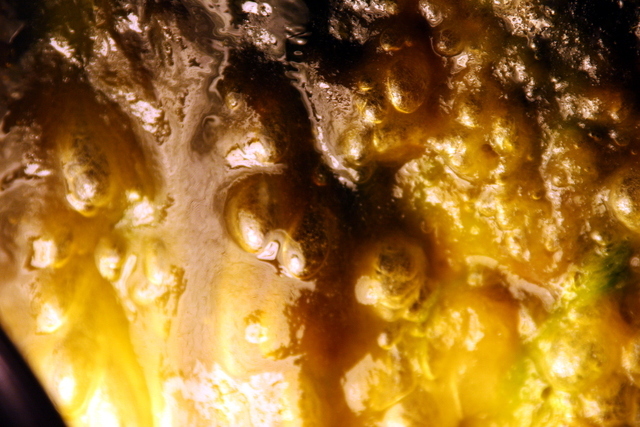 The growth is slow but I do see a definite increase in the vibrance and quantity of corraline in my tank." 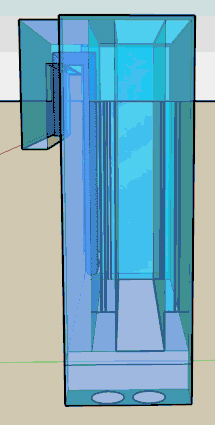 How tall should the screen it be? 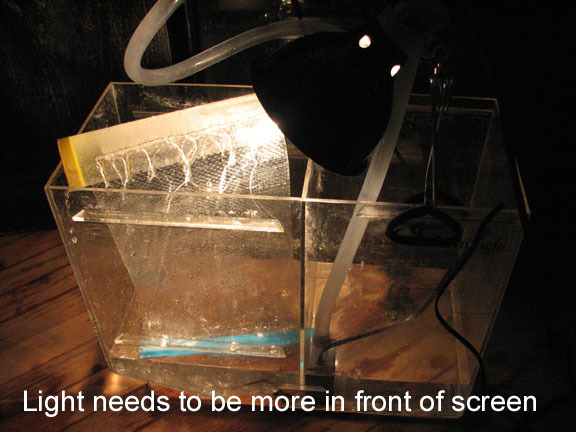 That is determined by how much screen area you need, which is determined by how many gallons you have. 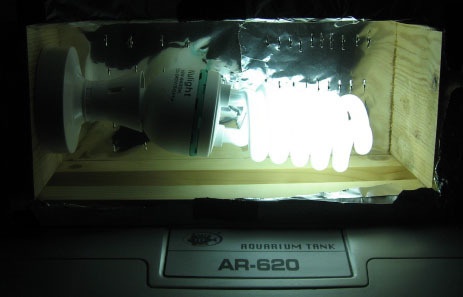 Try to get one square inch of screen (lit both sides) for every gallon. 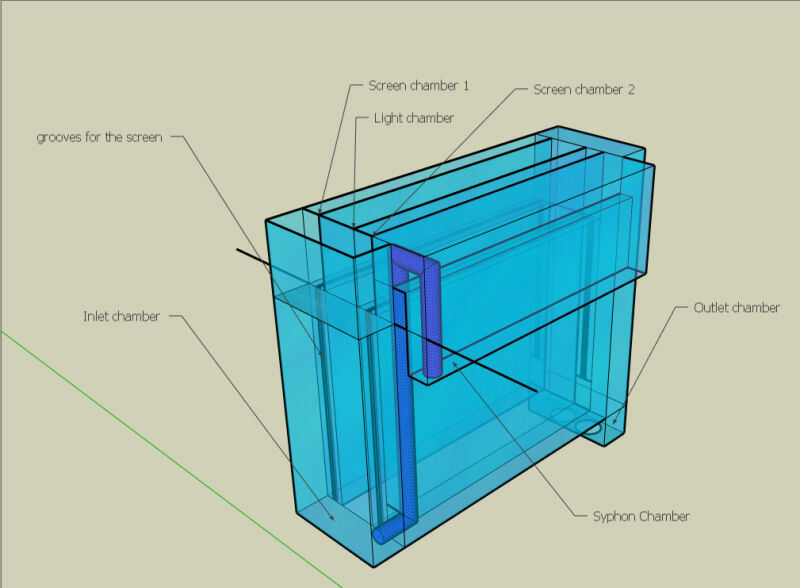 If lit on only one side, double the screen area. 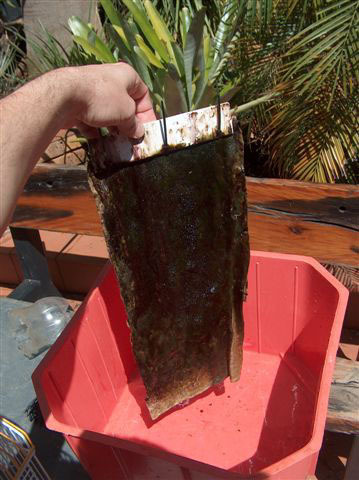 Eric Borneman: "What turfs are, essentially, are excellent nitrogen and phosphorus uptake species, with a number of benefits over many other species: faster growing, less invasive, more efficient and less toxic than macroalgae, much more efficient by fast growth than Xenia, and far more effective in most tanks than seagrasses (which require so much more light, sediments, symbiotic microbes, benthic nutrients, and space) or mangroves. 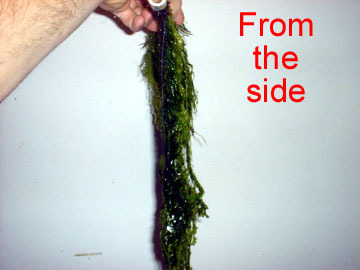 The big benefit of turfs as nutrient uptake and export, if needed or desired (by removal of the turfs as they grow), is that they grow faster than macroalgae in biomass, are generally not producers of prolific secondary metabolites (their defense and competition is fast growth), and they are confined to a specific area and are thus not invasive. 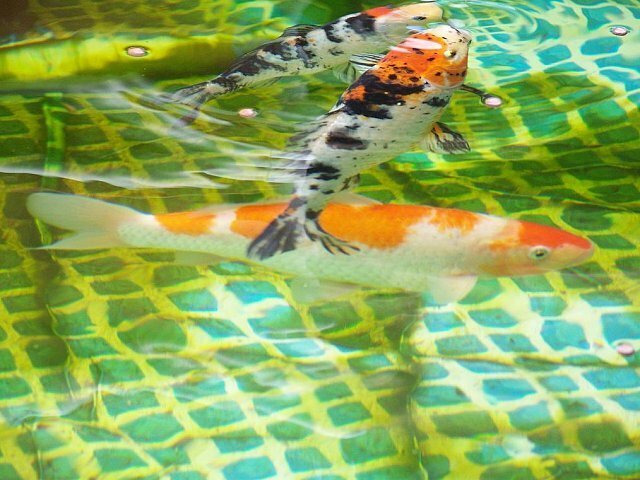 Even if some get released into the tank, they are very palatable and are a treat for herbivorous fishes and invertebrates. 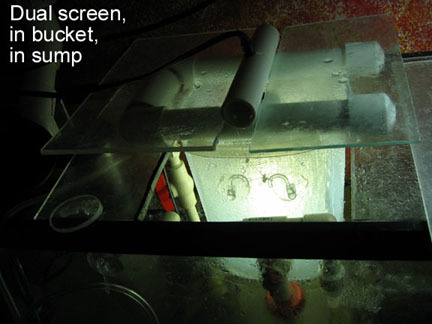 In fact, turfs are havens for copepods, amphipods, ostracods, and polychaetes, favoring their reproduction." 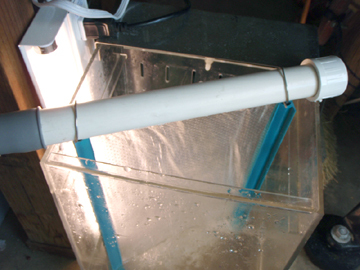 Tom Barr: "You might also suggest this to folks, you can prep this [scrubber] filter very easily by using a bucket and the pump and getting a good film of growth outside (if possible , near a window with direct sun light) on the screen prior to use in the aquarium; no waiting for it to get all furry. 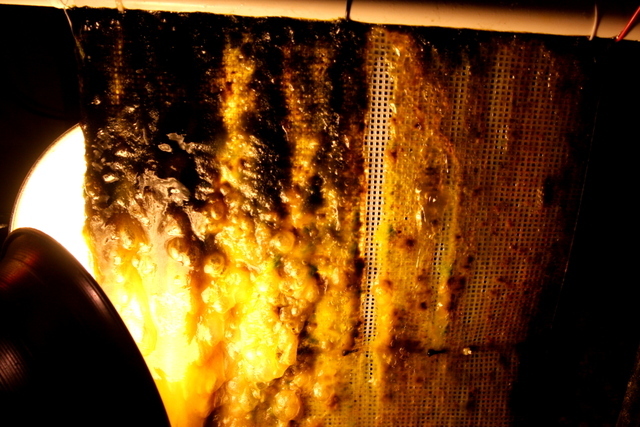 This is pre cycling for an algae scrubber. 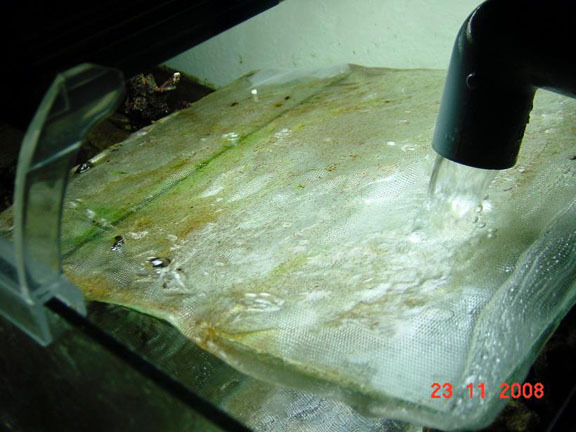 There is a little sloughing and adaptation once you place in the tank, but this will accelerate the process. 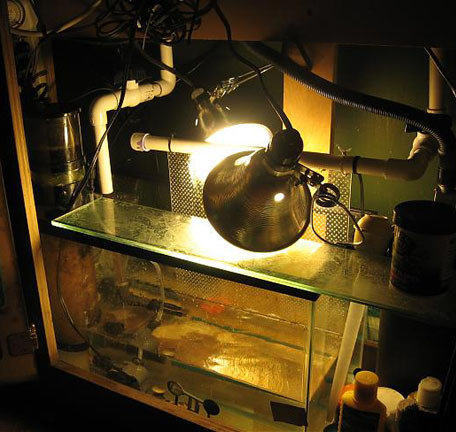 Use a bucket to prep things instead of the aquarium, this way you can get on top of things and cycle the tank much faster, essentially bypassing the cycle altogether, a so called "silent cycle". 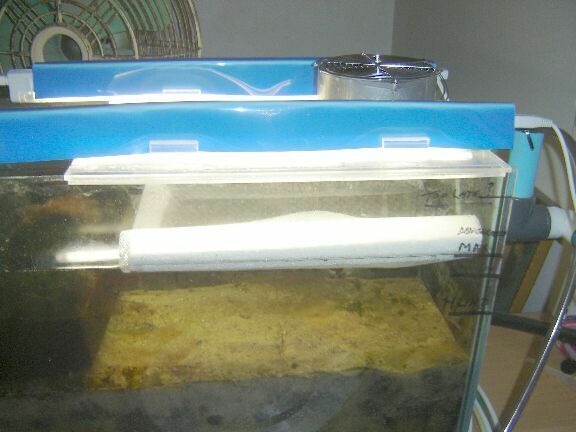 Algae remove NH4 [ammonium] directly, so there's no NO2 or NO3 build up. 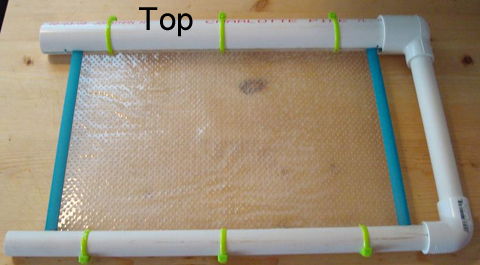 No need for bacteria (they will form later anyway, but will have a less prominent role). 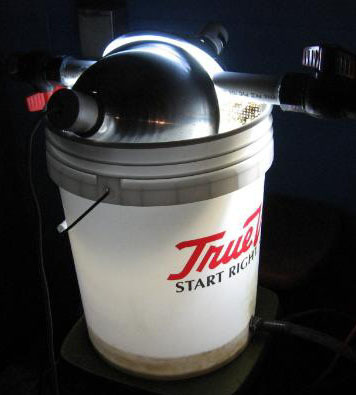 For folks that do FC ["fish cycling" in FW tanks], they should prep their algae filters in a bucket, not bomb the whole tank with NH3 [ammonia]. That's foolish to do that." 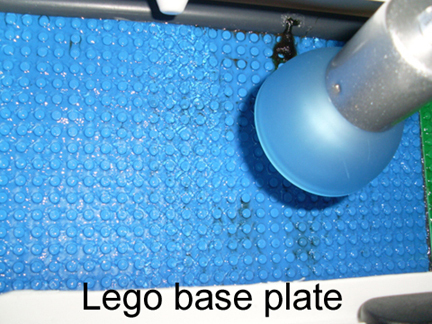 They are available all over the web, and at almost every toy store and discount store. 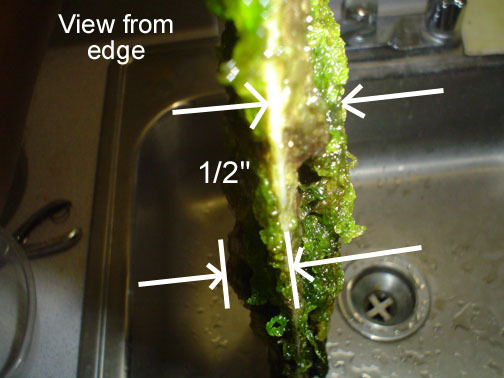 The beauty of these plates is that no matter how hard you clean/scrape, algae will still remain in-between the pegs (except the first week or so, where it will all come off anyways). 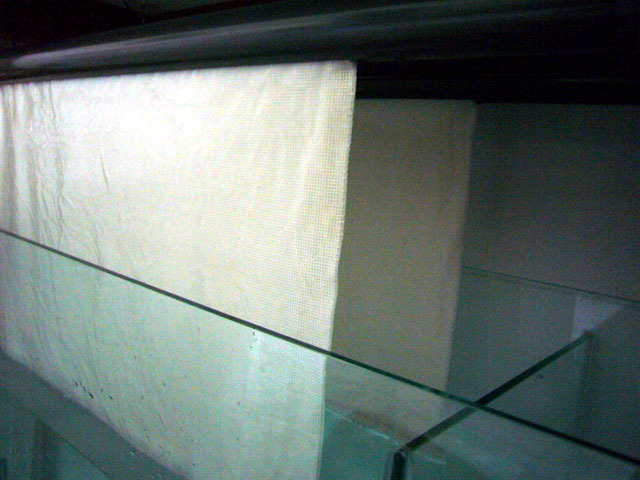 Of course, you'll still want to sand/scratch all the areas in-between the pegs, but overall this looks very promising, if someone else would like to try it. 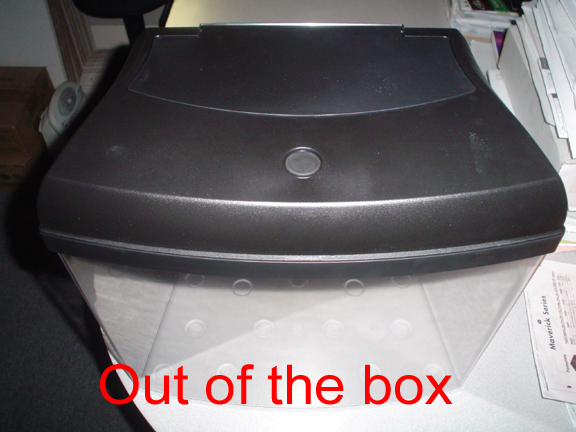 One disadvantage is that the plates are not (at least that I could find) available in clear, so a light on one side does not benefit the other side like it does with a screen. 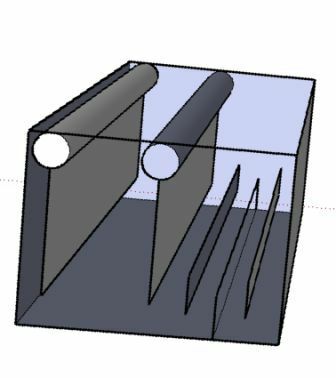 But since these plates are only formed one-sided anyways, it might not be such a bad thing, and indeed would be perfect for a twin-screen one-bulb setup. 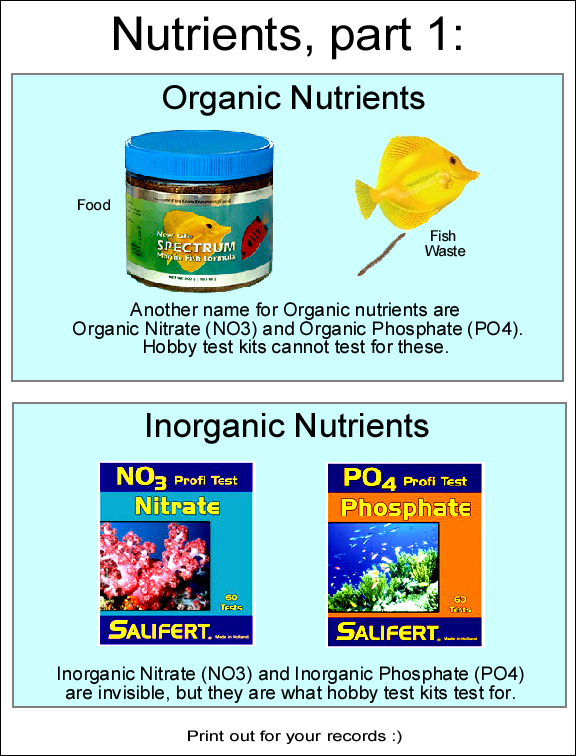 Inorganic Nitrate and Inorganic Phosphate. stays in your water, which is what you read when you test. 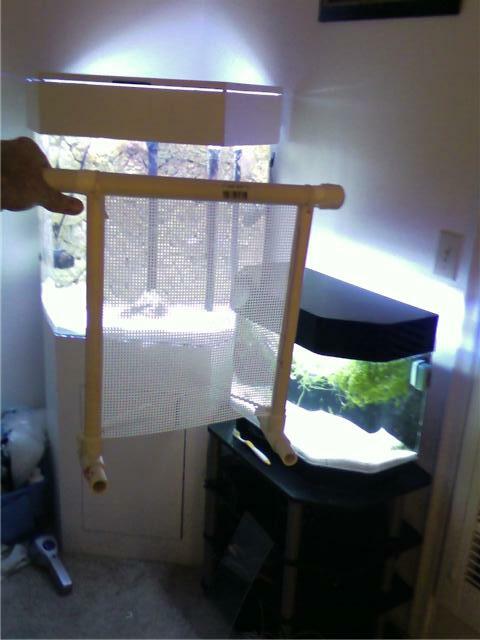 brianhellno on the MFK site: "Just wanted to share my success with a turf scrubber with my freshwater tank. 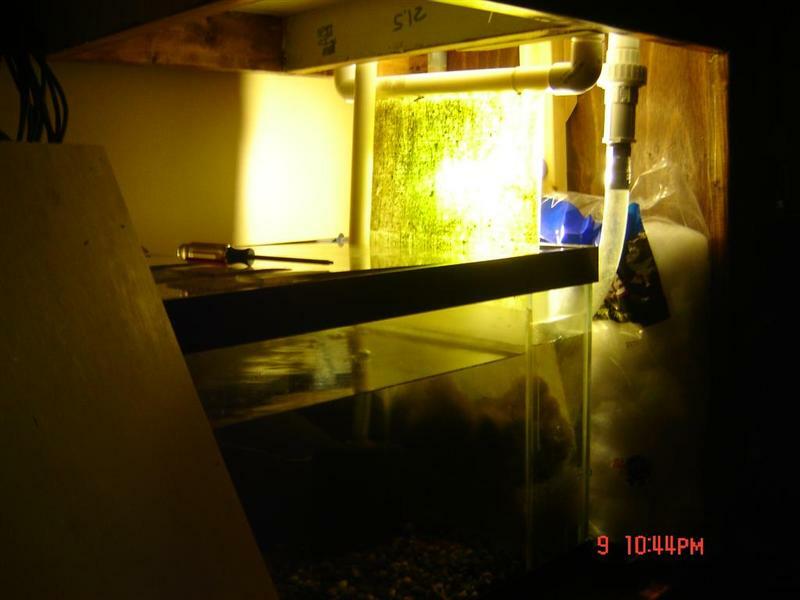 Currently I have a 125 with (5) 6-inch piranha, (6) 4-inch giant danios, about (20) 1-inch baby black cons, (2) 2-inch green terrors, (2) 2-inch jack dempseys, and (1) 2.5 inch blue malawi cichlid. 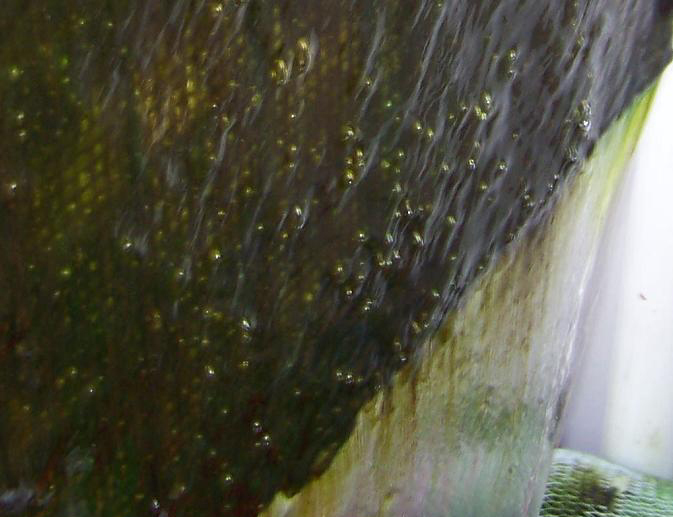 The smaller fish were all supposed to be feeders, but the piranha ignore them. 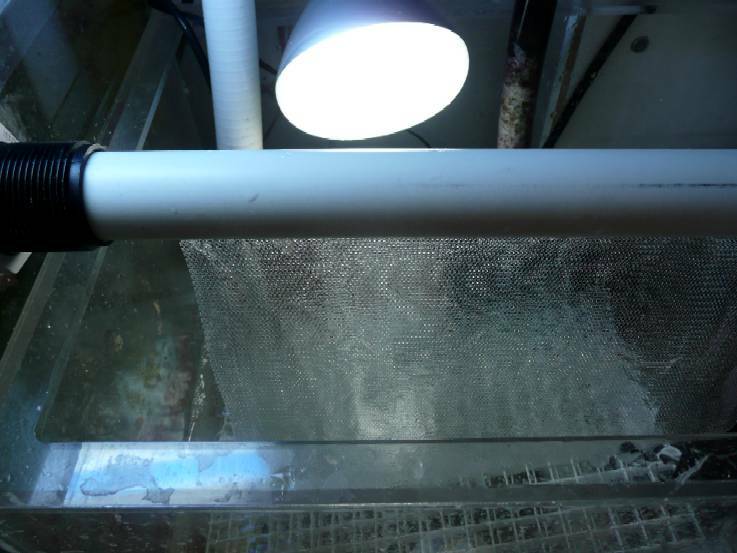 Anyways I've had the scrubber up and running for almost three weeks now and I finally tested the water parameters: Ammonia 0 ppm, Nitrite 0 ppm, Nitrate 5 ppm. Not too bad! 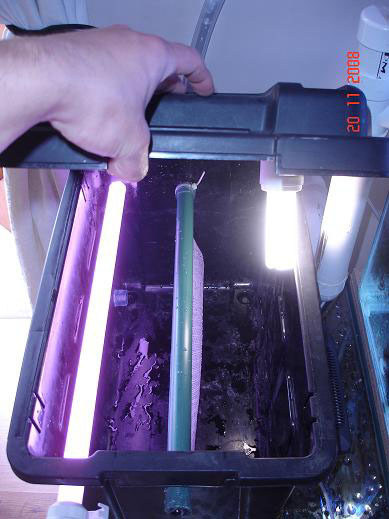 Usually the Nitrate sits around 40 to 80 ppm right before a water change, so this is definitely an improvement. All I can say is thanks for the great idea! 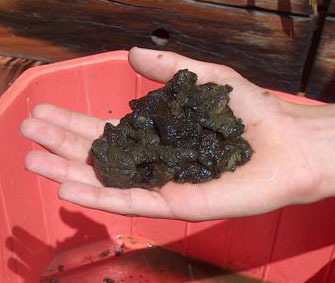 worley on the scrubber site: "Well just got my phosphate test kit and did a test... *drumroll* .... 0ppm. 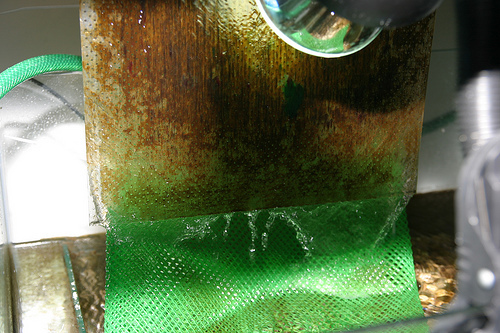 It's the API phosphate test kit, and it was the very lightest green on the salt water card (0ppm). 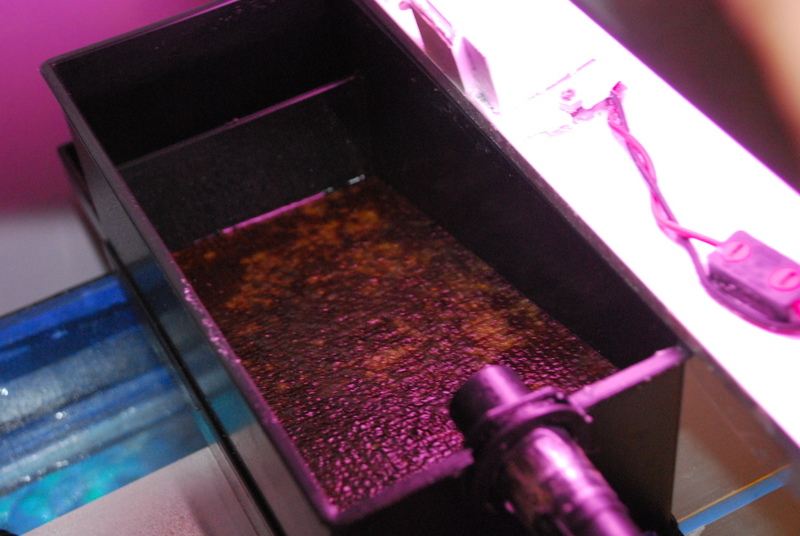 That's a great result, especially as I'm now feeding tonnes into the tank, 1 block of brine shrimp and 1 of mysis, plus some live brine (fed with live phyto a an hour before feeding to the fish) and some pellet foods. 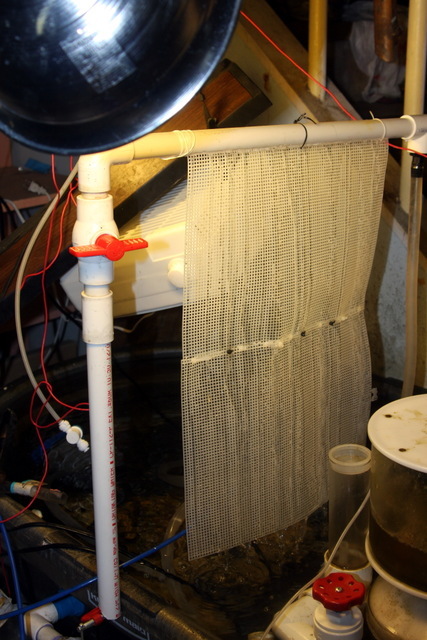 [...] I still can't get over the phosphate test, and how low the nitrates are considering there's not been a water change in 2 months and so much food has gone in. 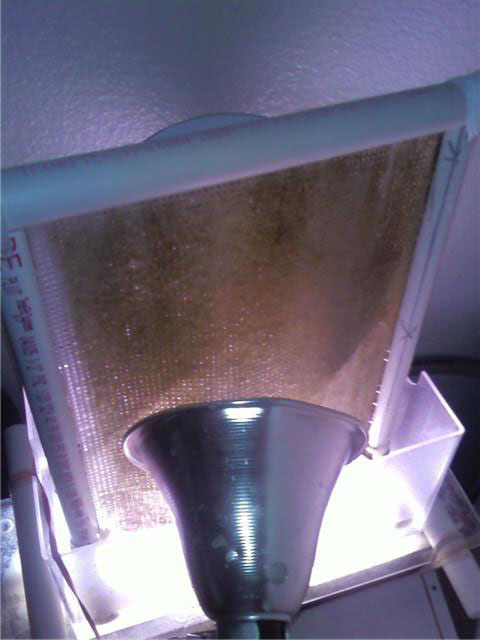 jan on the RPhil site: "Today is my 24th day of cycling, I measured my water my parameters and here are the result: Nitrate 0ppm. 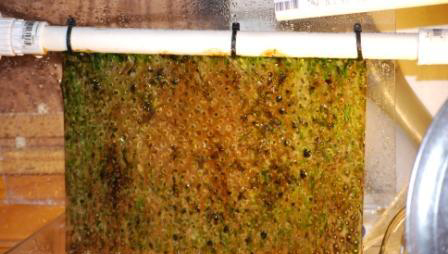 Turf algae is almost all over my screen Razz !!!! thanks for this great Idea! 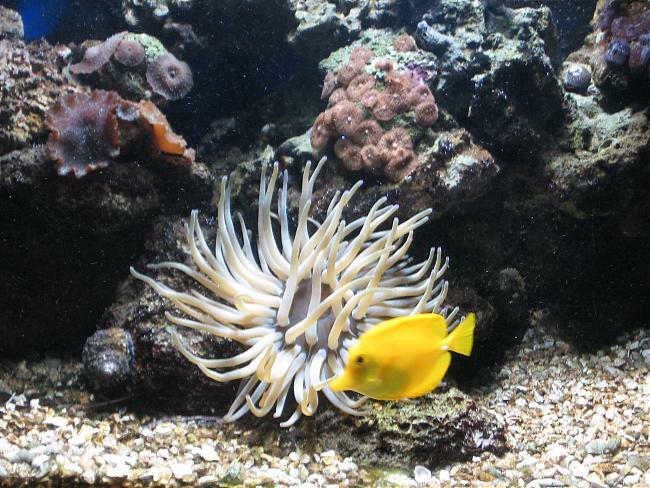 Feeding update: I've begun increased feeding, because my clown tang is getting skinny, and also because I want to try to keep a variety of non-photo NPS corals. 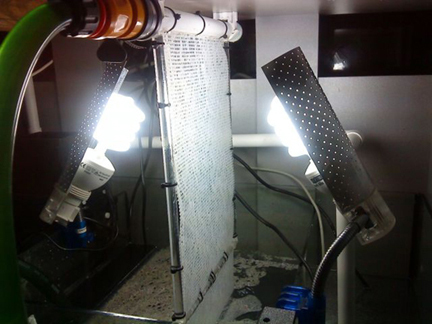 So in my 90g with scrubber-only filtration, I'm currently feeding 4 cubes mysis, 5 ml Reed's Shelfish Diet (phyto), 5 ml Reed's Rotifeast, and 5 ml Reed's Arctipods (copepods), and 2 krill (for white eel) daily. Also one whole silverside weekly (for blue eel). 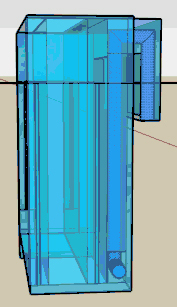 For reference, 1 ml is about 2 pumps from a typical phyto pump bottle. 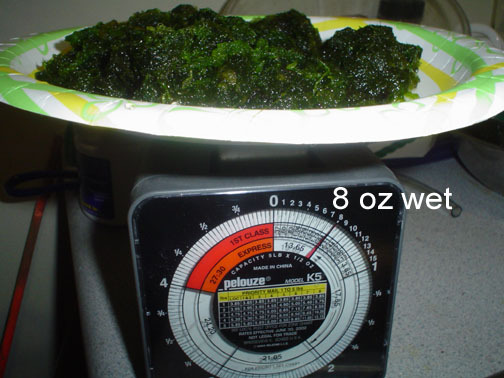 Since I increased to this amount, I'm now getting my first detectable readings in several months (Salifert). 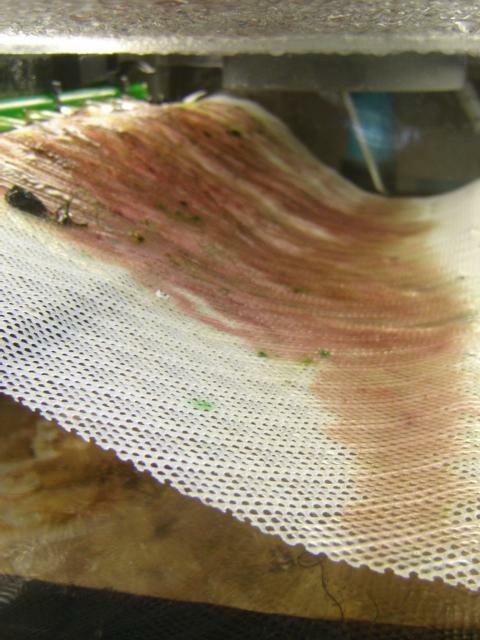 Nitrate is a slight pink... varies between .1 and 1. 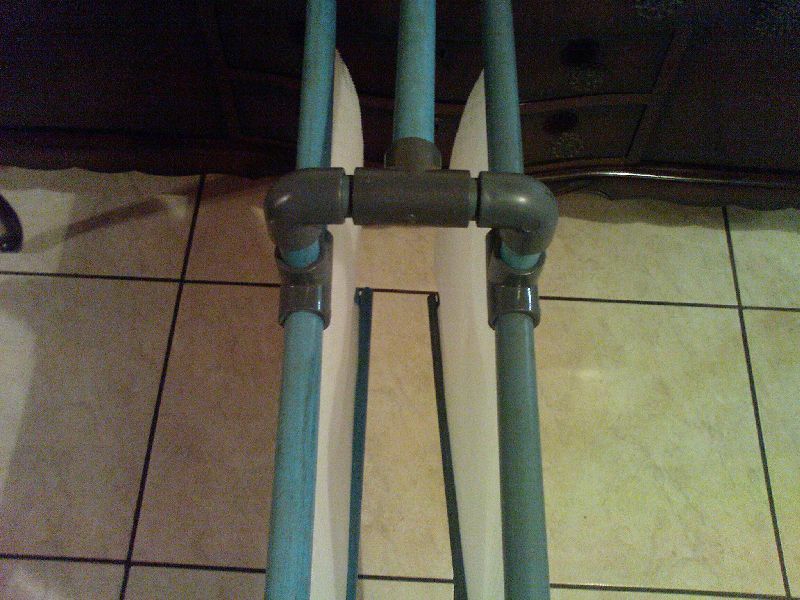 Phosphate is a barely visible blue; sometimes I'm not sure if it's really blue or not, but it's definitely not the crystal clear it used to be. 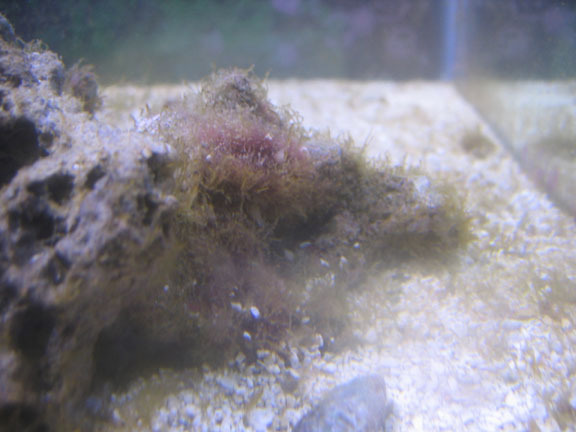 Pink coralline is continuing to take over, and the last two square inches of nuisance film algae disappeared last week. 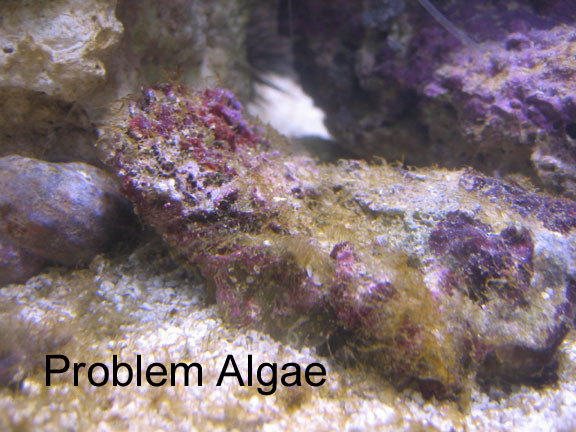 Some spots of cyano are still trying to hold on, but the coralline is overtaking them. So the goal now is to see how much I can actually feed while still keeping N an P low. 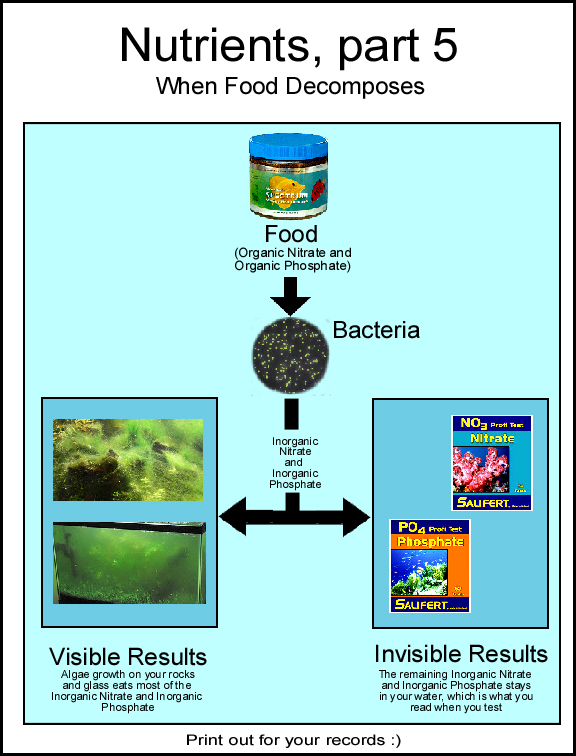 I don't think they need to be undetectable; I think my goal is to keep nuisance algae from forming, while at the same time being able to sustain non-photo NPS corals. 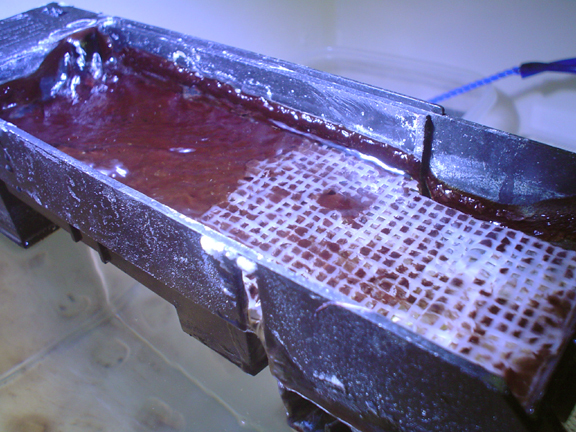 BTW I added a few SPS frags on my new frag tray, and they seem to be doing well. 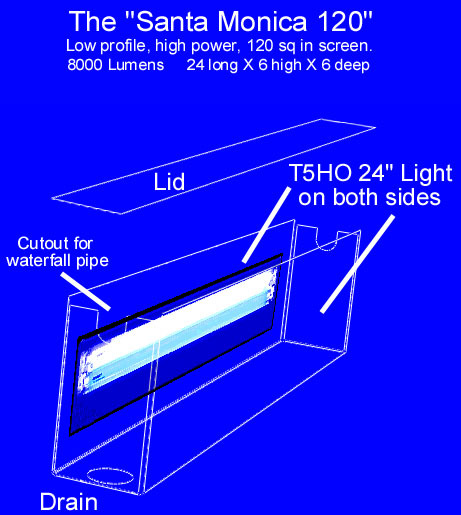 One-light between two-screens: Makes better use of the light, but leaves the other sides of the screens unused (in the dark), thus wasting half your flow. 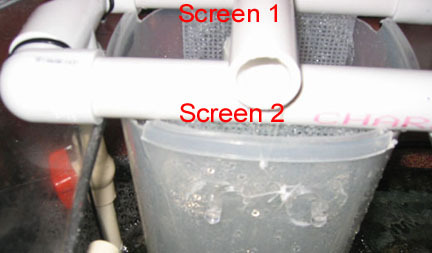 The big advantage is cleaning: You can clean one screen, and leave the other in operation, which give you more consistent filtering. 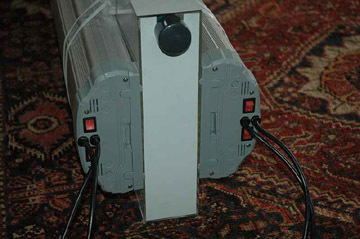 Two-lights on one-screen: Makes better use of the screen (both sides are lit), but can waste light if not reflected properly. 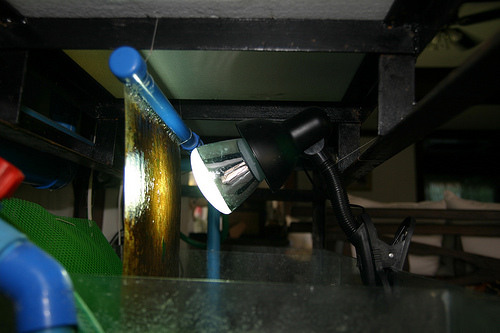 Advantages are (1) redundancy of the lights: If one goes out, you'll still have filtering until you can buy a replacement, and (2) higher performance for its size, since each side of the screen gets hit by light from both sides, especially right after cleaning when the algae is thin. Best of both worlds: Multiple lights between two screens. 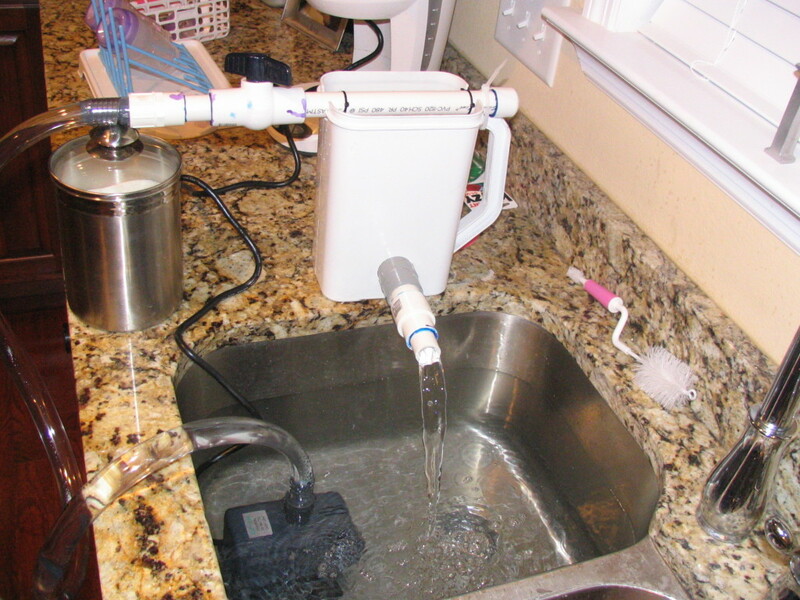 Uses the most flow and power, but is always filtering, and will never go totally "dark" unexpectedly. 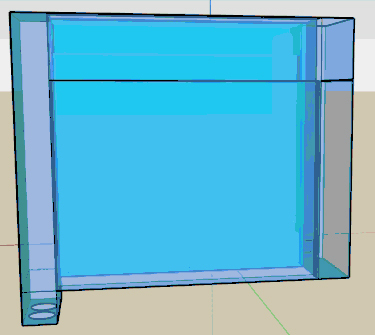 Doesn't need to be a smooth cut, since water will be draining down through the holes anyway. 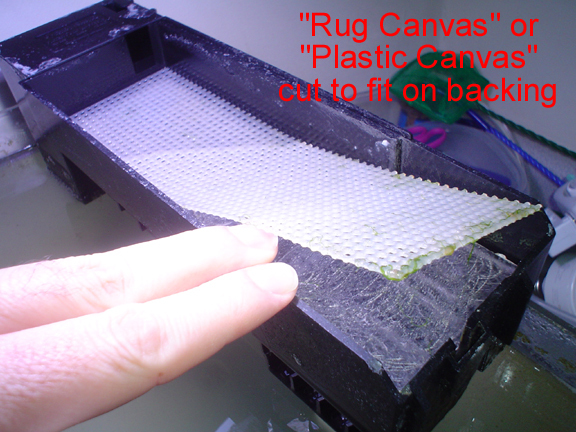 Rug canvas is preferred because it lets the algae to attach better, but since rug canvas is flimsy, you'll need to epoxy it to the backing. 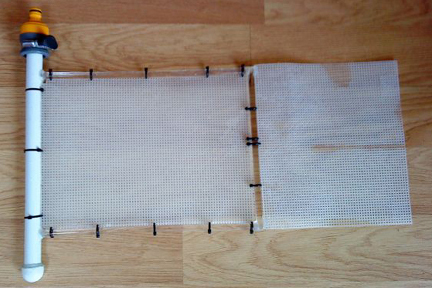 Plastic canvas (pictured) is rigid and can just be set down on the backing, but it does not hold algae as well. That's it! 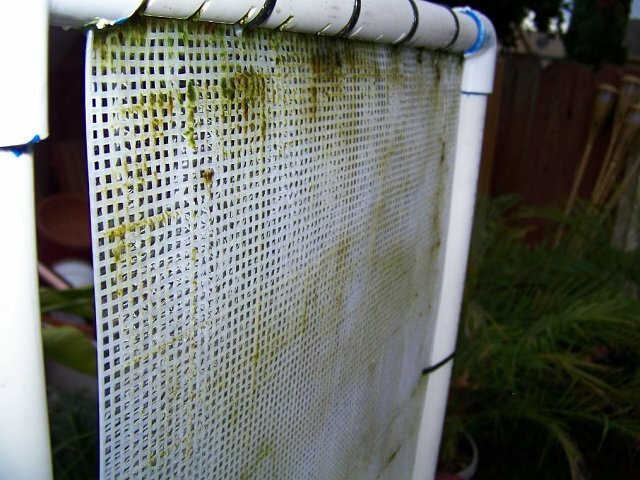 Post your nano scrubber pics! 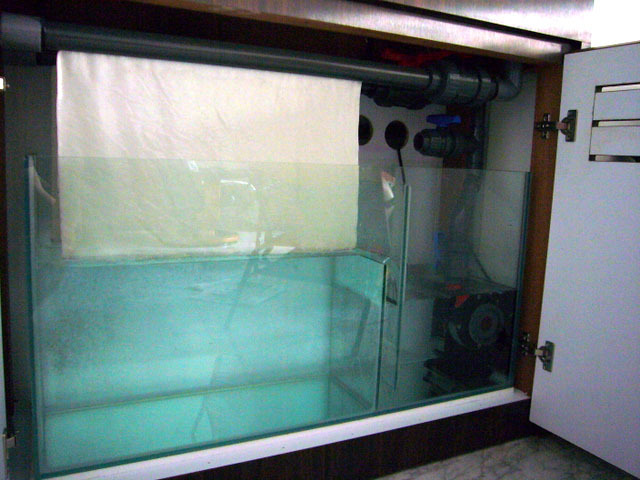 small_ranchu on the MFK site: "Here is the progress on my goldfish tank. 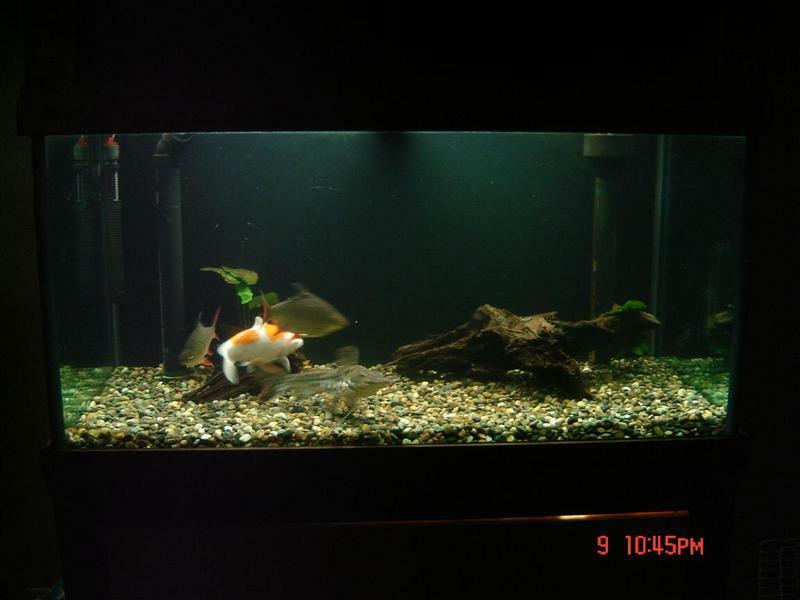 90 gallon tank with 3 goldfish + heavy feeding. 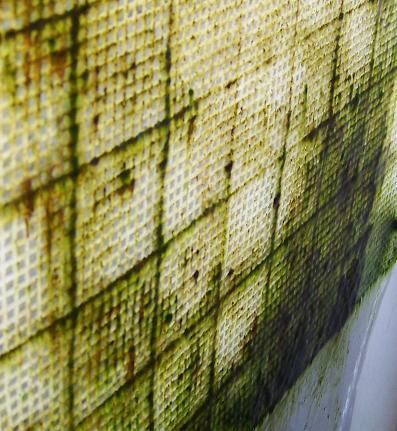 Nitrate reading at the end of the week is usually around 40 PPM with a lot of brown algae on the wall. 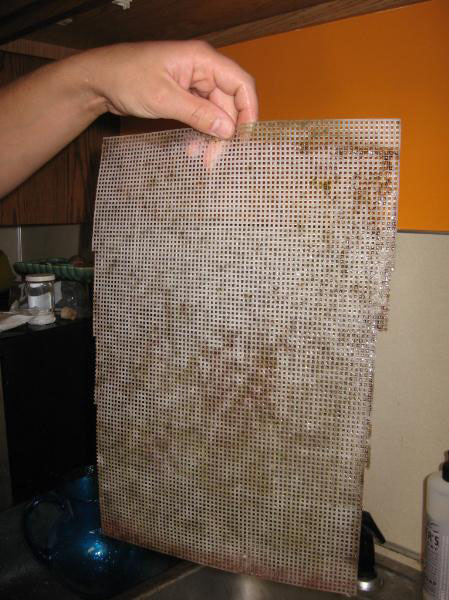 After 1 month of installing the Scrubber filter, Nitrate reading is 10 PPM and brown algae is disappearing slowly." 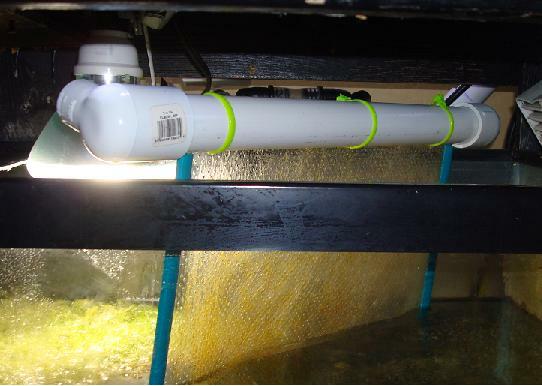 argi on the MD site: "I set up my scrubber on my 54 gallon tank a few weeks after its initial set up (it has been running for around 3 months now). One thing I have noticed on this tank compared to all my past tanks is the lack of algae growing on the glass. 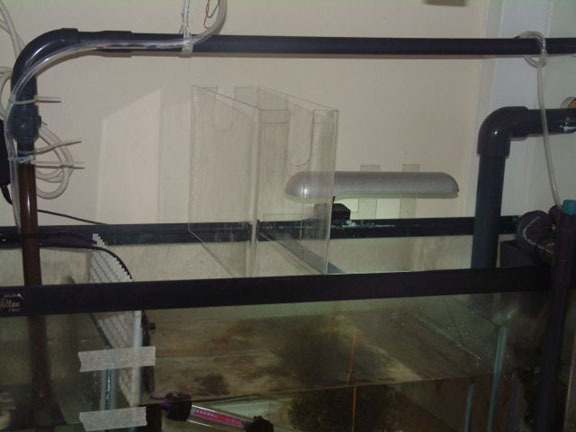 In the past I always left a magnet cleaner in the tank because I would have to scrub the brown diatom algae off the glass at least once per week. Now with this current tank I haven't had to clean off the glass nearly as often. While I still clean it, usually weekly to every other week, I can still see in the tank after 2 weeks!!! 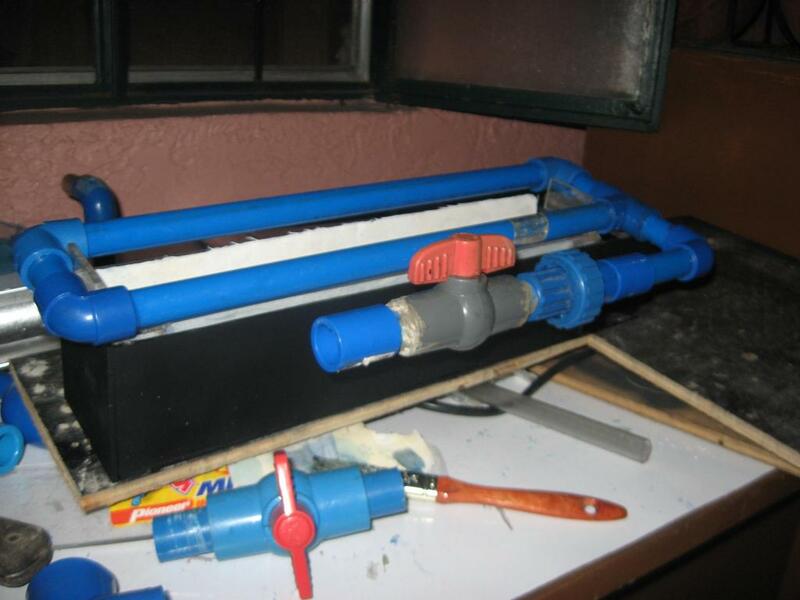 So far I am very happy with the results." 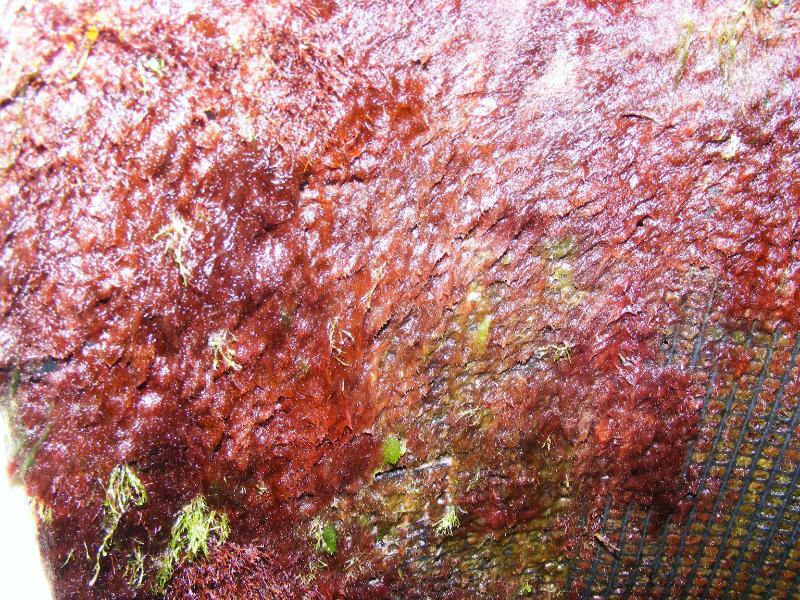 johnt on the UR site: "after 10 weeks of running a screen I can say it's the best method I've used, it also takes out metals and other nasties, and I've not even reached the turf algae stage yet. 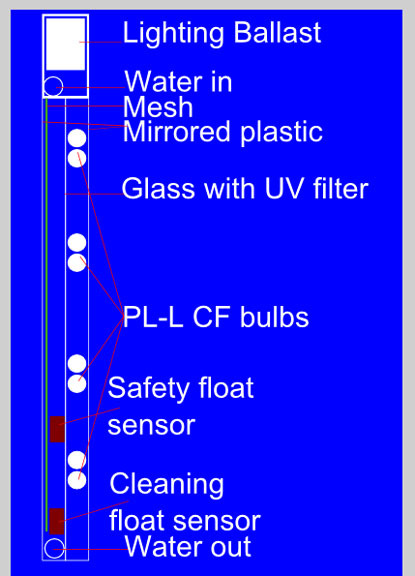 In the 10 weeks it's been running I've not run any reactors or the skimmer (I'm saving a small fortune not having to buy phosphate remover). 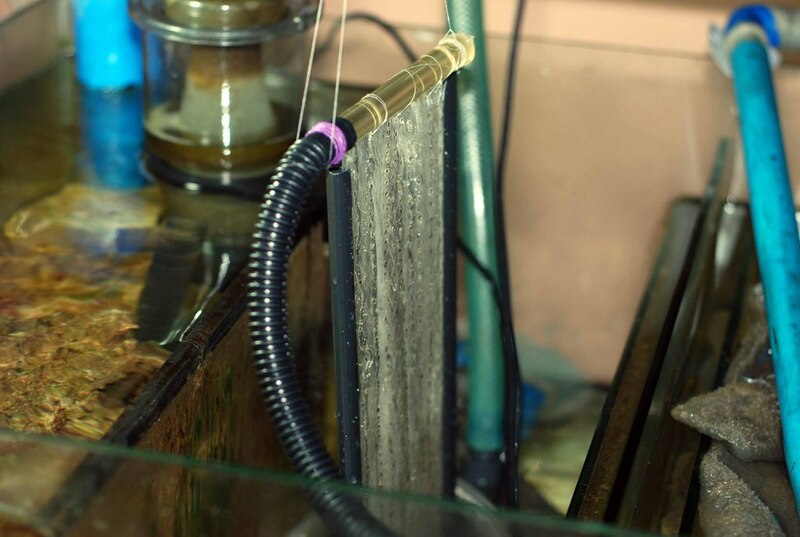 I'm still running the refugium, Chaeto and deep sand bed, all corals are doing exceptionaly well, N&P are remaining low and rocks are looking better by the day." 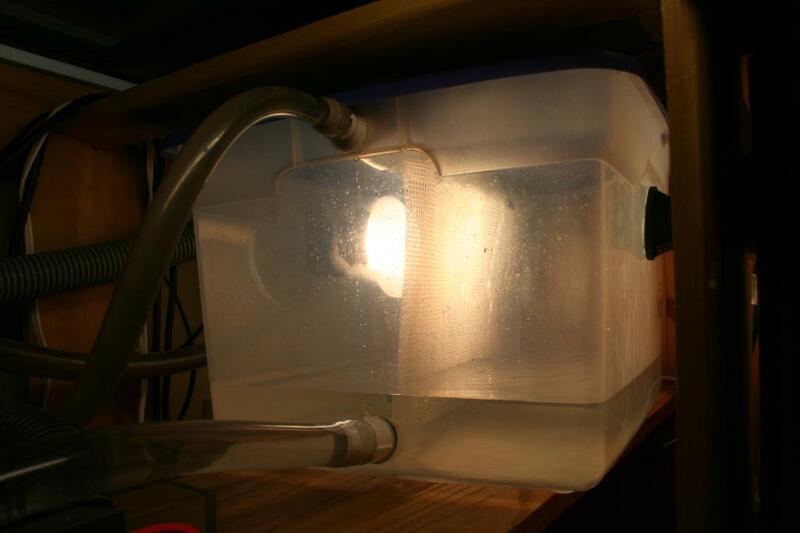 Elliott on RC: "I built one about 5 wks ago and so far it seems to be working well. 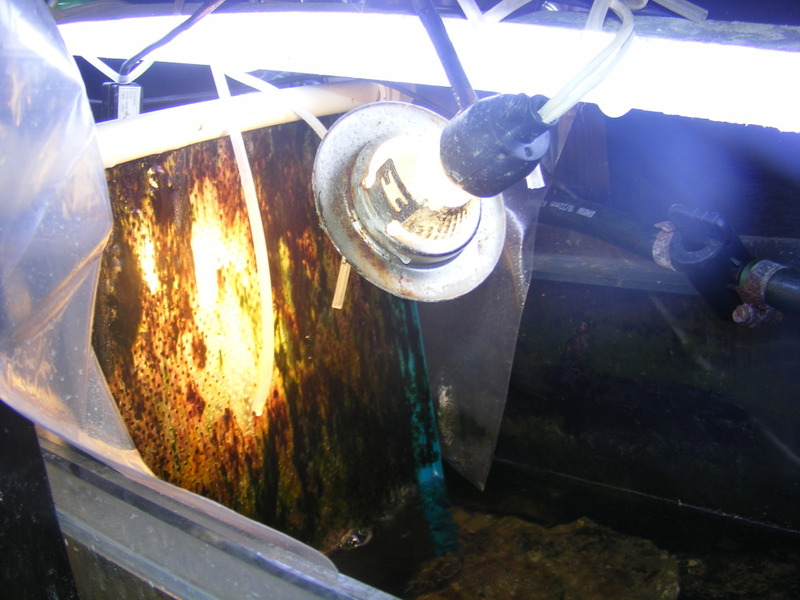 My cyano has diminished and there is less cleaning to do on the glass." 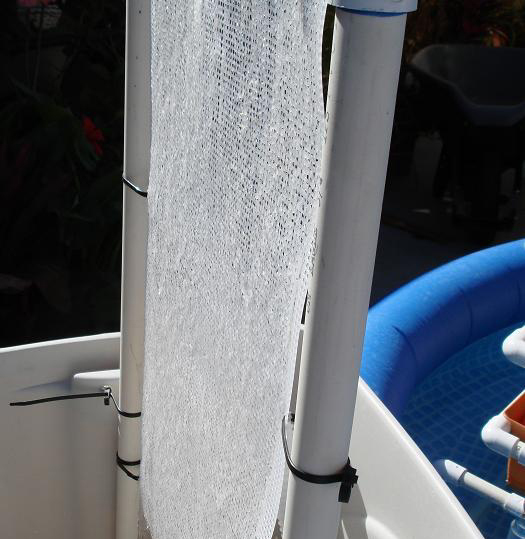 Mtroboer on the MASA site: "my algae is already visibly starting to disappear after only 1 1/2 weeks! Also added a PC Server fan in front of the screen and dropped my temps from 29.8 avg to 25.8 avg, saved me from buying a energy hungry chiller! 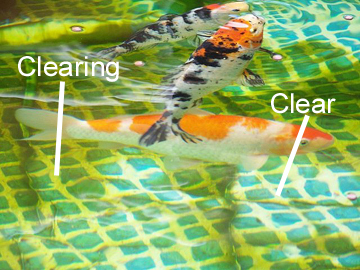 First time in little more than a year I got to see results regarding getting rid of nuisance algae as well as dropping my high tempratures!" 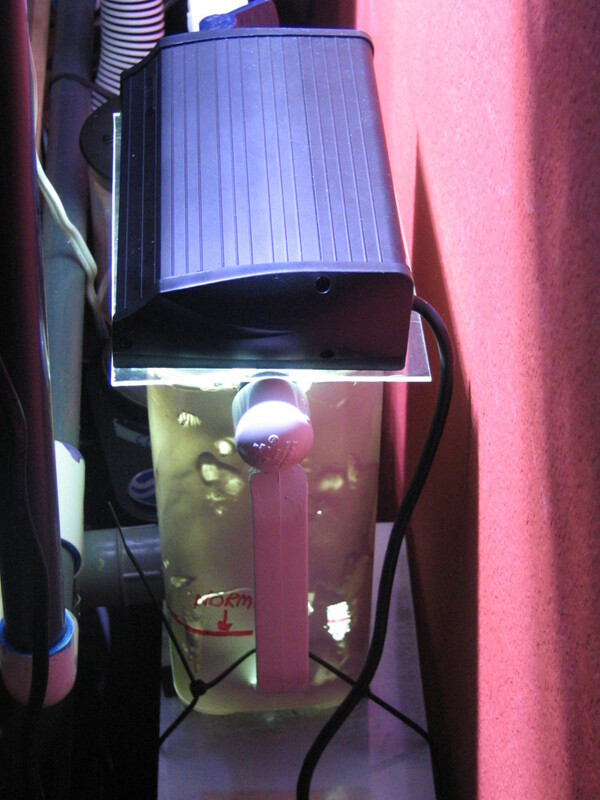 Keifer1122 on the RS site: "Aquapod 12 gallon update: Its been couple days short of a month, and still no water change, my N & P have been at zero for 3 weeks now. 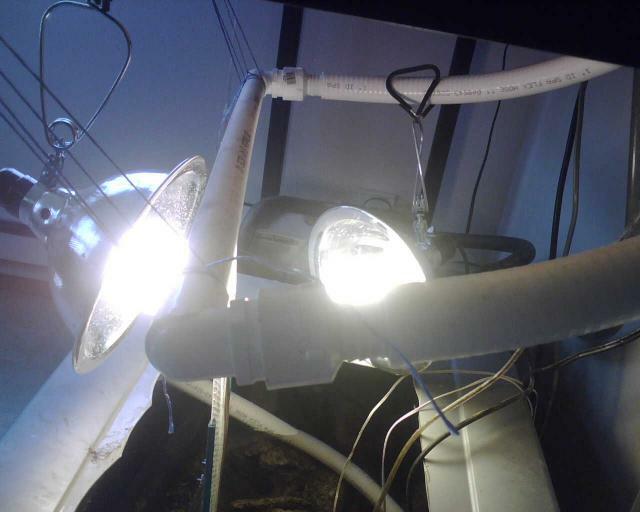 everything is still growing just daily dosing, daily 2-3 feeding times a day, and weekly scrubbing"
bigtanner on RC: "I built this little one for about $65, pump, light, and all plumbing needed. Some people frown on these things and some people praise them. It's about like anything else really. I have had success with mine. 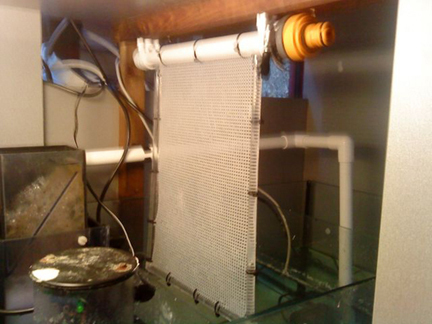 Since building it and hooking it up, my tank is basically algae free. I also went from running my magnet daily to only running it every three to four days. 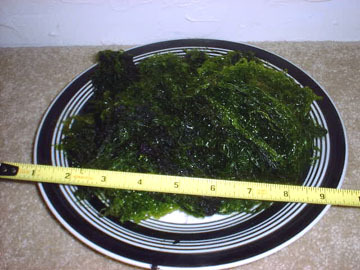 [...] I never have any bad algae in my tank, my water is always crystal clear, and since adding it, I run my magnet a lot less than I used to. 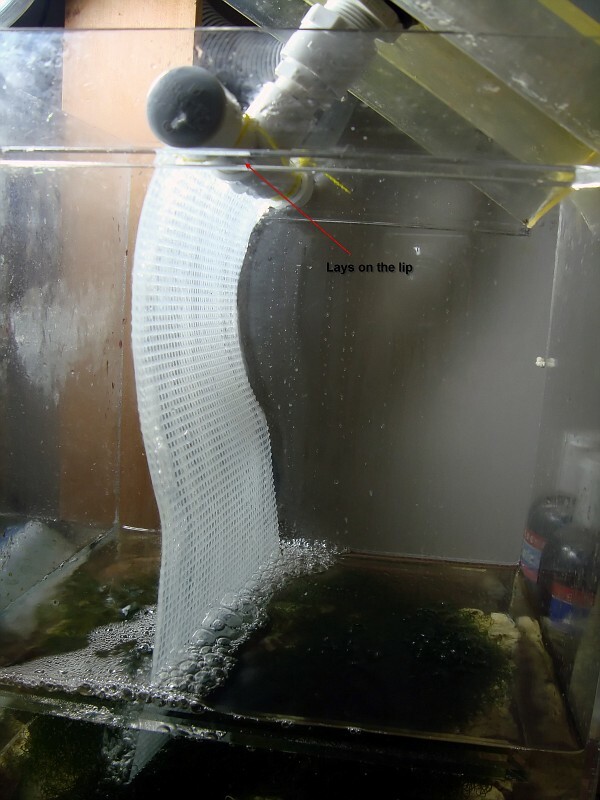 corinna on the AC site: "I started out as a sceptic, but after spending a fortune on phosphate absorbers, carbon, sponges, water changes etc, Im convinced. Two months in, ive not done a water change or cleaned the glass, just to see what happened. 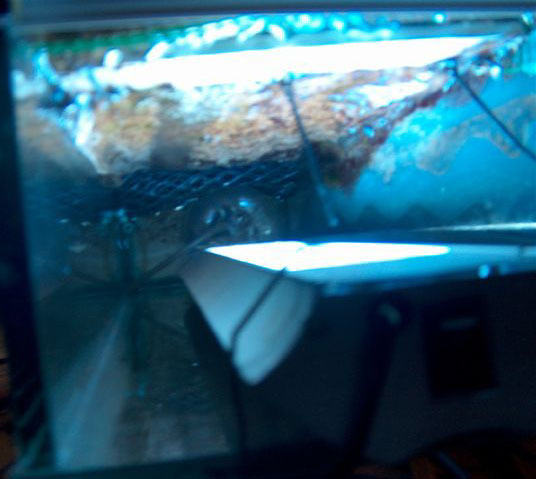 Zooanthids are reproducing, seahorses are fat and active, values are reading zeroes. Scallops are happy. Plus I feed a lot." Well after three months of testing color temps, I've determined that 3000K out performs 6500K. It's not a huge difference, but enough to notice. 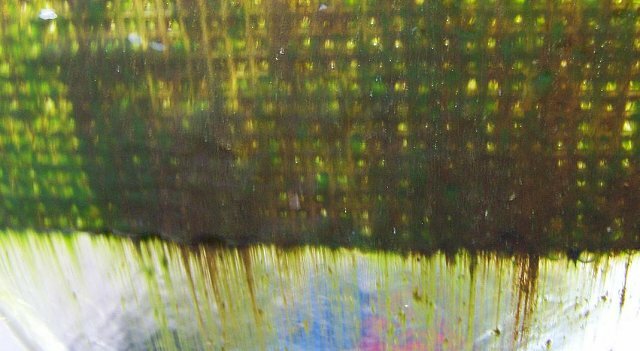 At first they are about equal, but as the green hair gets over an inch thick, the 3000K continues getting thicker until it hits the acrylic wall (at 1.5" , whereas the 6500 stalls and rarely grows enough to reach the wall. 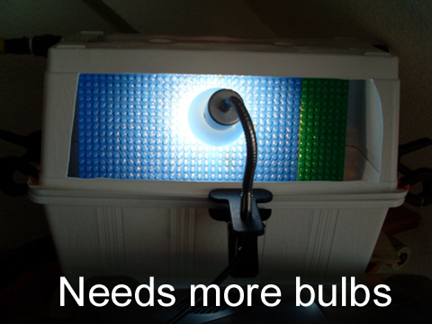 So I'm ordering all T5HO 3000K replacement bulbs.